Everyone likes the seaside. Even the truck loved it. 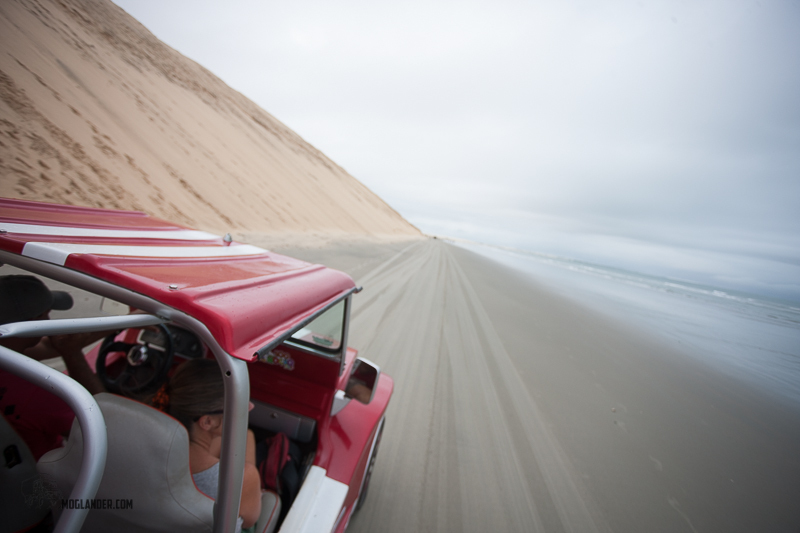 We drove from Belem down as far as Pipa on the Atlantic coast of Brazil. 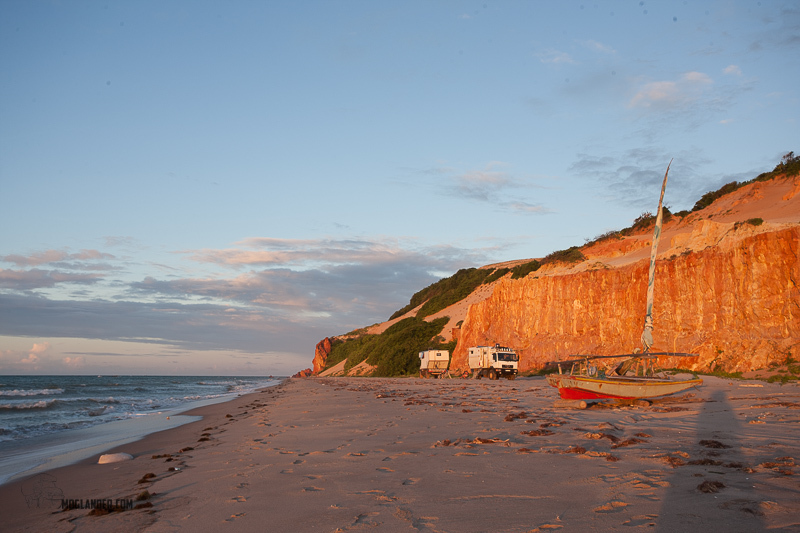 After spending almost a week on the Amazon barge, we decided to take the slower but more beautiful route down the coast, following the beach towns and sandy tracks as much as we could. 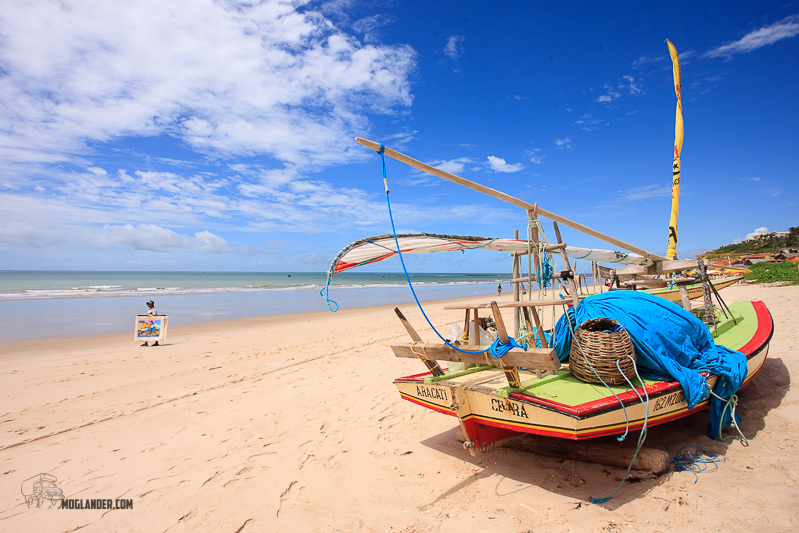 North East Brazil is famous for it’s beaches, and we thought we would like to take a look. 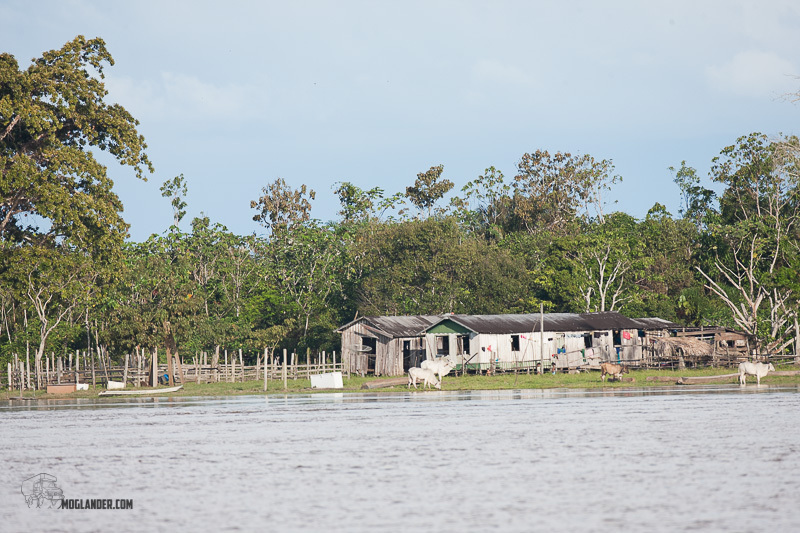 In the amazon we were really hit by the heat and humidity, and were wondering what the coast would bring. 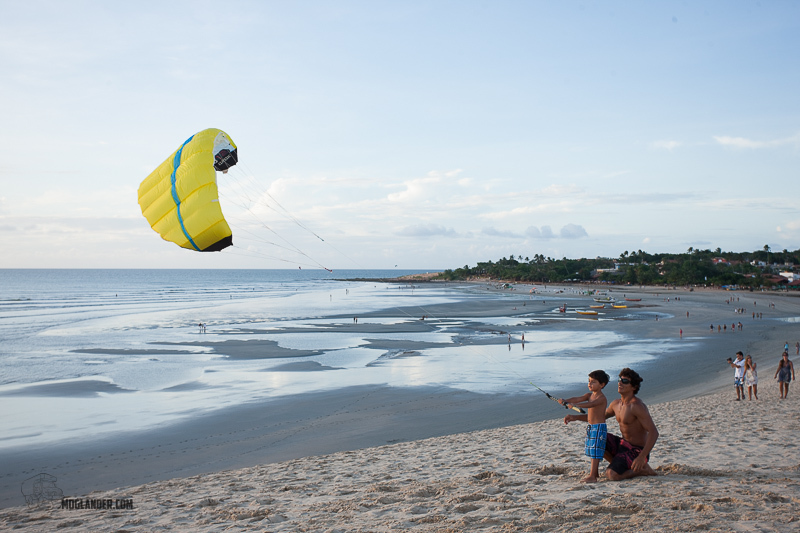 We found great onshore breezes which were most welcome when camping. We had visited Brazil very briefly once before in early 2012, when we visited Iguassu falls. 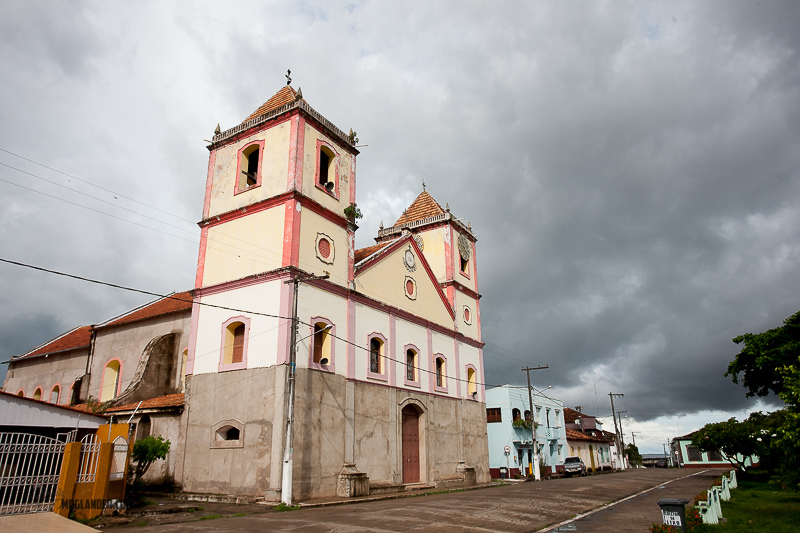 But, that was a good few thousand kilometers from this part of Brazil. That’s right – Thousands of Kilometers away. Probably about 5000 by a direct route, maybe 8000 to follow the coast. This is one seriously large country! Small bridges = big inspection. Our route brought us over a few small bridges. Luckily none that even creaked or groaned, so I’d be happy to say that anyone who wanted to drive this route could do it. We’re probably just over 7 ton and were fine. 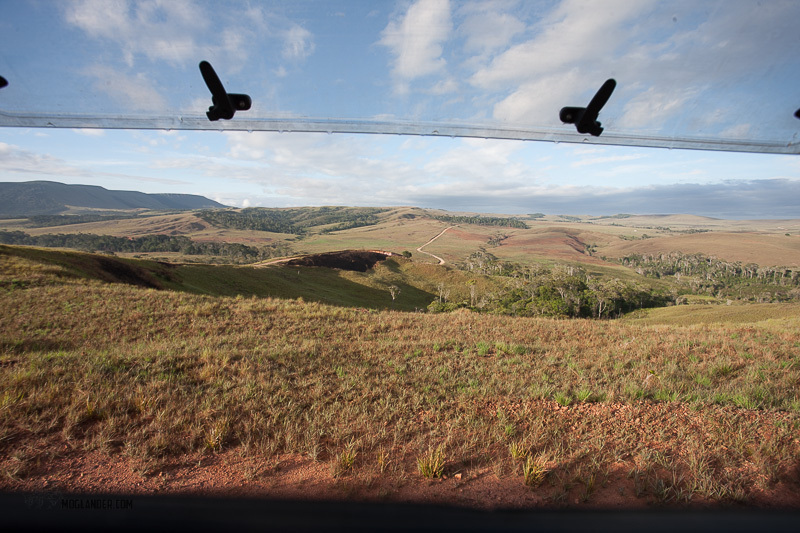 From here, we took a great wild 4×4 route to the town of Paulino Neves. We did it this way as it was about 100km on the sand instead of 500km+ by tarmacadam. No contest! 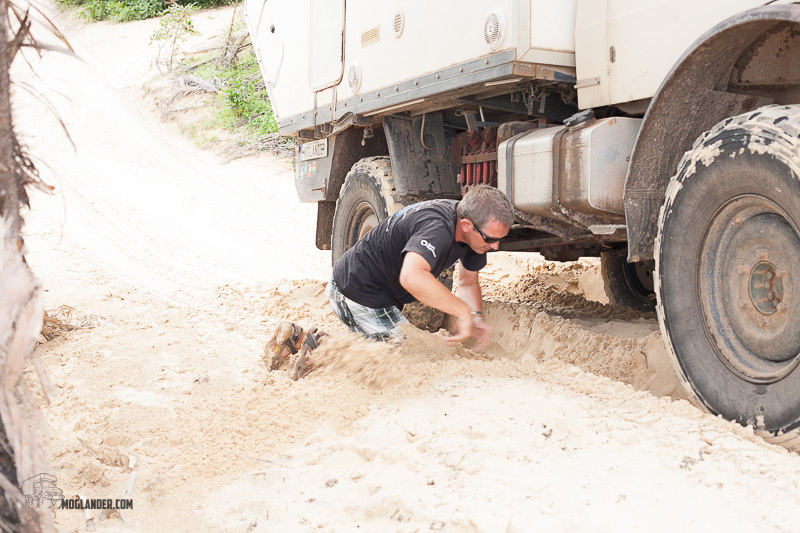 Unimogs, contrary to popular opinion, do not really love deep soft sand. I was not digging out the Unimog, I was looking for my keys…..
We did meet a little traffic on this route, a guy on a tractor towing a jeep of some kind. He was a bit surprised to see trucks out there. Once he dropped of his “client”, we followed him back to town. He gave us a tip for a space to park with just some light traffic. 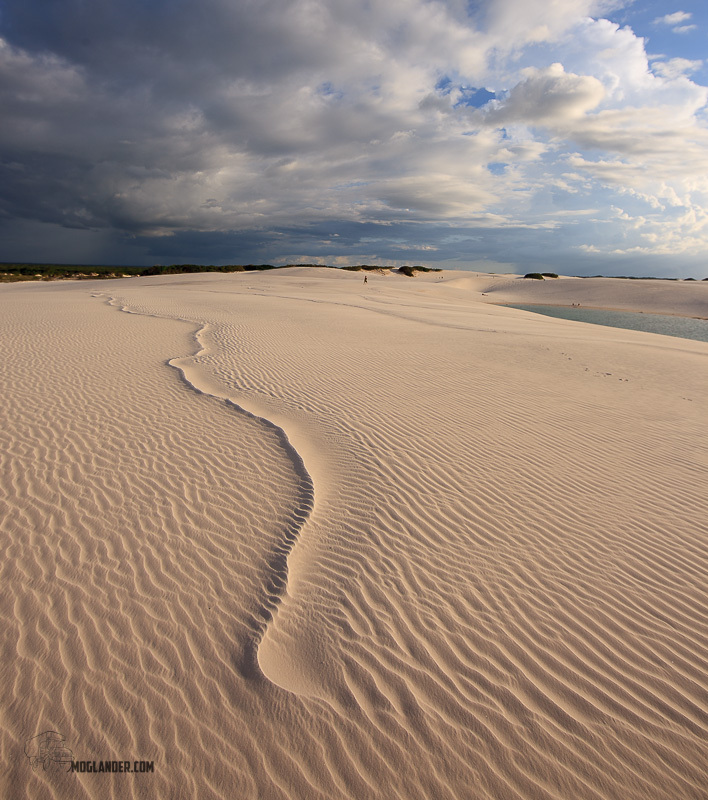 Within 20 minutes wading on foot through these lagoons, we were in some wonderful wild dunes with an impromptu dune bar that arrived at the weekend! The dunes are a great hangout place for people during the day, and strangely, for goats during the night! 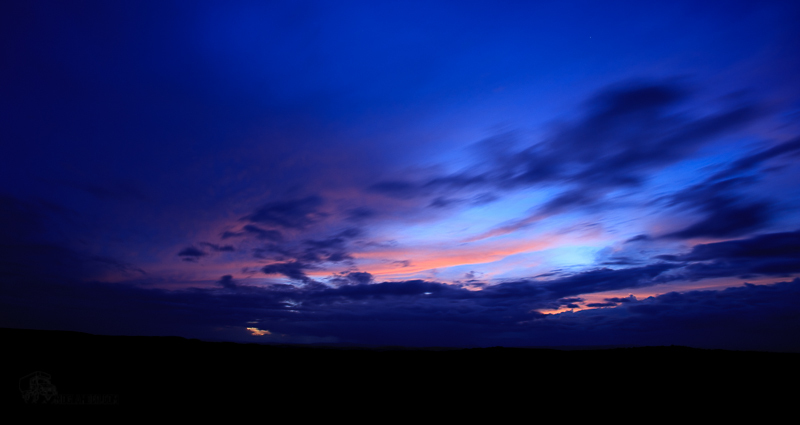 This last light of the day looks like it might have been last light ever. 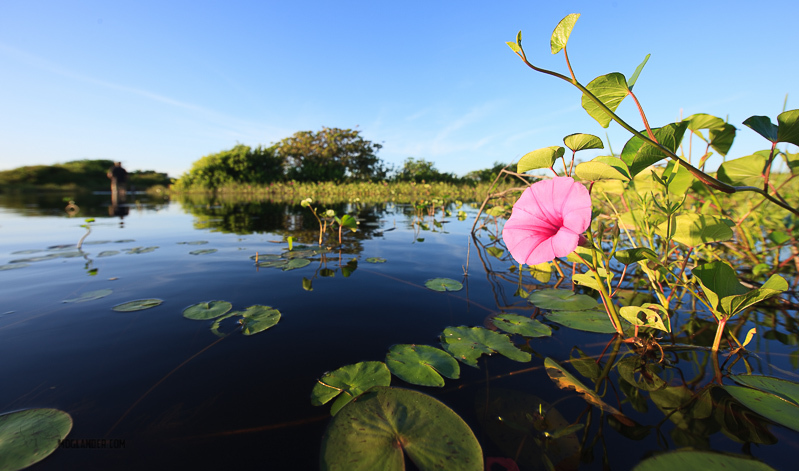 These pink flowers came out at dawn and had disappeared 2 hours after sunrise when it got too hot for them. We ended up staying there for 4 days, but that’s mainly because the next bridge on our route was closed for repair! 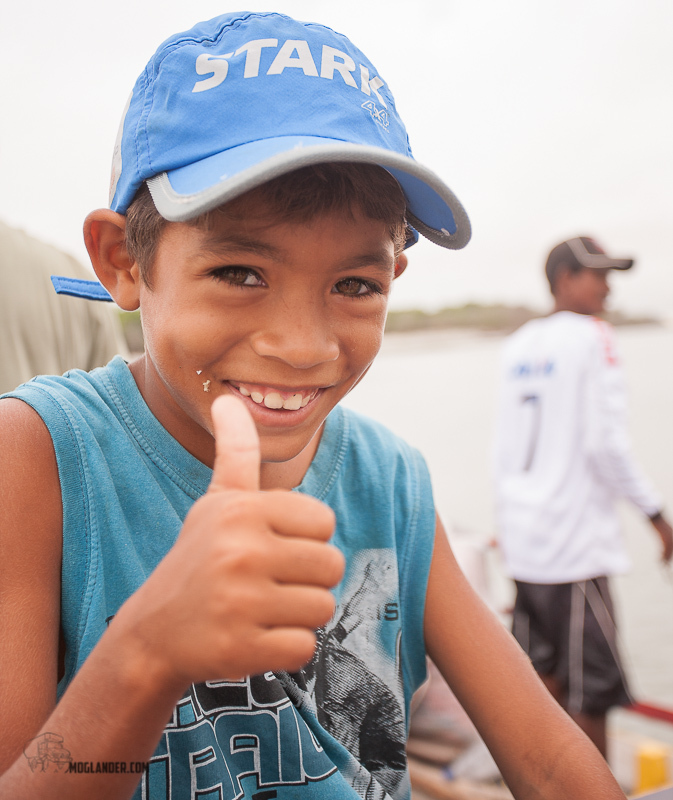 This is a small fishing and farming community, and tourism is a pretty new thing for them. Well worth a stop if you have our own facilities. Once the bridge was fixed we were off again. 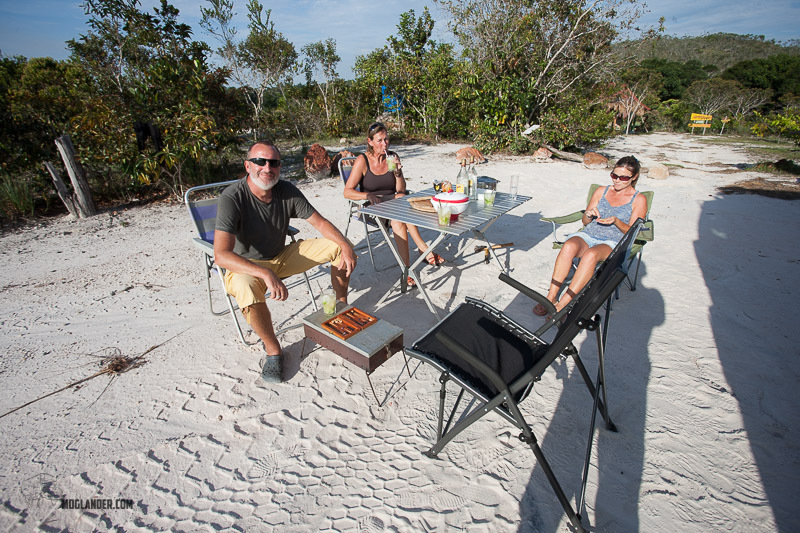 Jeri was a nice spot to stay, we camped in the car park as no cars were allowed into town, just beach buggies. At night the atmosphere was superb, live music, great shopping and cool spots just to hang out and have a beer. The central streets are still just sand, even some shops and pubs. They got it right! 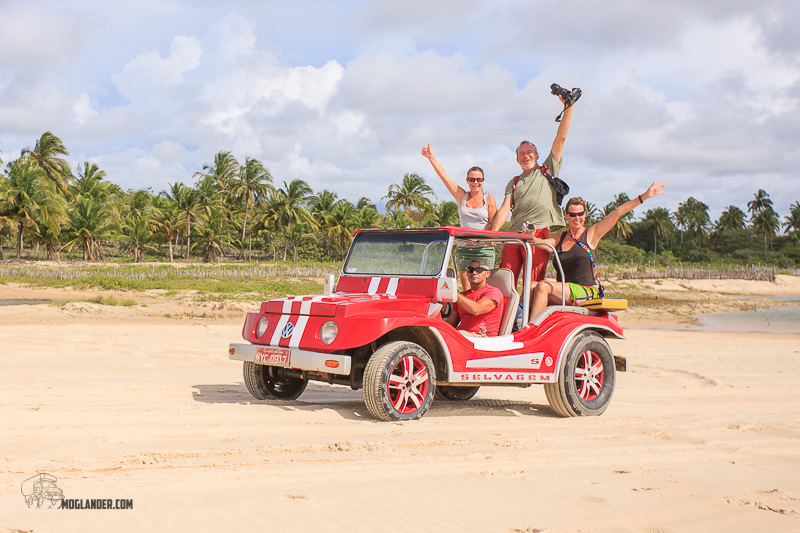 Dune buggy about to cross 4 inch deep water…. Ever eat fish in a restaurant, while other fish nibbled your toes? Grilled red Snapper. Best we ever had – big enough for 4. We moved on from Jeri along the coast to Pipa, stopping off here and there. 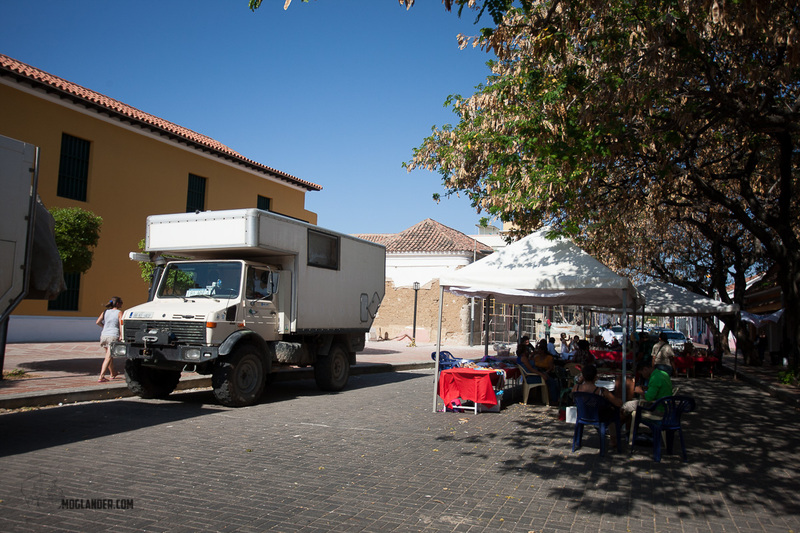 Some of the little spots did not have vehicle access, you had to take a bus, hike, horse and cart or even a boat in the case of Galinhos. You do not see to many foreign tourists in a lot of these places. 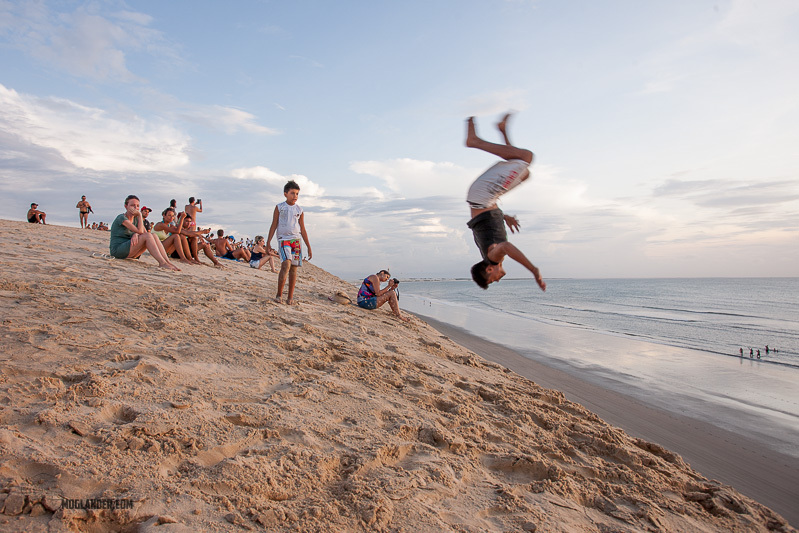 Definitly they get Brazian visitors, but they are not on the main backpackers or “must do” circuits. That made them nice, and they were all very welcoming to us. All along here we were made to feel very welcome, and very safe. After some rains, the route got interesting. 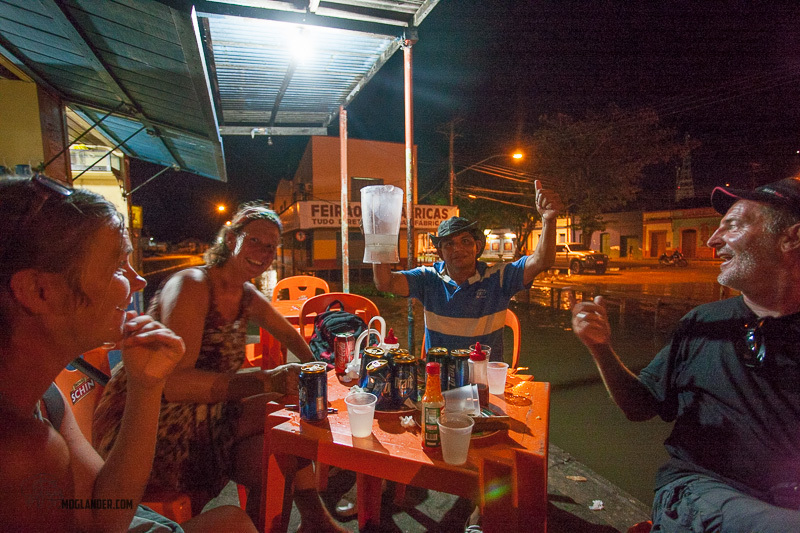 This route brought us all the way to Pipa, a really cool surfers town, and a great place to watch the World Cup! More next time! Sarah in charge of the barge. We have been on beaches, in deserts, on salt flats and high in the Andes mountains. 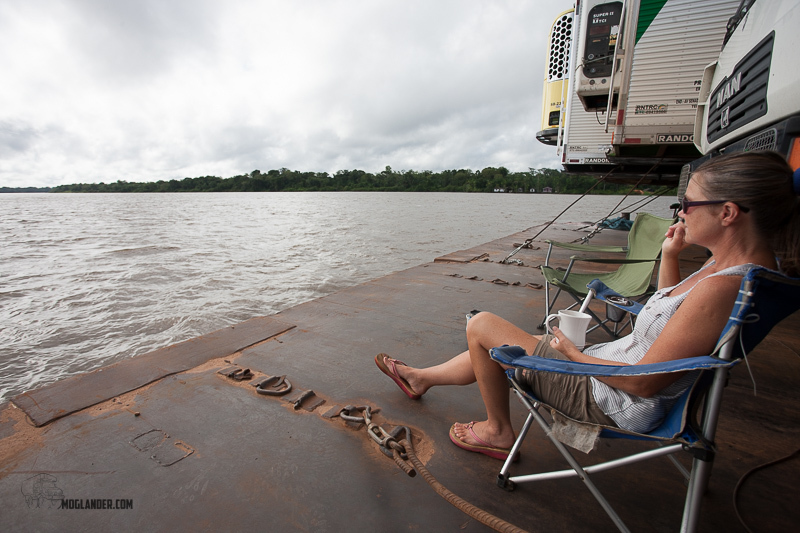 but we had yet to take a barge down the Amazon with our truck. 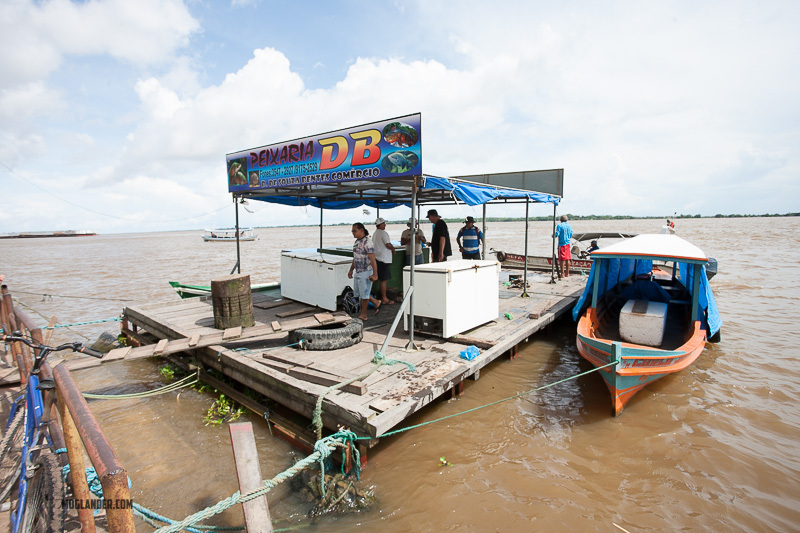 We knew this was the plan as we traveled from Venezuela to Manaus where we hoped to find a barge to get us to Belem. 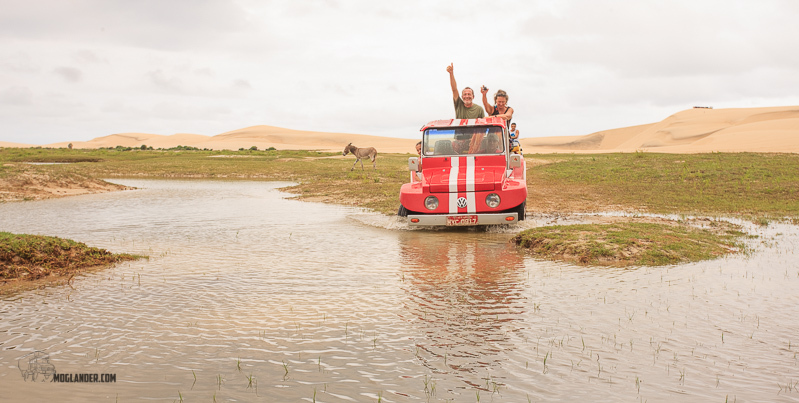 It is possible to drive south BUT only with a lighter vehicle or a motorbike. 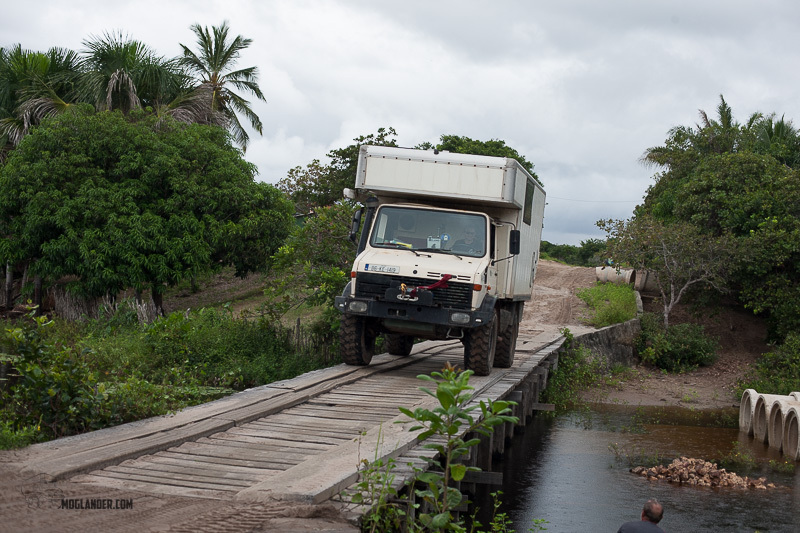 Our truck could not cross the dodgy bridges on the only road south, the BR319, so it was the barge for us. 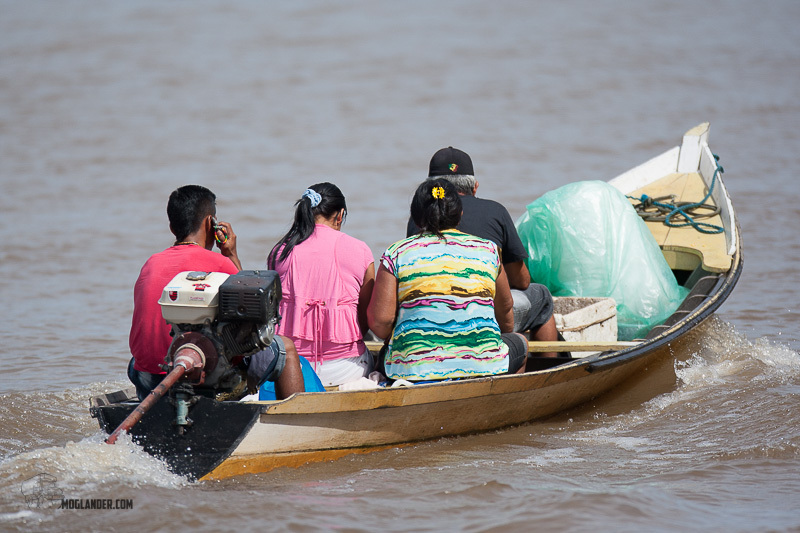 It took us a couple of days to get to Manaus from Venezuela. 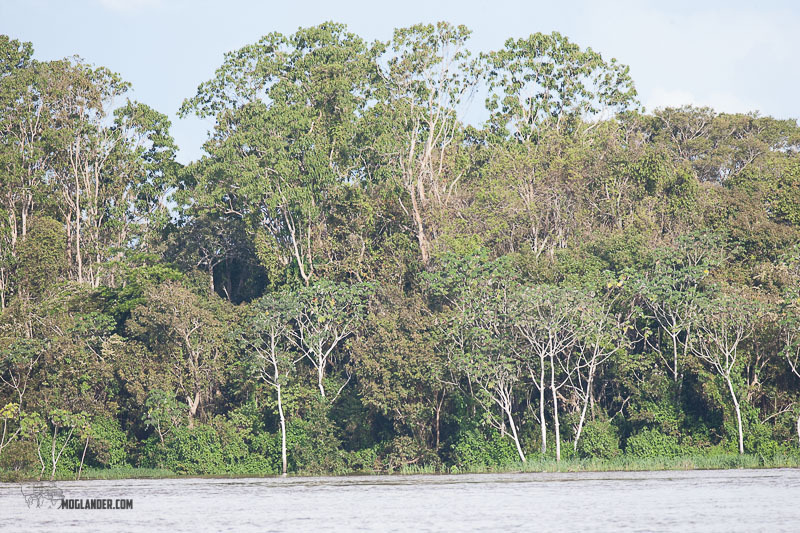 We quickly dropped down from the few hundred meters altitude that it was in the Gran Sabana to almost sea level in the Amazona region and immediately the heat and humidity went off the charts. Not nice! 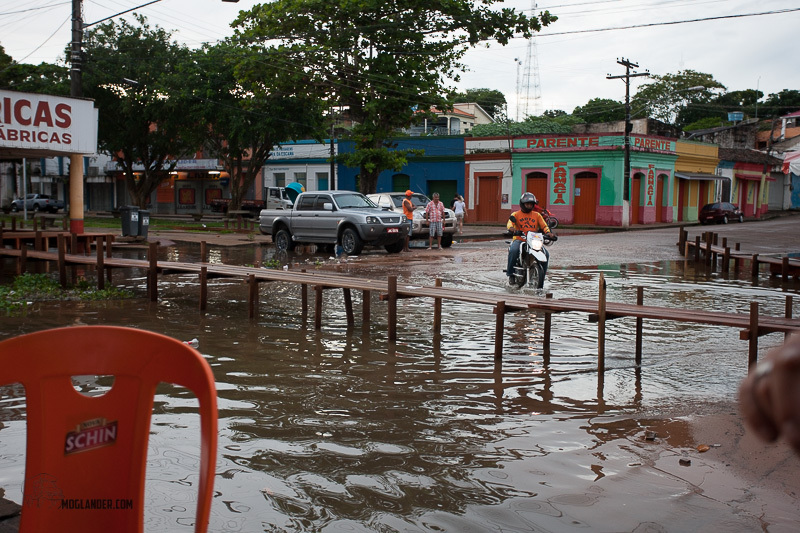 I have no idea how they are playing soccer in the world cup in Manaus, it cannot be easy! 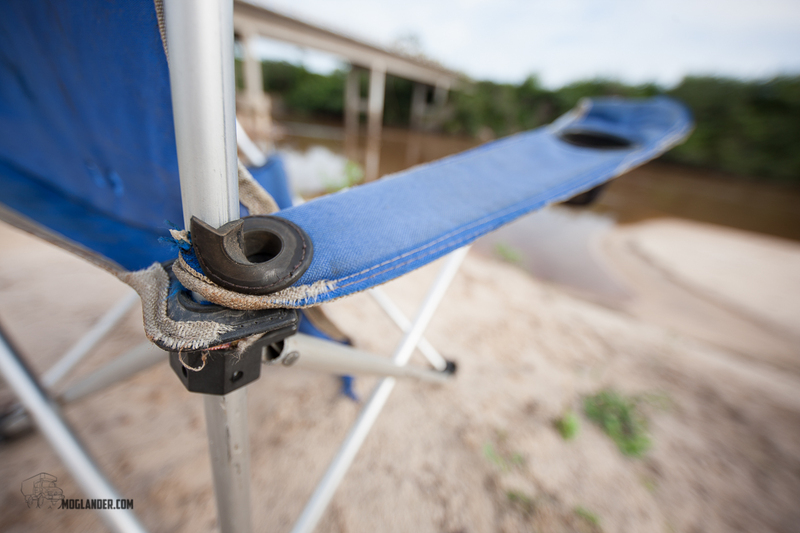 We had a bit of rain, but we got a great place for overnighting. Camping at the parish hall. Many of these community halls have no walls, and if you ask nicely, they make great overnight stops when it’s raining. 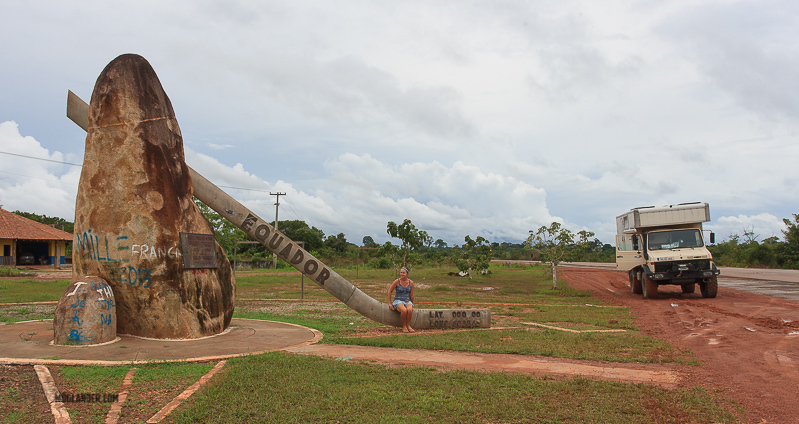 Crossing the Equator. Going South this time though. 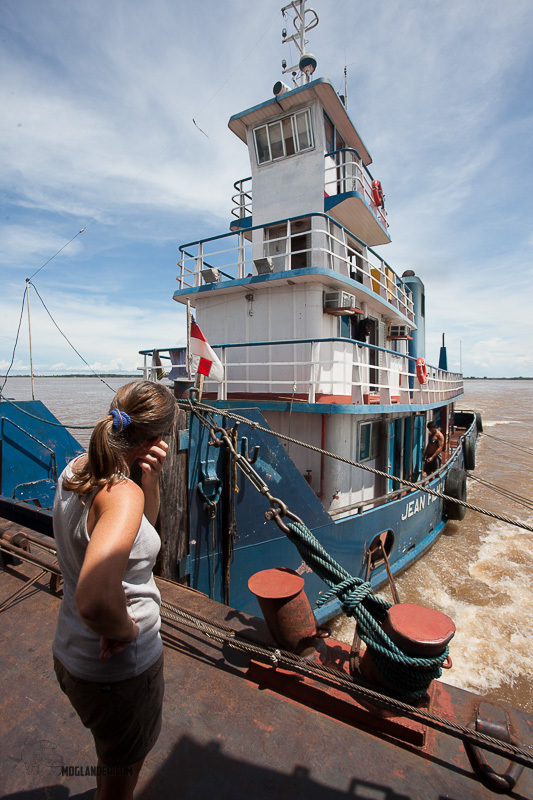 Once we got to Manaus, we tried to sort out the barge, and almost booked ourselves onto a passenger boat that could take the trucks up the front. 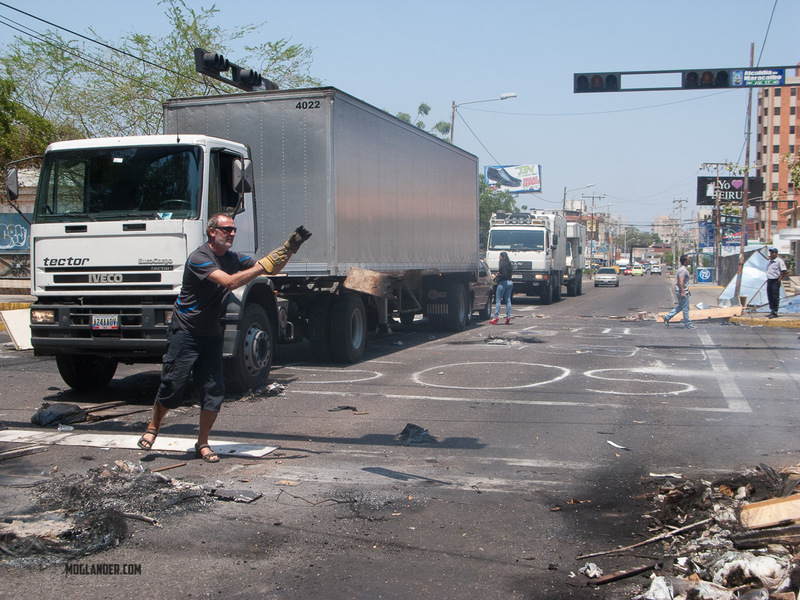 This may have been ok, but pure hell as I gather it’s loud music and parties for 5 days straight all the way to Belem. No pauses even for a bit of a hangover! Manaus itself was ok for a day or so to look around. 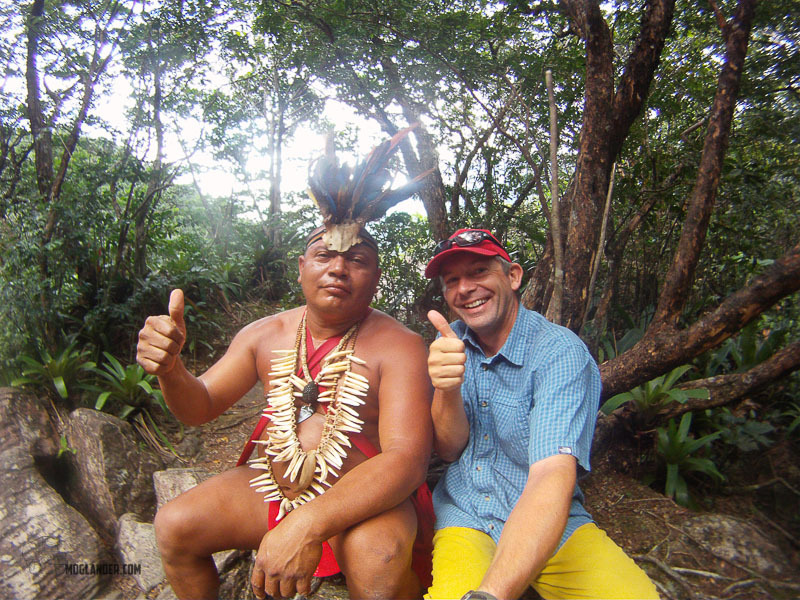 There were loads of jungle tours you could do, but since we had previously visited the Jungle in Bolivia and in Peru we thought we would keep on going. 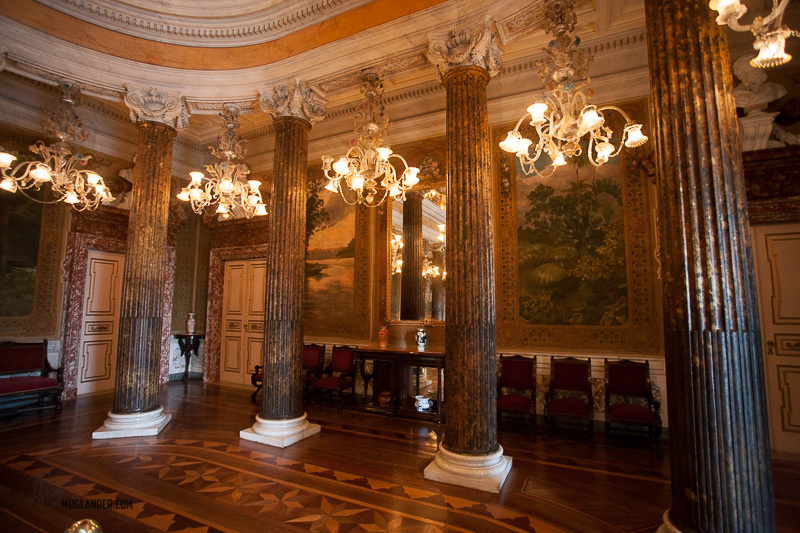 The opera house in Manaus is very impressive. 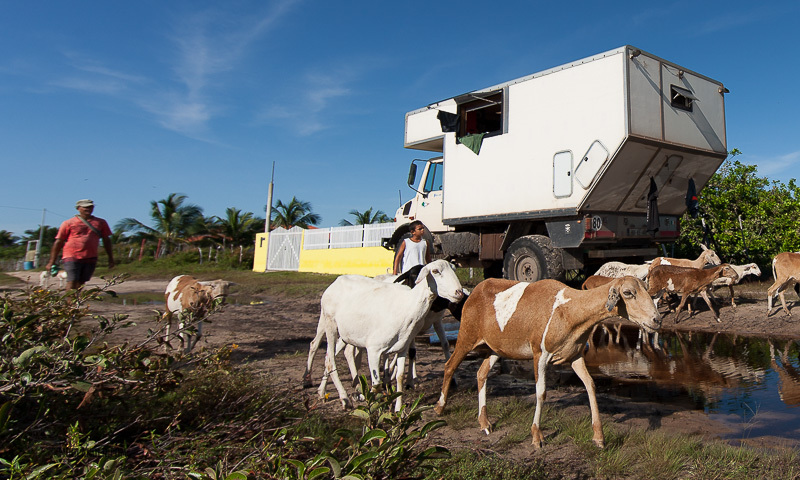 Our ticket cost us about $1,000 for the truck and us to Belem. 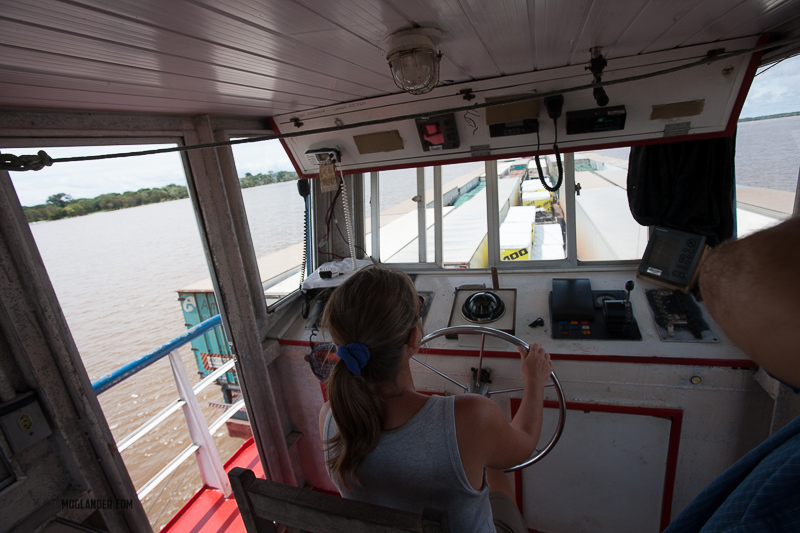 The only problem we had was that at boarding time, the officials told us there was a rule that no women were allowed on the barges, a rule introduced in early 2014 following an incident involving a bunch of truck drivers, a woman and way too much alcohol and time. We managed to talk our way on, and once on board it was no problem at all, everyone was very friendly and there was NO hassle at all. Once we were out on the water, life was great. 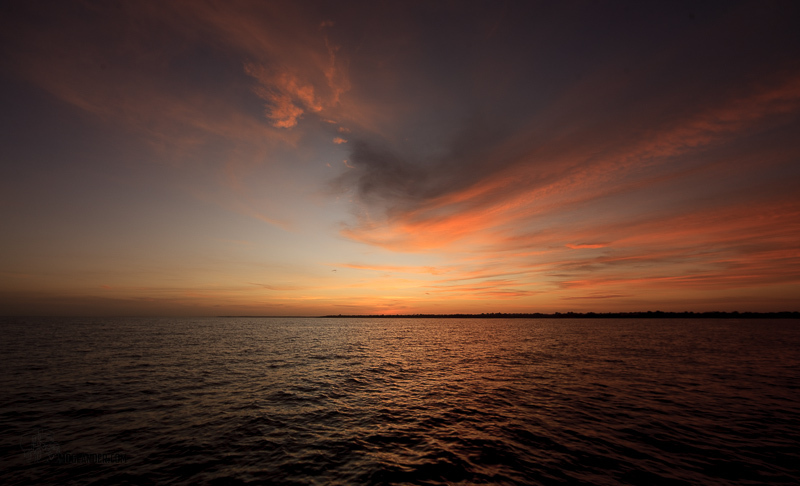 We sailed day and night, so we always had a breeze except for 1 pause of about 12 hours (more on this later). We managed to get loaded last, which means we were at the very front of the barge and furthest from the pusher boat. 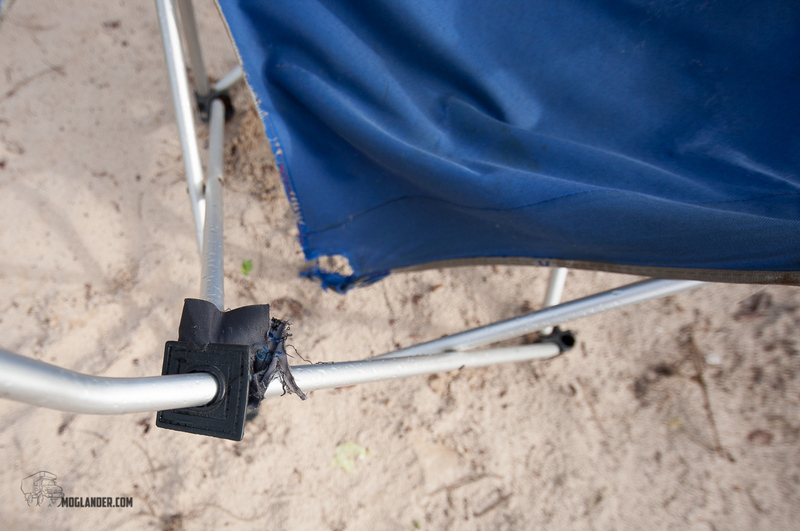 This meant we had most of the breeze, and none of the noise. Perfect! We kept an eye on the world going by, and realized they were also keeping an eye on us! 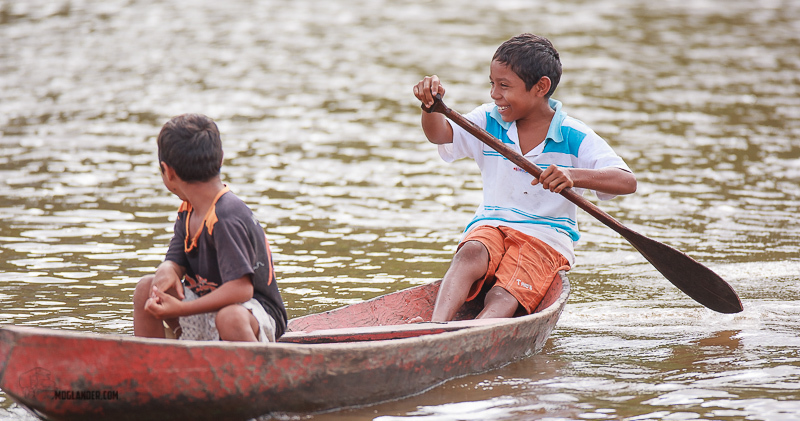 Kids playing in their boat on the Amazon river. Mum and kid coming to the barge to trade. On the barge, the price did include your meals, but we opted to cook for ourselves. This may have been a good idea as there is only so much beans and rice that we can handle in a 5 day period. 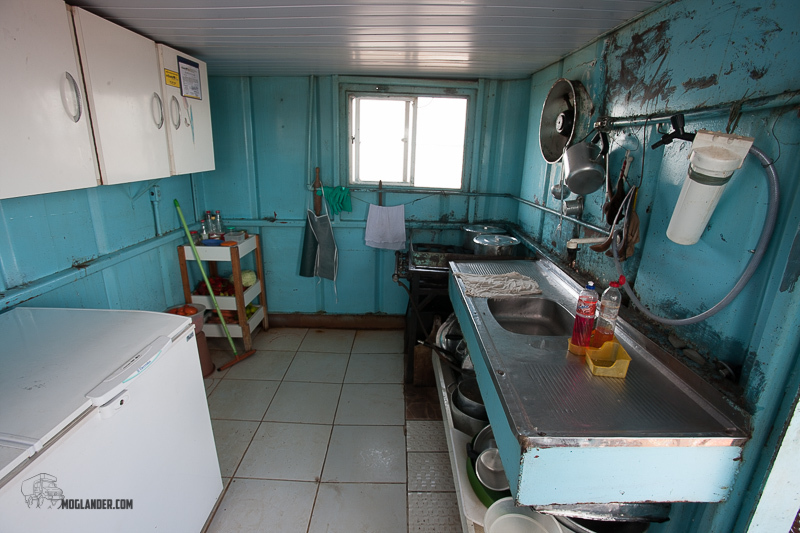 Amazon barge kitchen. Just for you Peter so you do not get confused. The pusher boat attached to the barge. The wheel house is at the very top so you can steer by looking over all the trucks. 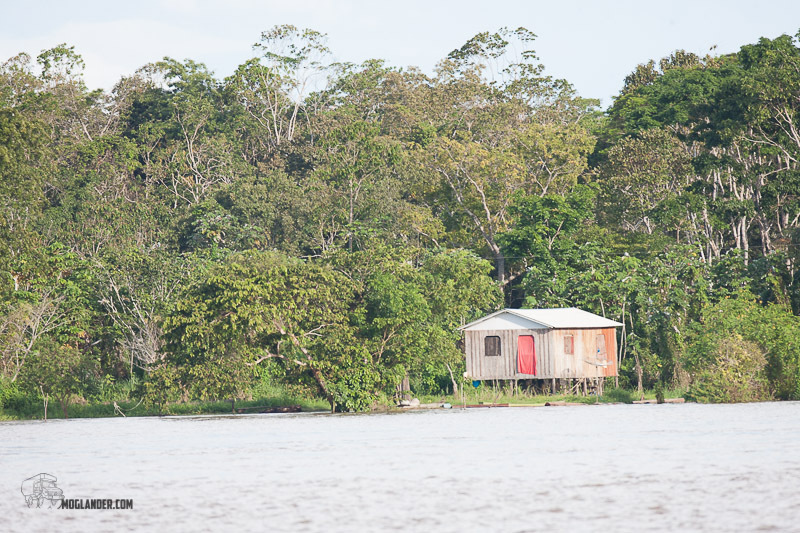 Little house tucked away under trees on the banks of the Amazon. 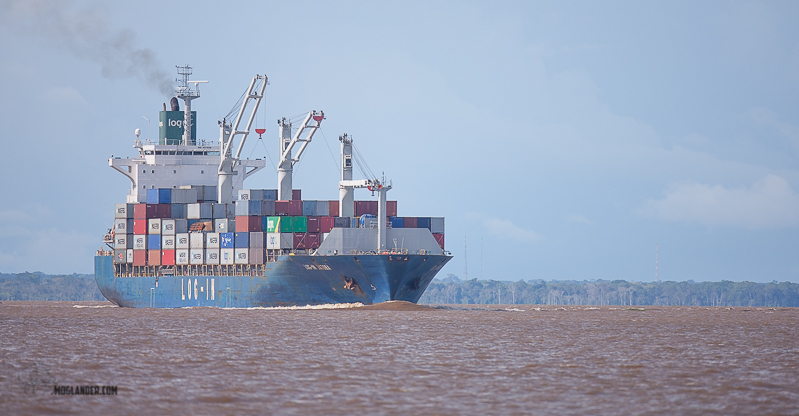 As well as canoe’s we saw some very impressive ships on the Amazon. 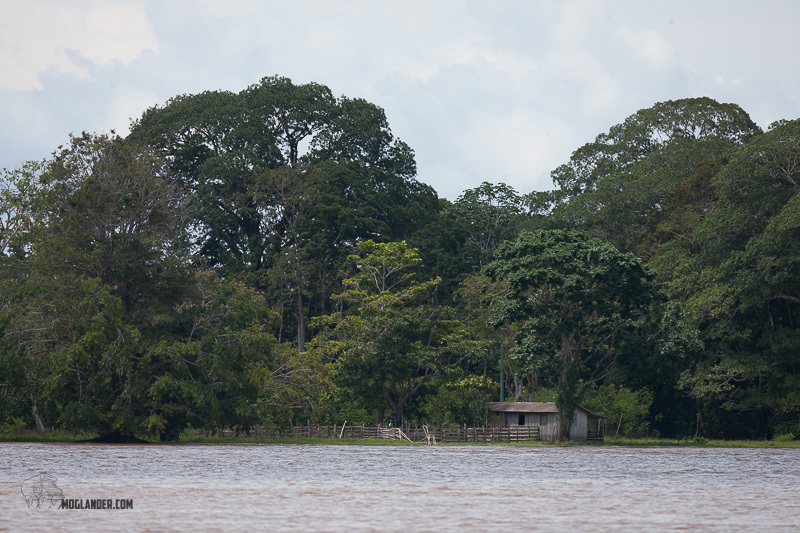 Amazon riverbank. We saw a LOT of this. 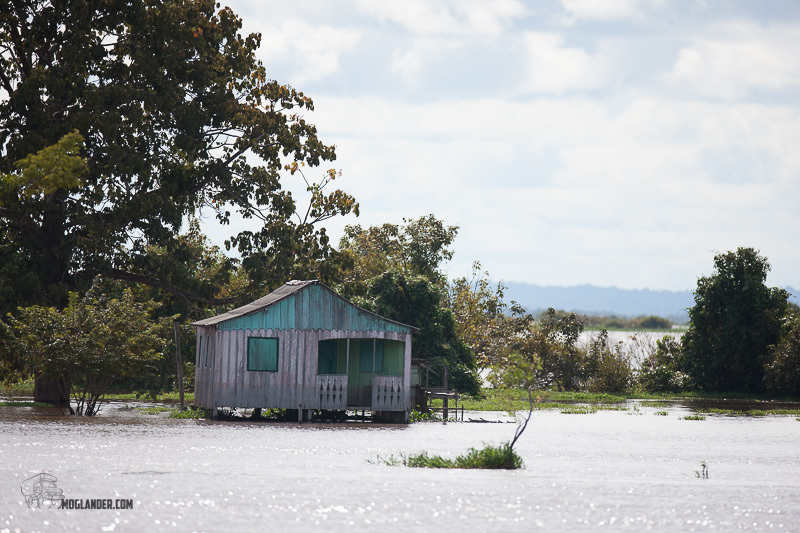 Houses and sheds on the Amazon river banks were sometimes in the water on stilts. Dinner. Showing how much space we really had. 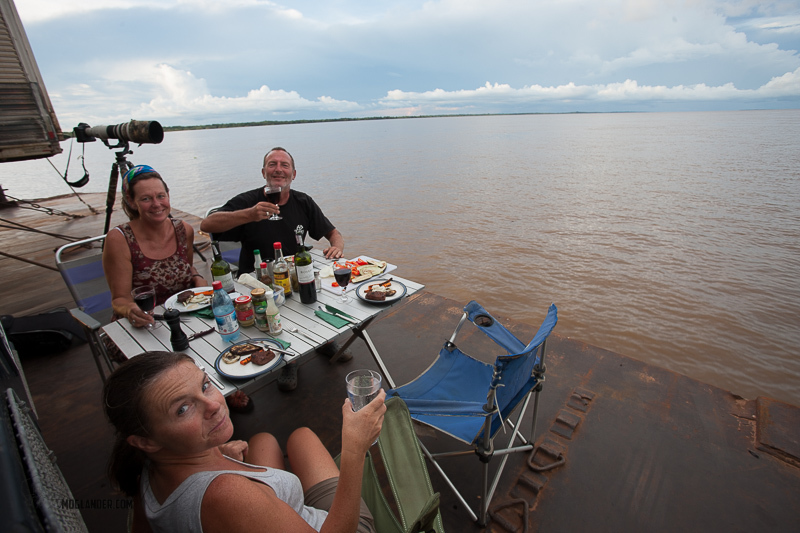 Dinner on the Amazon. 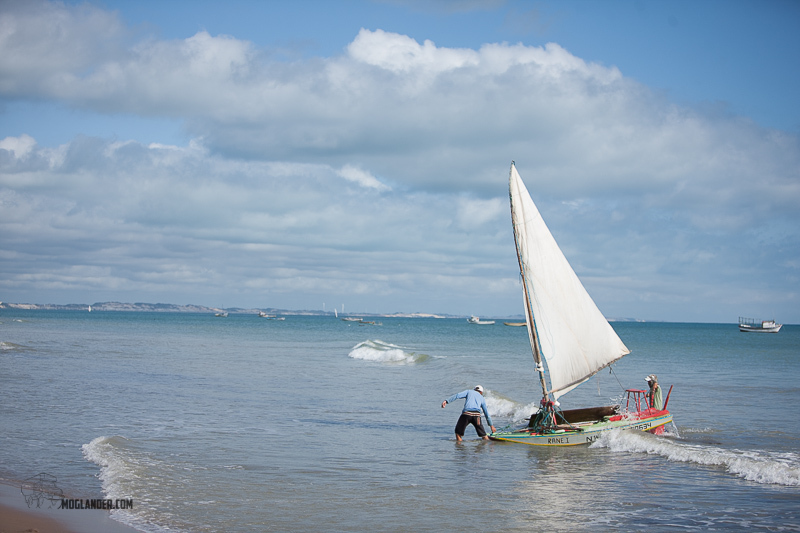 Picture this while sailing along at about 20kph to give a gentle breeze. Perfect. The folks on board were great. Even through we had no Portuguese, we managed to understand enough. 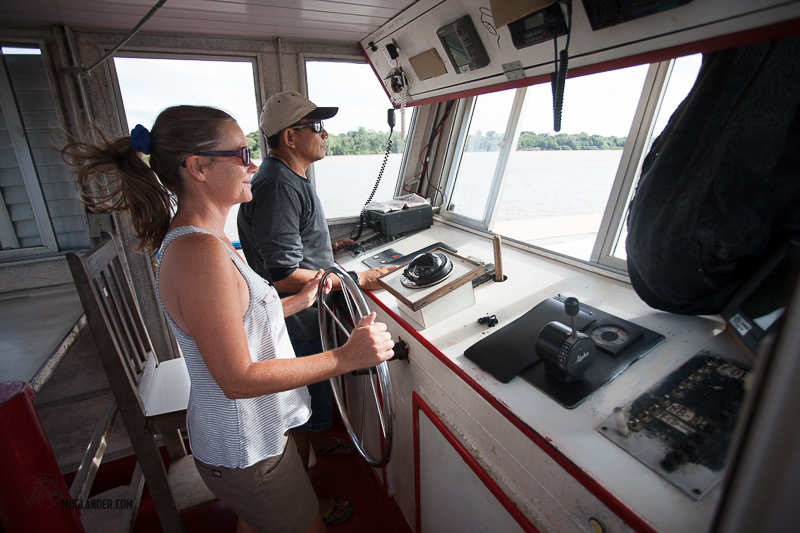 First mate on our barge. 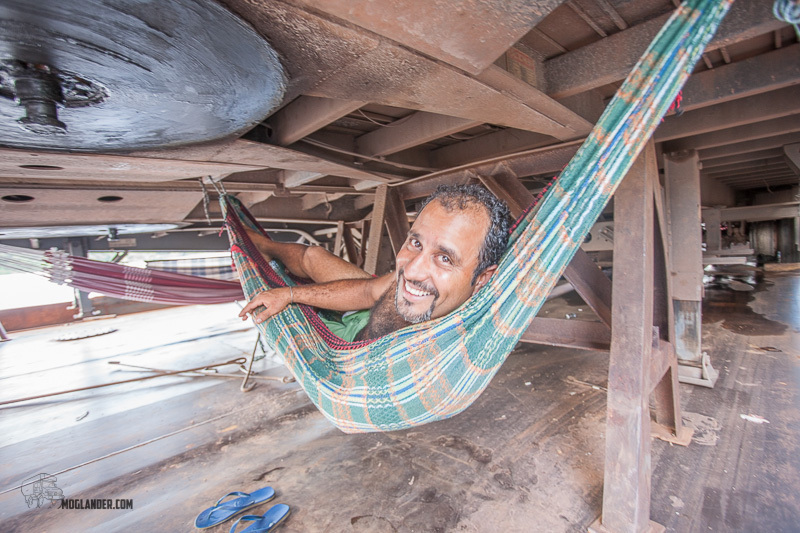 Brazilian truck driver relaxing out of the sun under a trailer. We did make a 12 hour stop, something about not wanting to go through a certain police checkpoint while it was open. We didn’t understand completely, but just went with it. It did mean we got to visit a little town in the middle of the amazon region which was great. Our captain went into tour guide mode and we had a great few hours out. Riverfront bar where we had our first drink. The start of our demise. The ice factory was pretty much flooded. The new and the old, this hardware store in Obidos had an ancient cash register, and a computer. 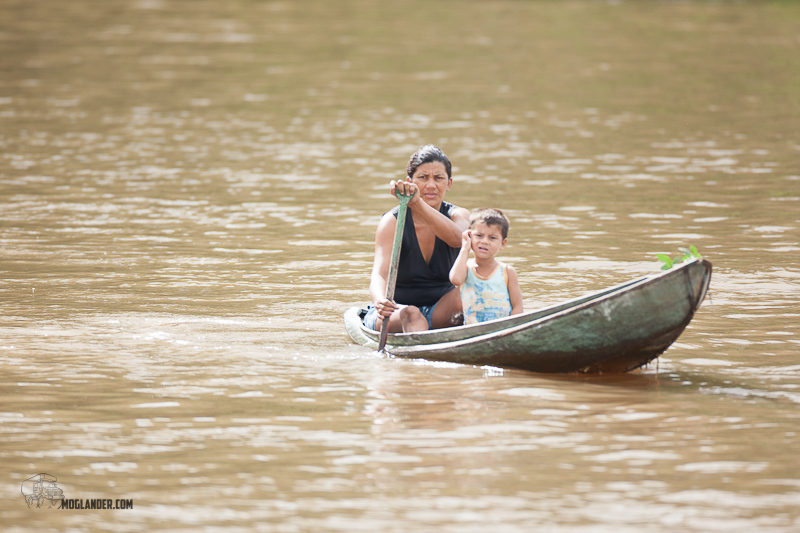 School buses are a little different in the Amazon. A riverfront bar to relax at – why certainly sir! 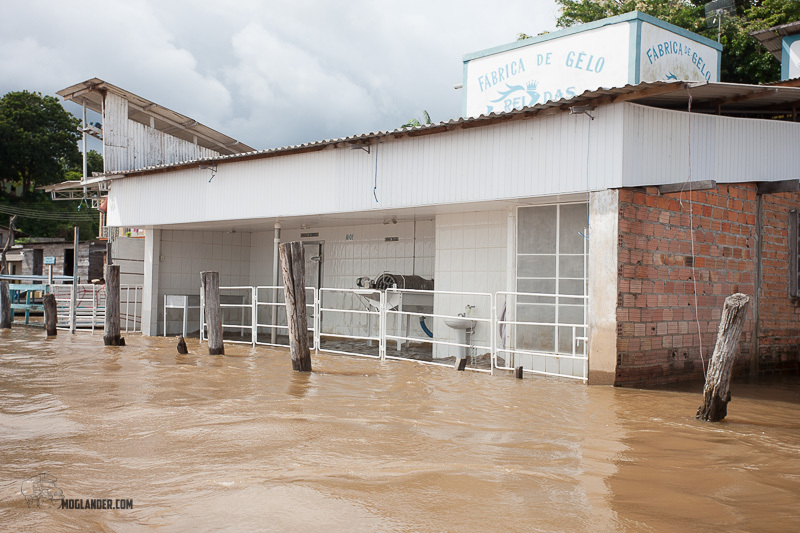 The Amazon river does indeed flood, and gets pretty high in the town of Obidos. Once the sun went down, a little bit of sailor style drinking began. Oh dear! 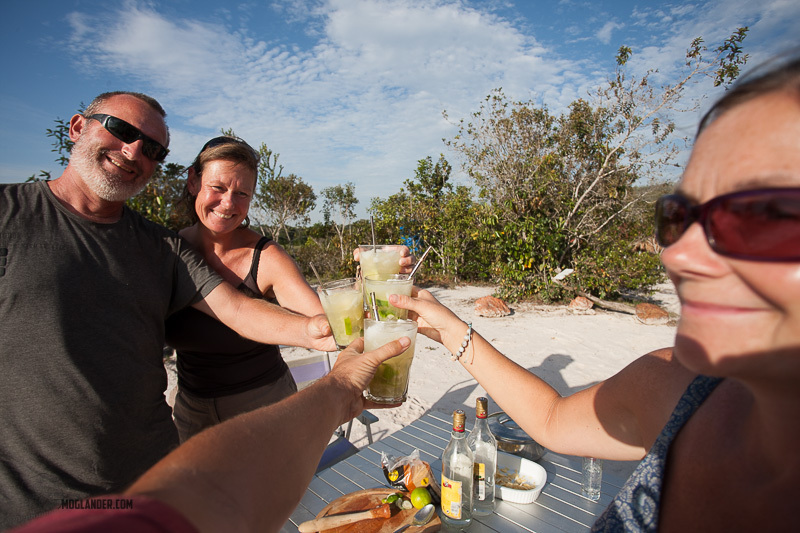 For reference, a Caipirinha is a pleasant refreshing beverage when made correctly. 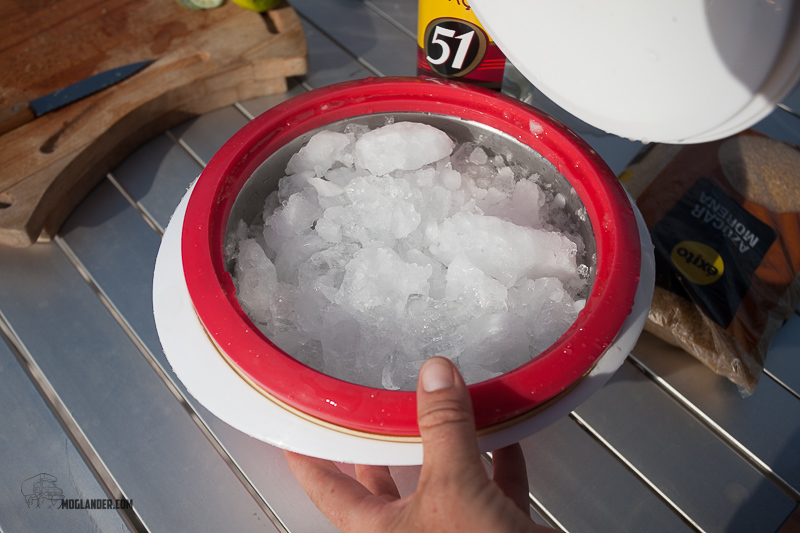 When it’s made with sugar, 2 squeezes of lime and in 1 litre jugs, it is LETHAL! After our town visit was done, a few casual beers seemed like the thing to do. 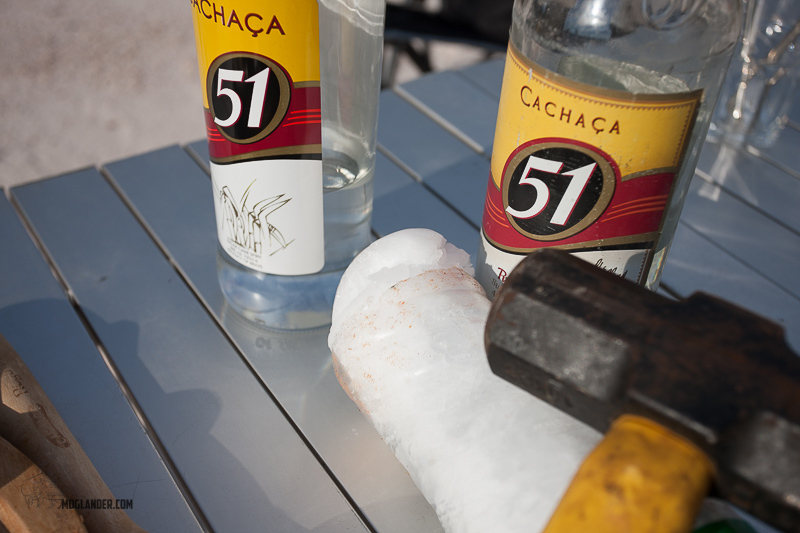 After the beers, the jugs of Caipirinha started to flow. Many jugs. the camera was put away around about then. Sarah in charge. What else is new? 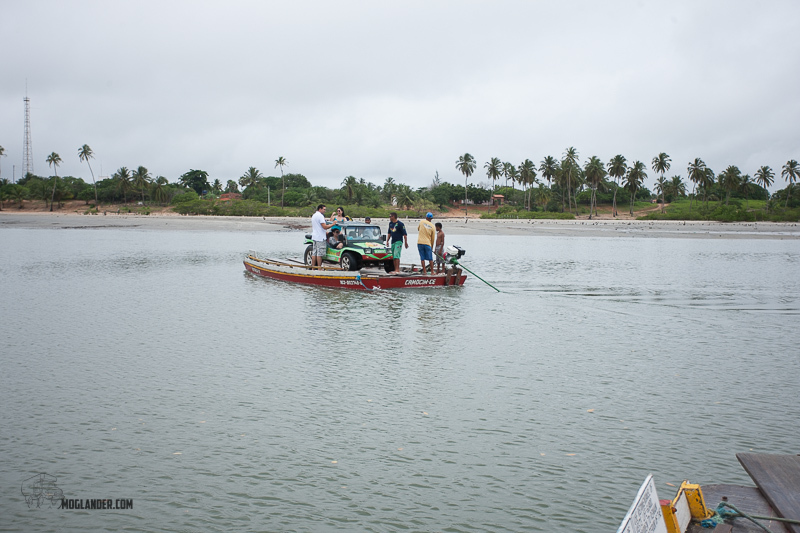 Small boats come along side to trade goods with the truck drivers. 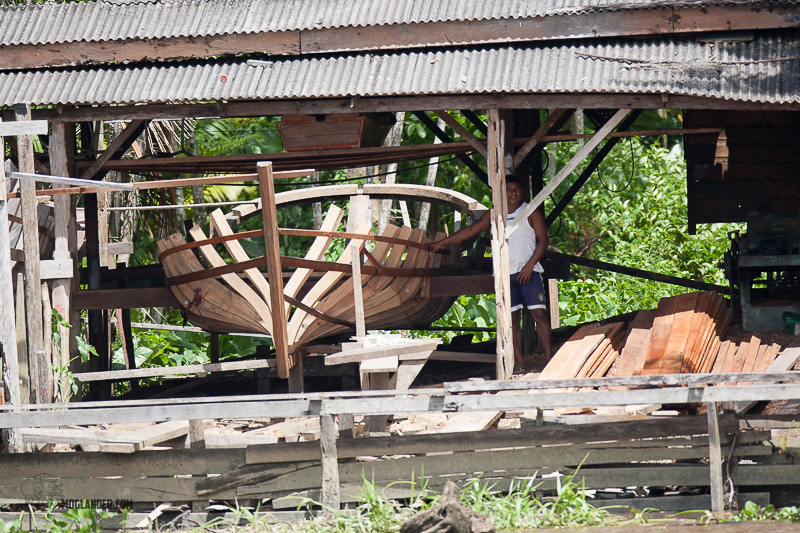 Boatbuilding was visible on the shores in a few places where they still had big trees to get the timber. Backgammon time! Not a bad setting for a match. And for those that want to get a good look at where this is, This map shows our route in Blue. 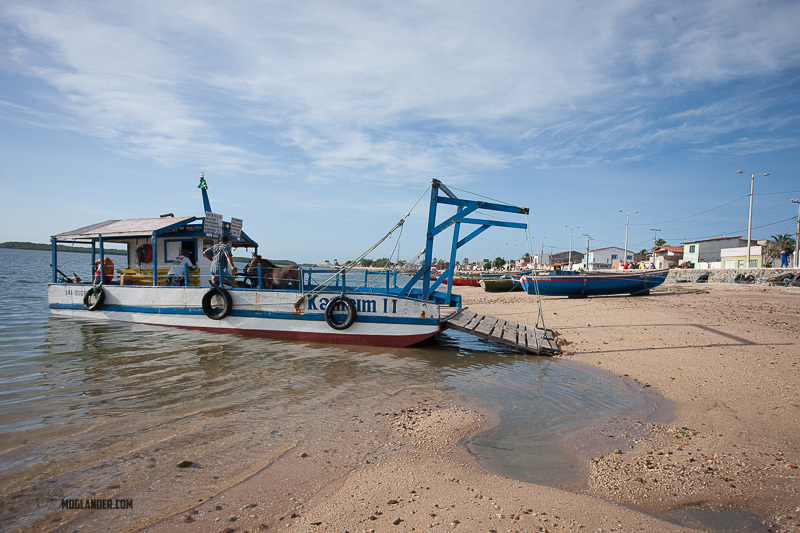 After this, it was off to see the famous beaches of Northern Brazil! 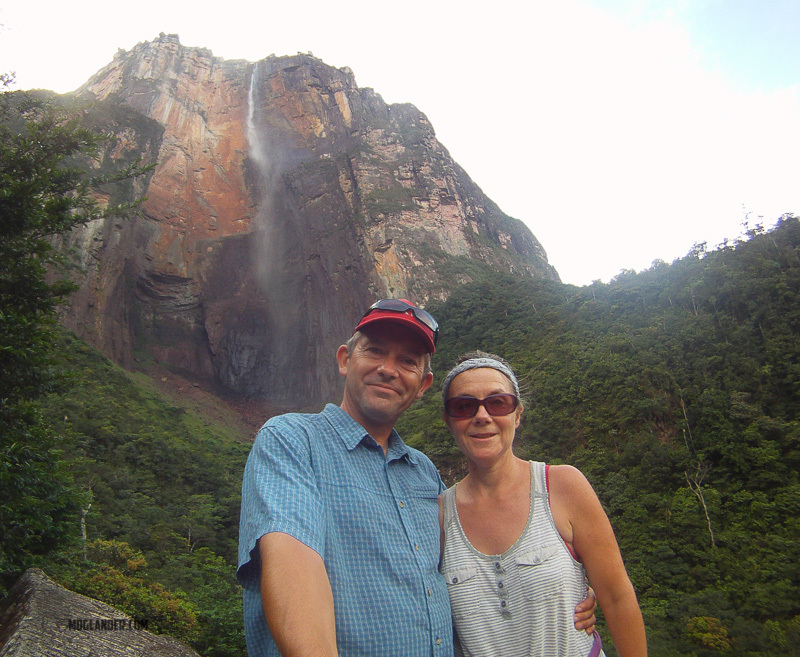 After Angel Falls, we did not think that the last few days of Venezuela travels would amount to much. 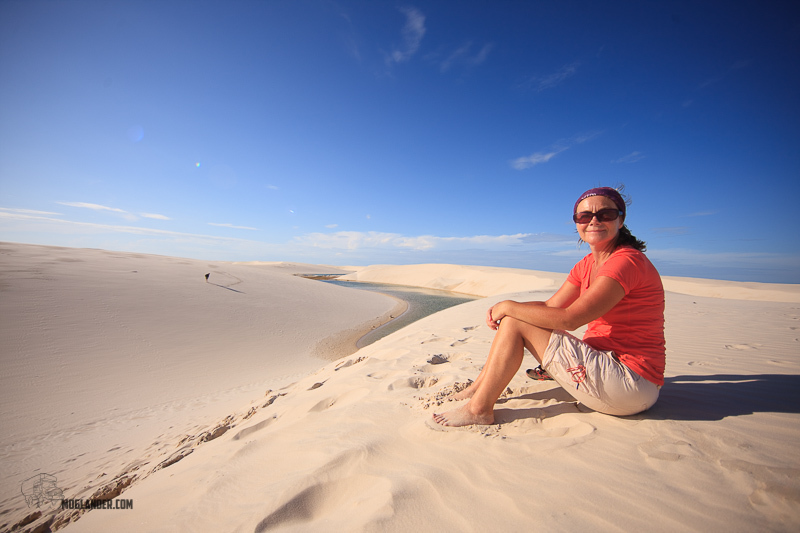 We were so wrong, the area just north from Brazil is superb for overland traveling. 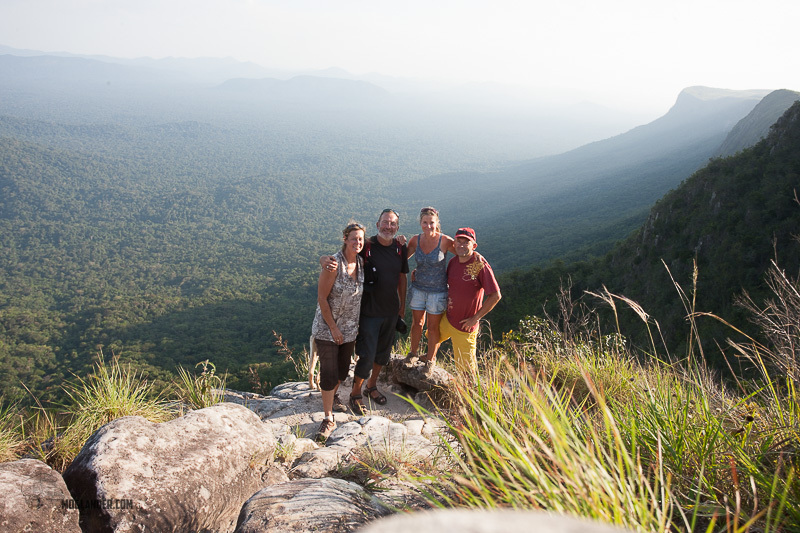 The area is called the Gran Sabana, and while it’s largely a flat area, it holds some stunning table top mountains and waterfalls that you can visit, and you can camp in indigenous Indian villages. Mind you, these villages looked like any other, but the people were certainly the friendliest we had seen and the most open. And had no worries in asking for any old clothes or tools that we might have that we might not want. 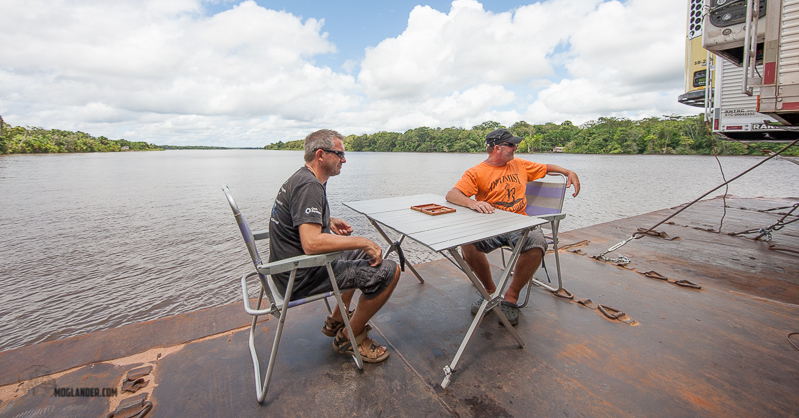 We also got to repair a boat for some Indians, they had mainly got older timber boats, but had one aluminium one with a few bad cracks and holes. 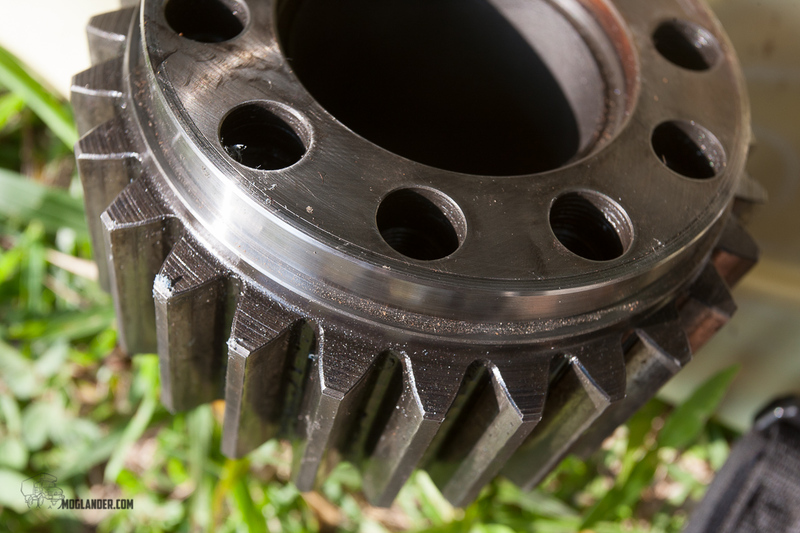 since we carried some silicone, drills and a pop rivet gun, we managed to patch it up for them. I got a gift of a blow pipe with a few nice darts for my efforts! I’d love to know if the boat is still floating! 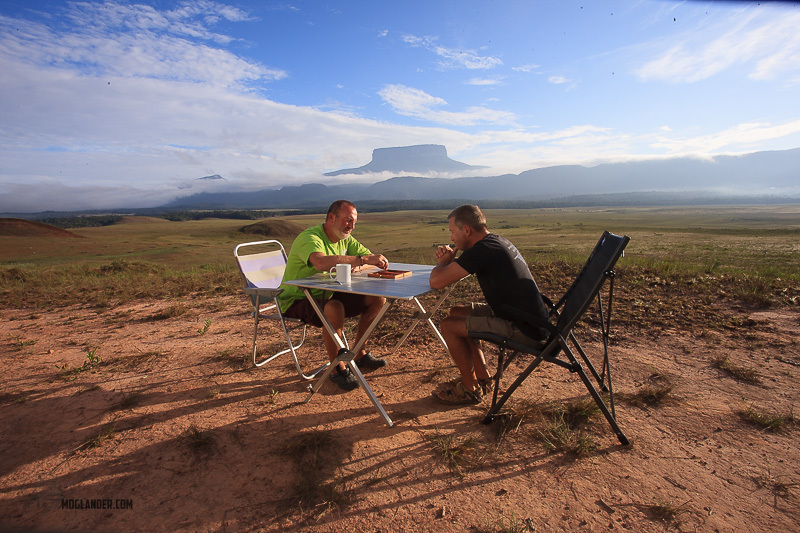 We ambled about the gran sabana area for over a week, and really enjoyed it. Anyone going through should allow quite a bit of time. The exact places we went are on the map on the previous Venezuela overland travel post. Supplies at the ready. check. 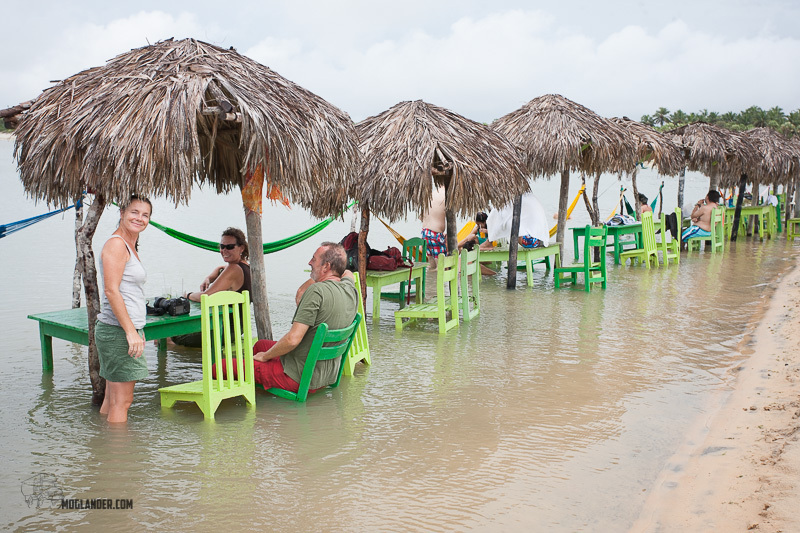 It is hard to express how relaxed and easy we found this part of Venezuela. We had been fine throughout the country, but cautious and on our guard. 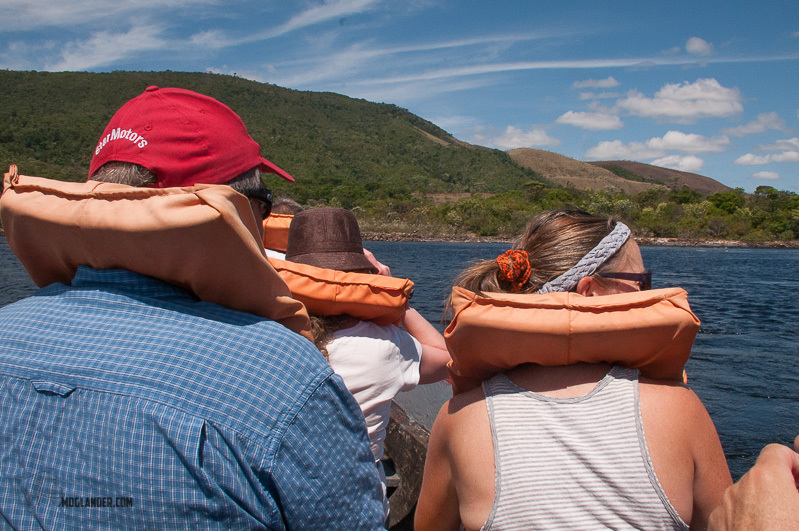 In the Gran Sabana, you can really relax. What better way than with a few home-made cocktails. 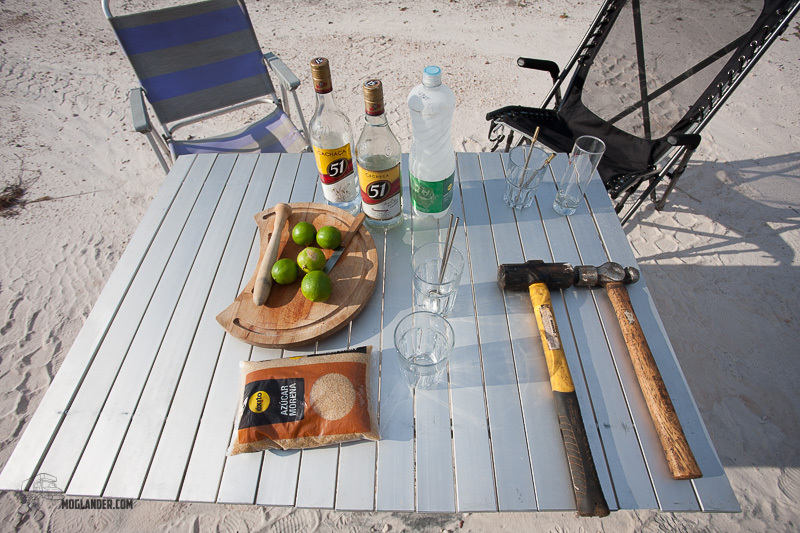 For anyone in the debate as to bring a fridge or not on such a trip, here is why you need a freezer, chopping board, lump hammer, sharp knife and some Argentinian mate straws. 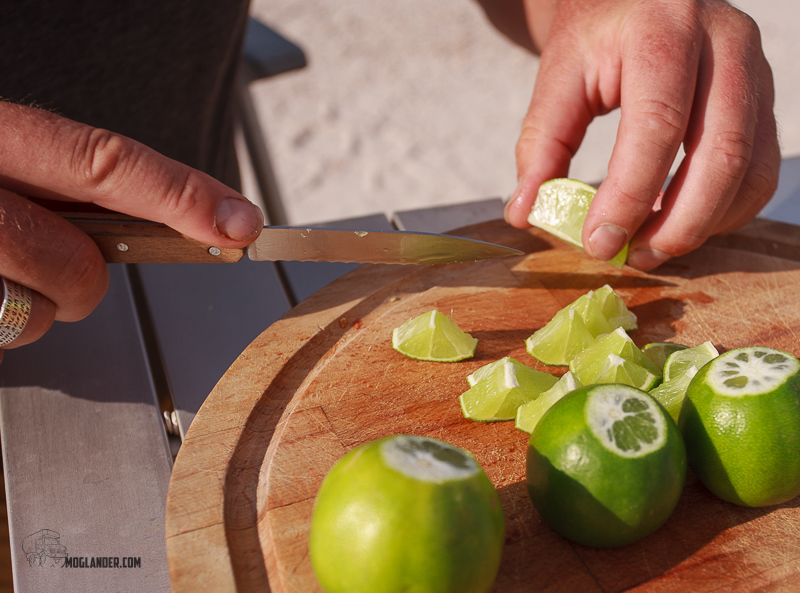 Limes, expertly cut by Jurgen. 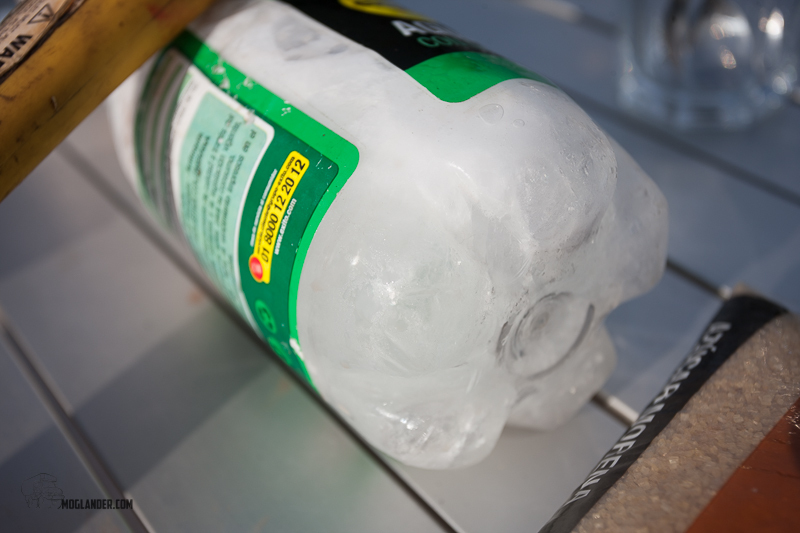 Crushed ice, from the aforementioned plastic bottle and a large lump hammer. We bought some great honey in Venezuela, really good stuff actually. 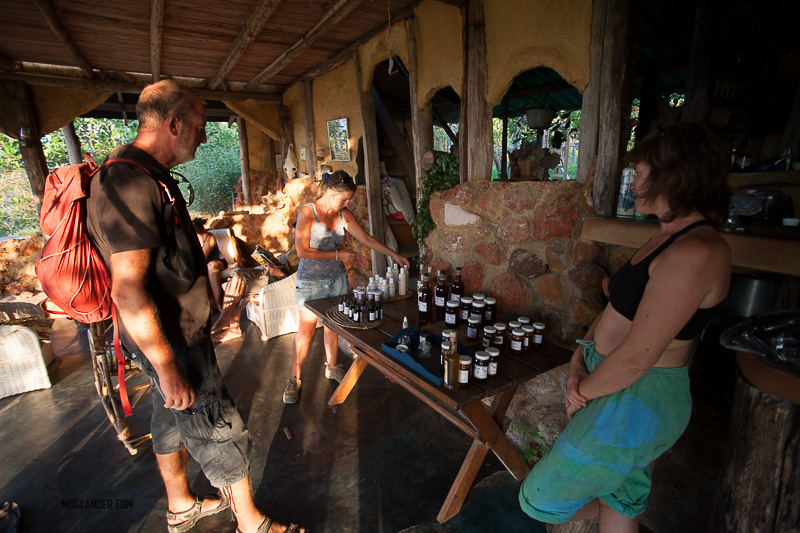 We stayed in the camp ground near this house, a french lady who lives here with her Colombian husband makes the most amazing honey based products you have ever seen! Even better for tasting. On the map on the previous post, it was campsite6. contaminated, and once we were into Brazil the Mog coughed, spluttered and came to a halt refusing the consume this black market fuel. OOPS! 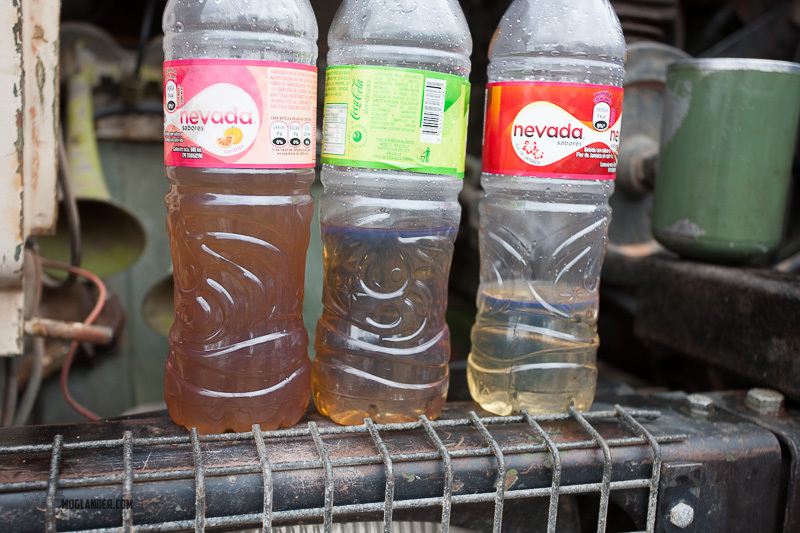 We were glad we had some jerry cans, clean filters and a tow off the main road. 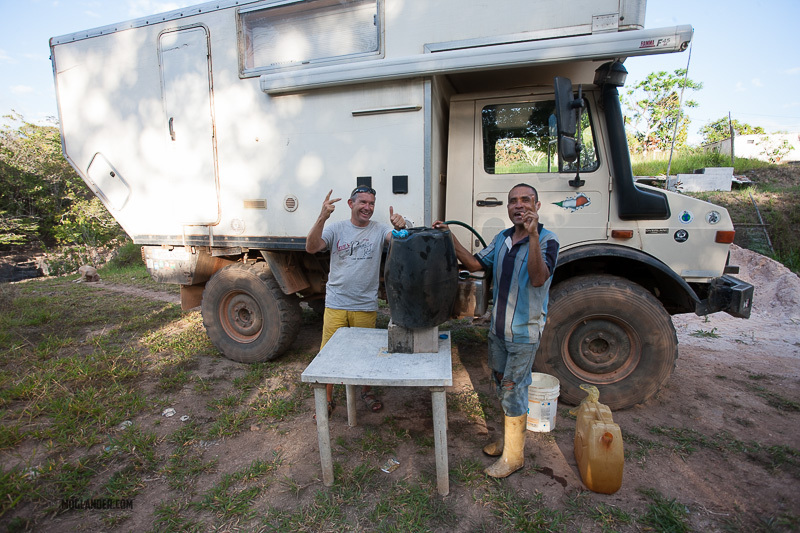 A few hours of replacing fuel filters, blowing out the fuel lines with compressed air, and “borrowing” some clean diesel from Jurgen and Ruth, and we were on our way again. 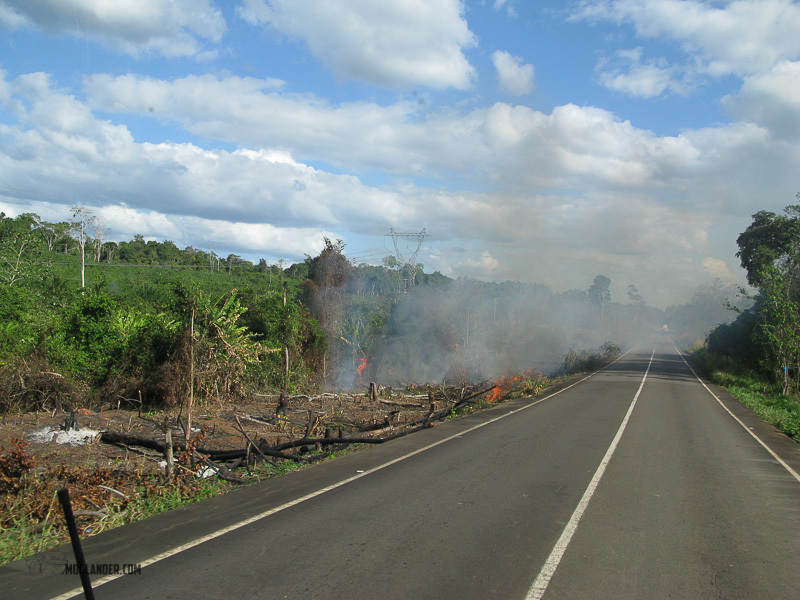 We dumped off the bad fuel at the nearest road works site, they burn it to heat the tarmacadam. Perfect! But all this to one side, the Gran Sabana was great. 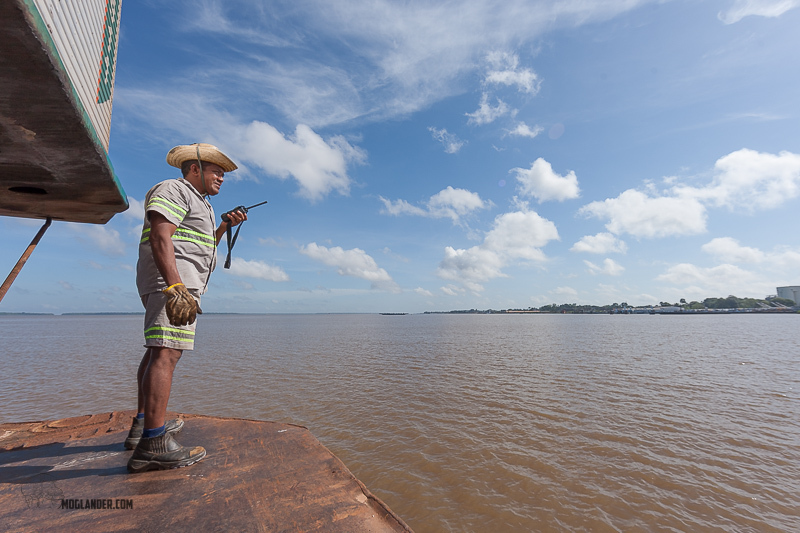 But here, and in loads of other places in the Amazonia region, people are having a hard time working out a living, and raising their families. 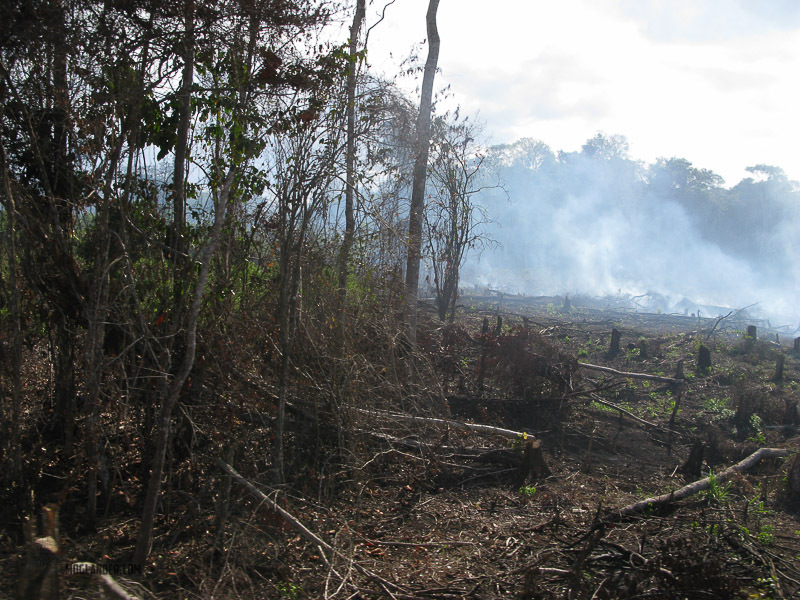 One way they have to do this is to “make” a new farm by clearing out some of the rainforest, and making a settlement. Any one family doing this is not a big deal, but overall it is eating into some of the most stunning areas we have seen. 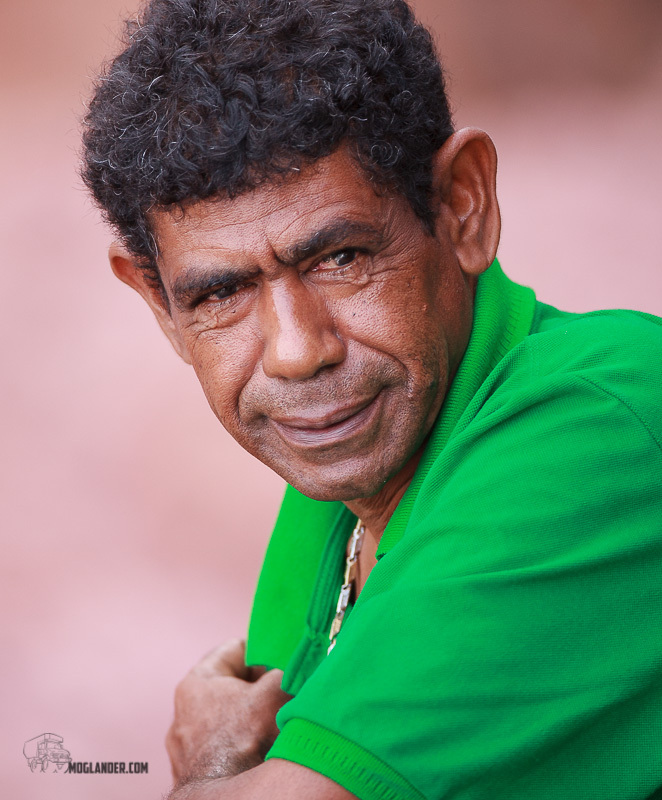 It is hard if not impossible to blame the people themselves as they are just trying to make a living, but it would be great if there were other options…. 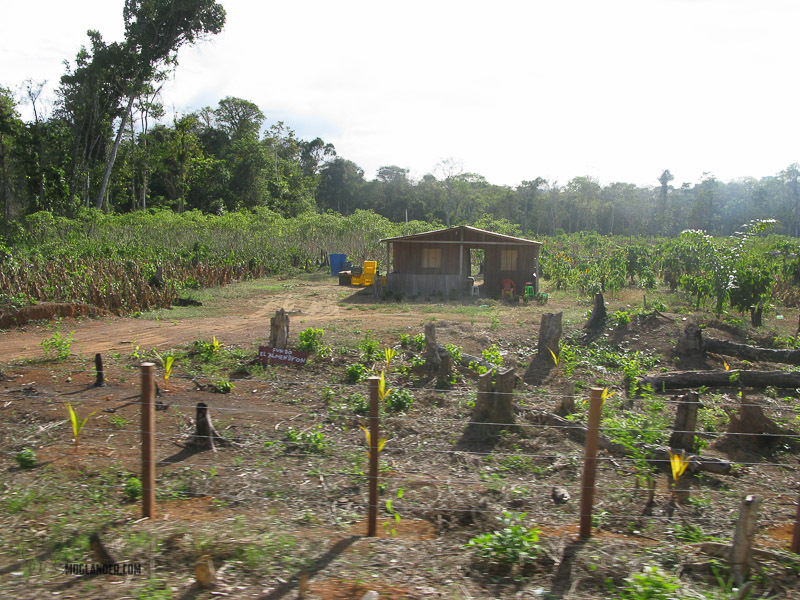 After the rainforest is gone, this is the farm for the next few years. 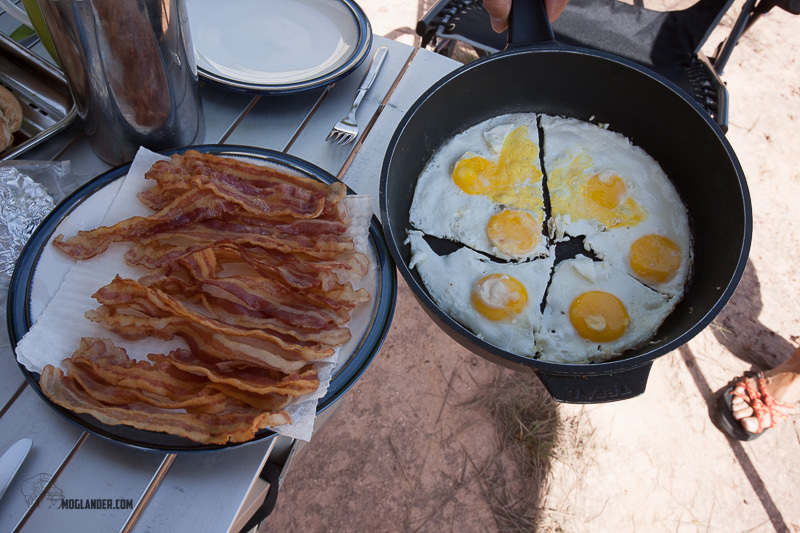 Camping breakfast in Venezuela. Times were tough. We could not read what this sign said outside a restaurant, but we worked it out. And so ended our Venezuela adventure. 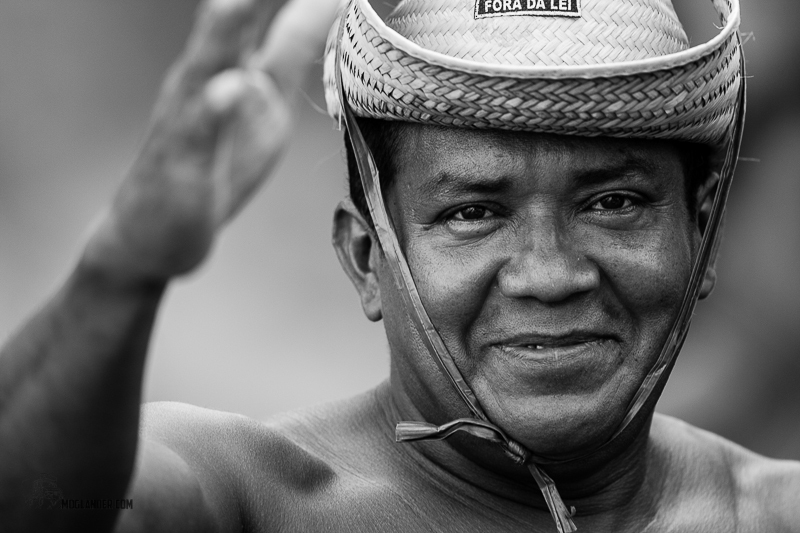 It was off to Brazil, to see what it had to offer in a world cup year…. 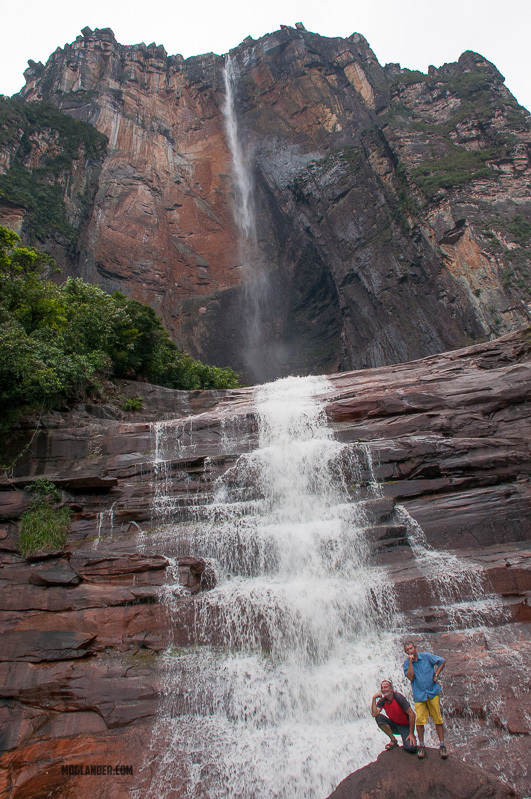 One of the big attractions in Venezuela is Angel falls, and at a kilometer tall, it’s a pretty big attraction indeed! This is the tallest waterfall in the world, and its hard to say which we preferred, Angel falls or Iguazu falls. We had decided that was a “must do” type of thing for us. We had heard of Angel falls for quite a while and strangely we had not met too many people who had made it there in person. It’s not the easiest thing to get to see, but well worth the trek. 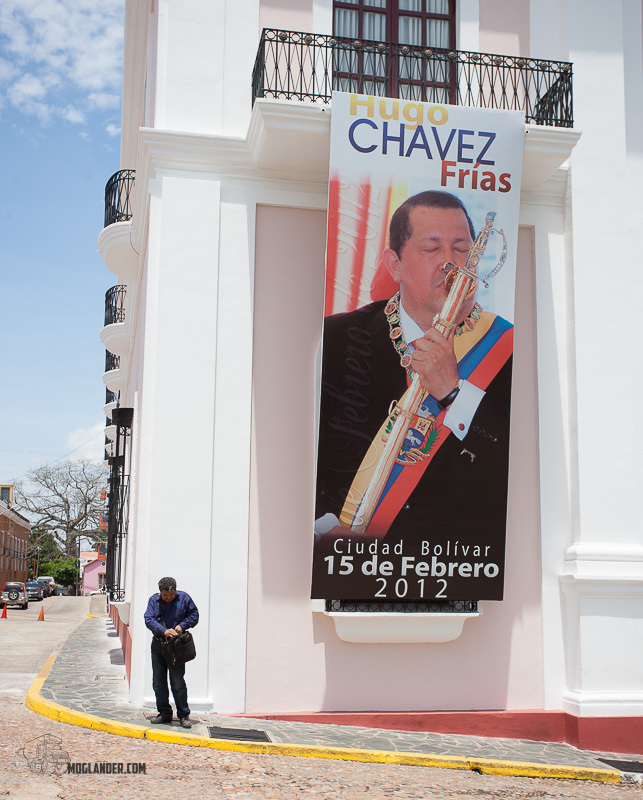 Everywhere we went, Chavez was there. Everywhere. 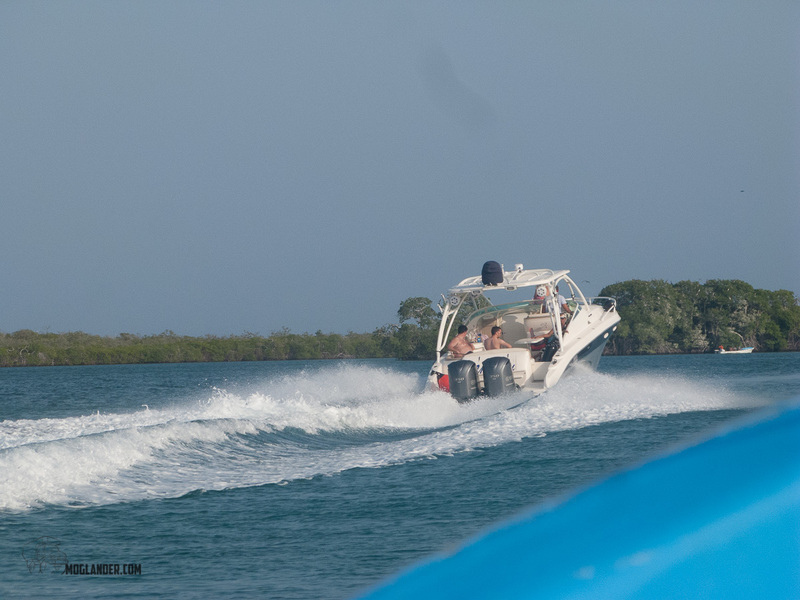 Since visiting Morrocoy National park, we drove though the centre of Venezuela. We did this carefully to avoid as many cities as we could due to the protests and blockages, and we ended up picking a pretty peaceful route. 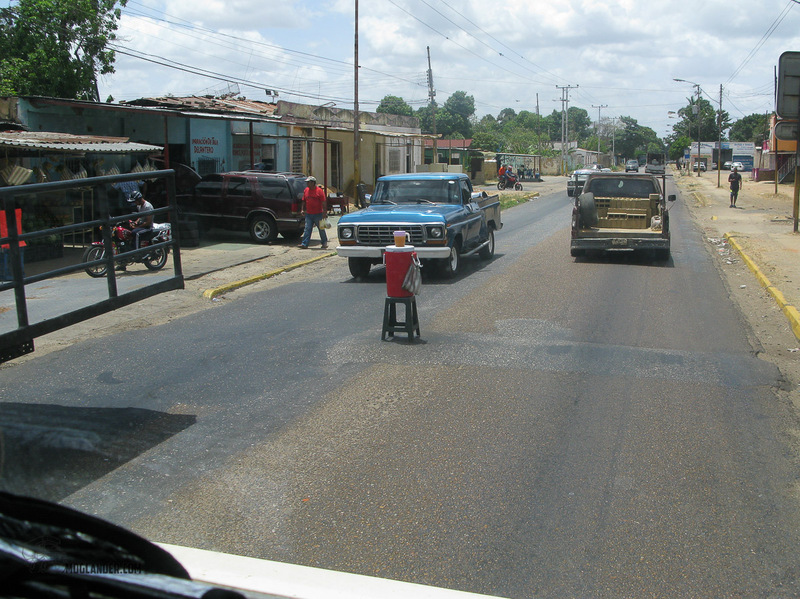 We made our way to Cuidad Bolivar, one of the few towns where you can base your trip to Angel falls from. There are a few agencies in the Airport building, so that’s a good place to start. 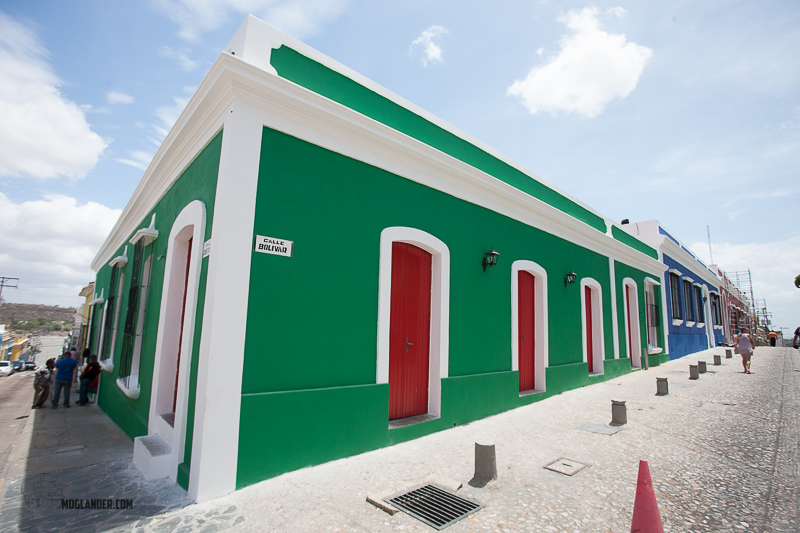 We chose Gekko Tours, who also own the Posada we stayed at. In peak season, you just need to organize your flight to the town of Canaima where the boats to Angel Falls leave from and then book with a local operator, but as we visited in the off season, we decided to book the whole trip including flights from Cuidad Bolivar, overnight in the town of Canaima and a boat trip to the falls themselves. It turned out we were very lucky we did this as most operators did not want to visit the falls by boat as the tourist numbers were so low, they were loosing money by only half filling boats. Some days the boats could not run as the water levels were just too low. On our trip we had to get out of the boat and walk along the bank a few times to allow the boat guys to get the boat over some rapids. 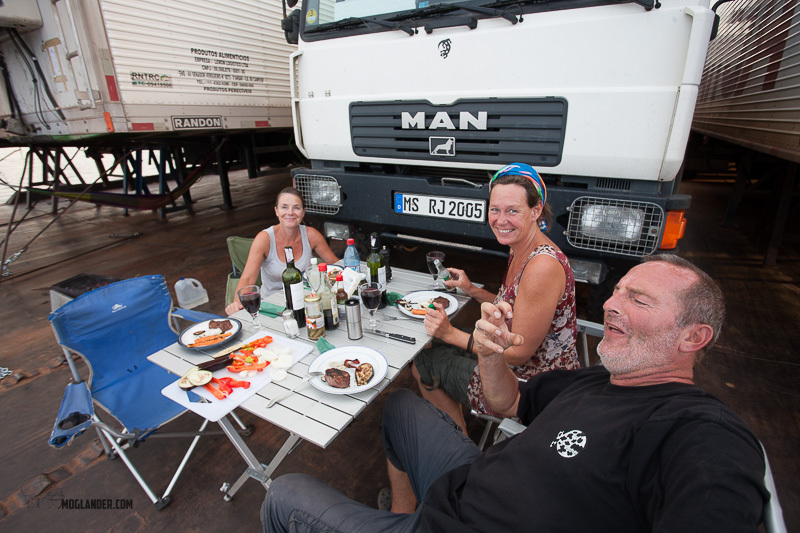 We parked the trucks in Posada Casita, which is a popular stop with overlanders, especially popular with Germans as they have Curry-wurst on the menu, which seems to be sausage covered in Tomato Sauce, which is then covered in Curry powder. They taste better than they sound! 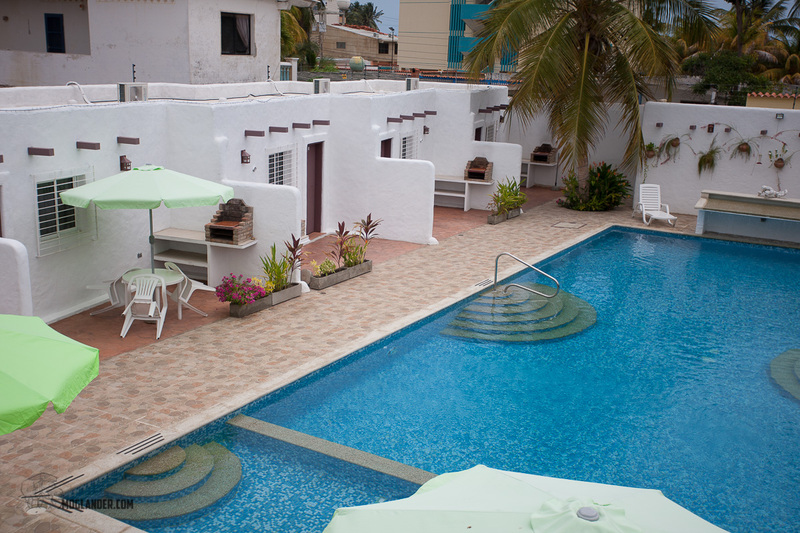 In Posada Casita they have a pool, can do your laundry and have a large fridge constantly stocked with cold beer. Kind of hard to leave! They stored our trucks while we went to Angel falls which was great. 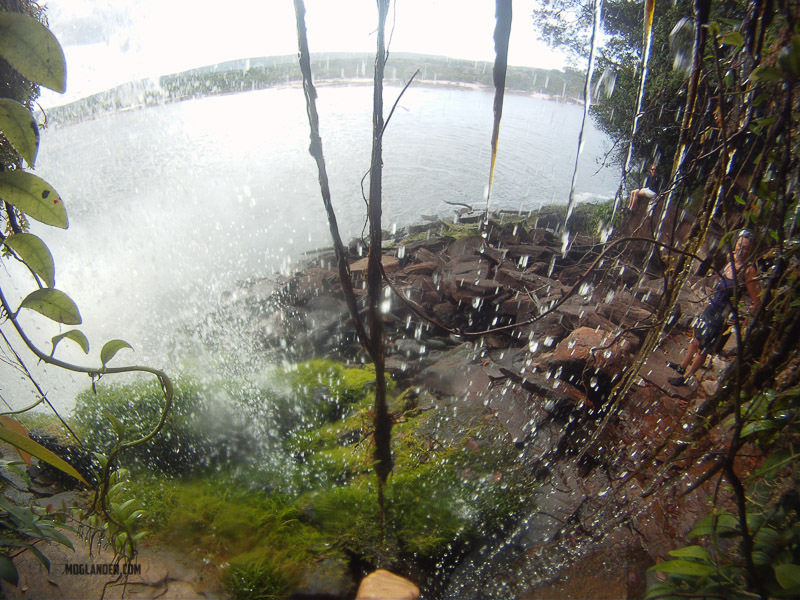 To get to Angel falls, there is one main way, and that is to get to the town of Canaima. 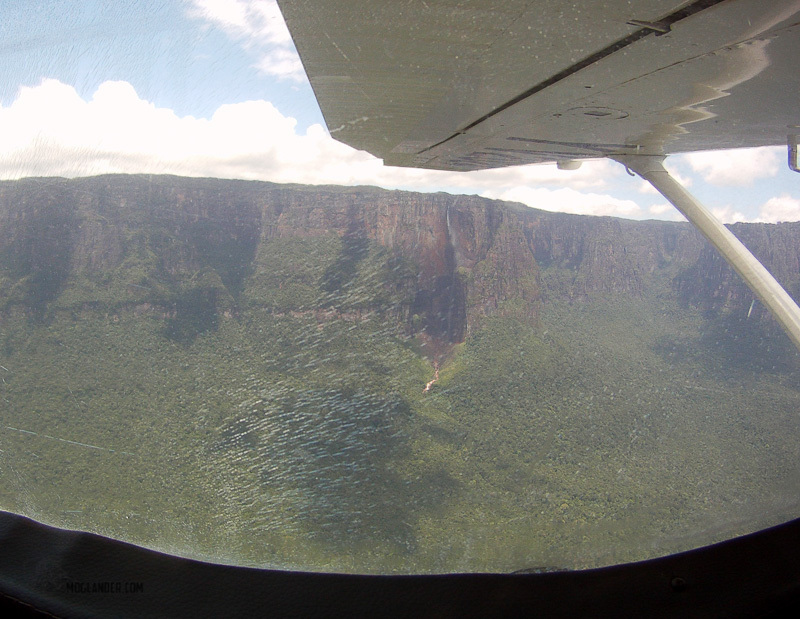 Depending on the map you have, there may seem to be a road going there, but we could not find it, so we flew from Cuidad Bolivar to Canaima. This is a flight in a cessna, of just over an hour, and it is over some stunning forestry. 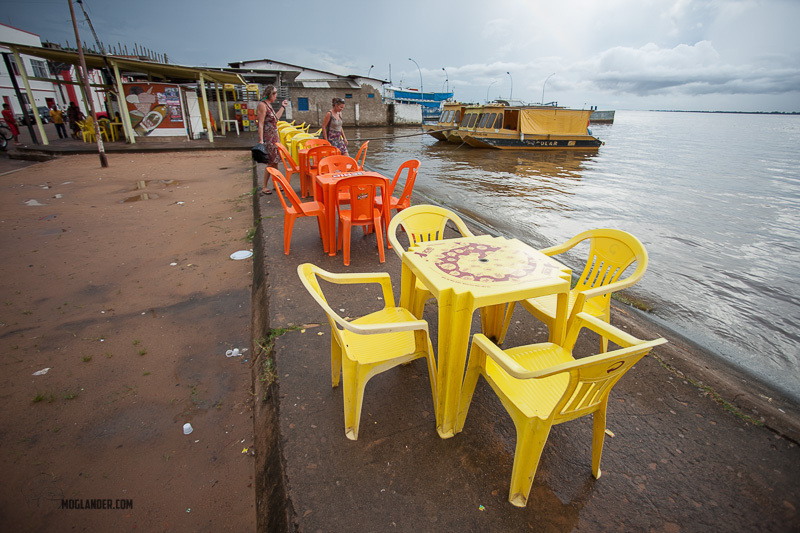 The town of Canaima is pretty small, and survives mainly on tourists heading to Angel falls. 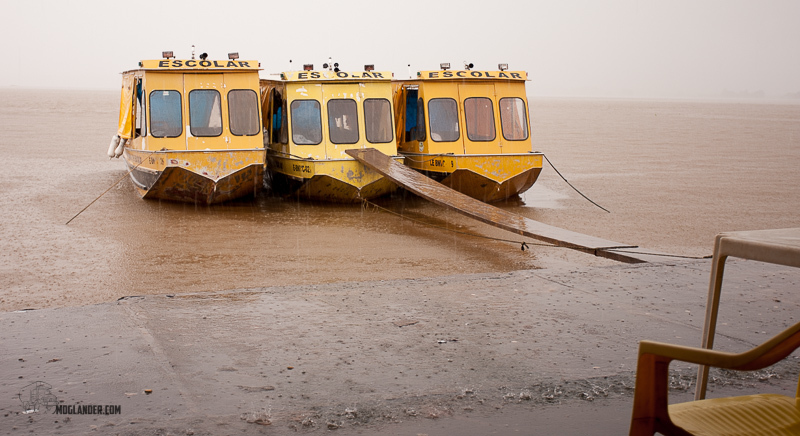 Boats to Angel Falls leave from this town, and it’s the best way to visit the falls in our opinion. It’s also possible to do a fly-by where you fly to the falls, fly past them, and then back to Canaima but it is not the same as making the boat trip and then hiking to the base of the falls. The second option (Which we did not do) is to travel by a 6 day hike to the top of the falls. This might be a nice option, but it was not for us. This starts from elsewhere. Selfie in the plane. and yes, we each had window seats. And yes, we were sitting beside each other. 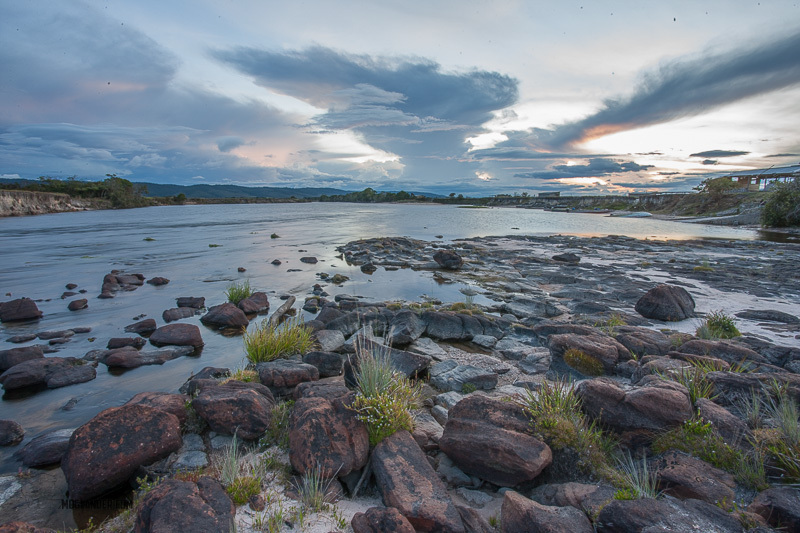 In Canaima, you have the option to stay 2 or 3 nights, and 3 is plenty. 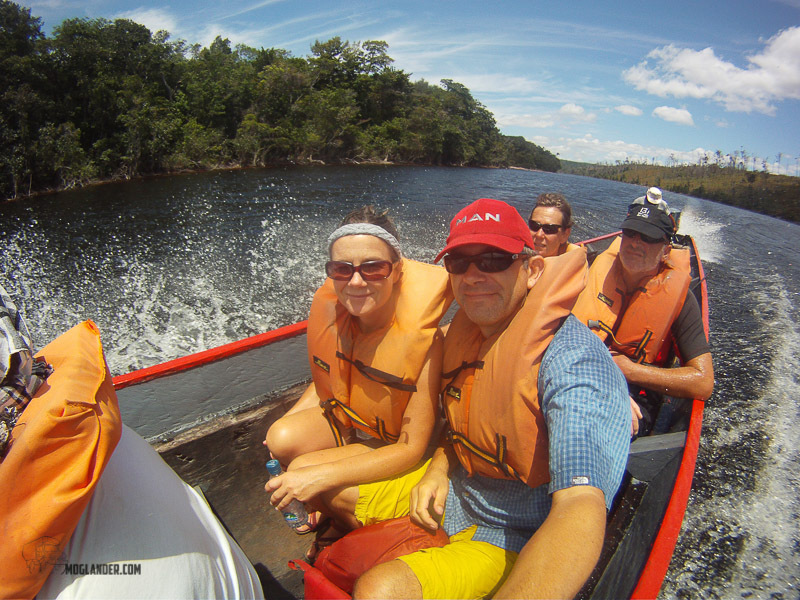 We had this option, but once we got sorted as to our boat trip to the falls, it worked out that we needed to spend a night up at the base of the falls in hammocks, and come back to Canaima the next day. This was a brilliant option as it meant we were not stuck in the small boat for over 12 hours on one day. 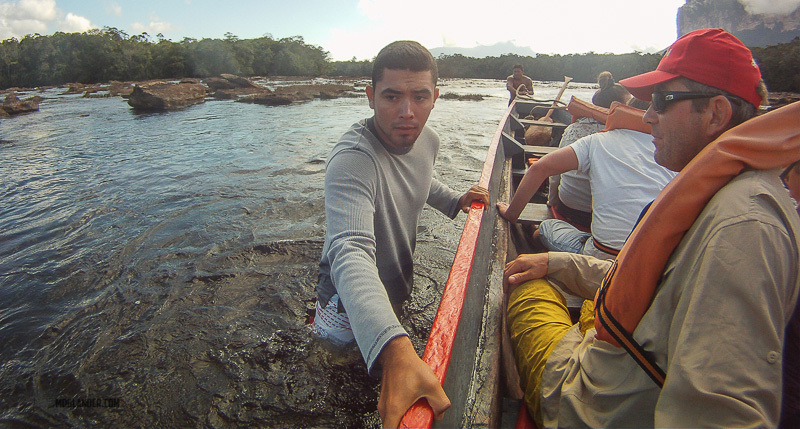 It was in Canaima that murphy’s law hit, we had just brought one dslr camera with us due to the weight limits on the small plane, the Canon 7d and of course as soon as we arrived the battery failed. It was just gone magically flat, but completely knackered and has not worked since. Luckily we had a gopro with us and while not ideal, it did the job for us. 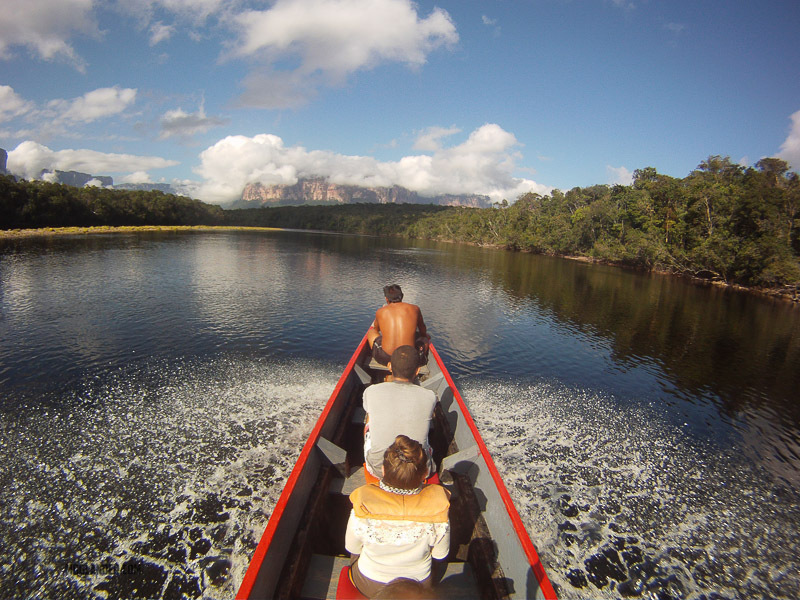 Canaima is based on the edge of a stunning lagoon, complete with sandy beaches. It’s not what you expect in the middle of what is thought of as Venezuelan Jungle, but there it is. There is a lot more farming going on around this area than we had understood, but I guess that’s progress, of sorts. 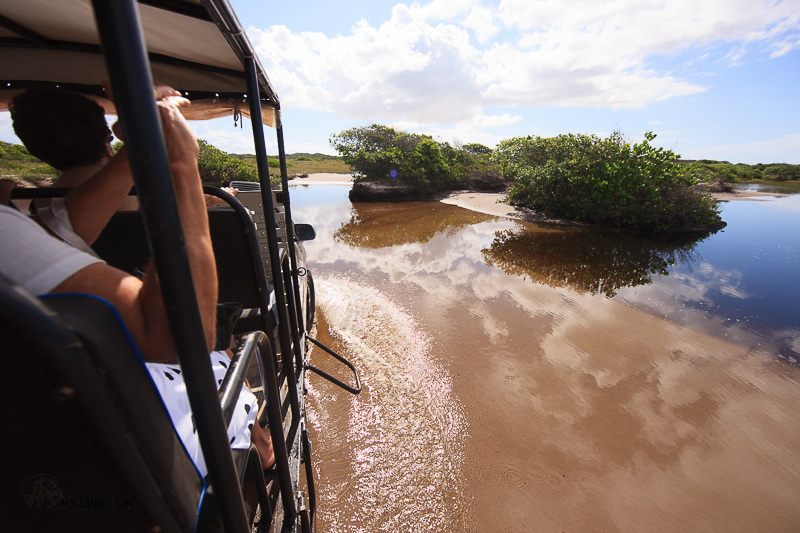 Most of the tours include a trip behind one of the waterfalls that feed the lagoon, and it’s a great way to cool down! 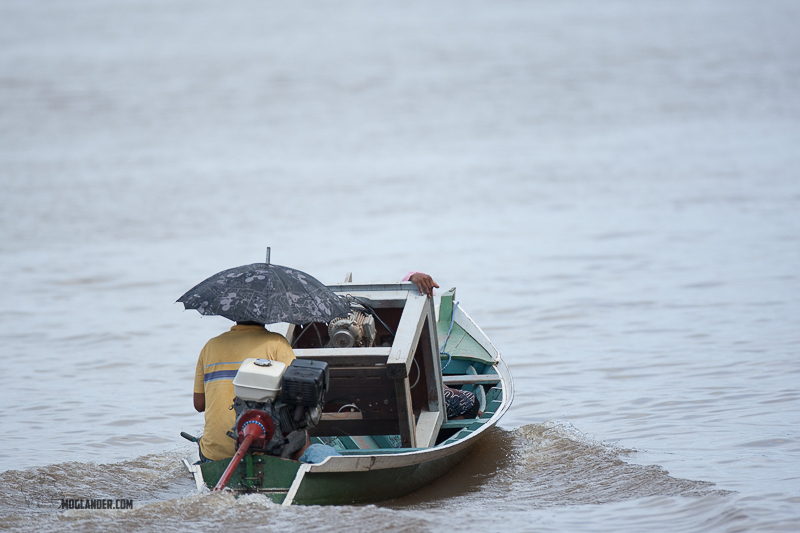 The boat ride up to the falls is great, it’s a narrow canoe with an outboard motor on the back. They can take up to 8 passengers, and require a captain at the back, and a guy at the front with a paddle to steer in the really tight spots. He works pretty hard! 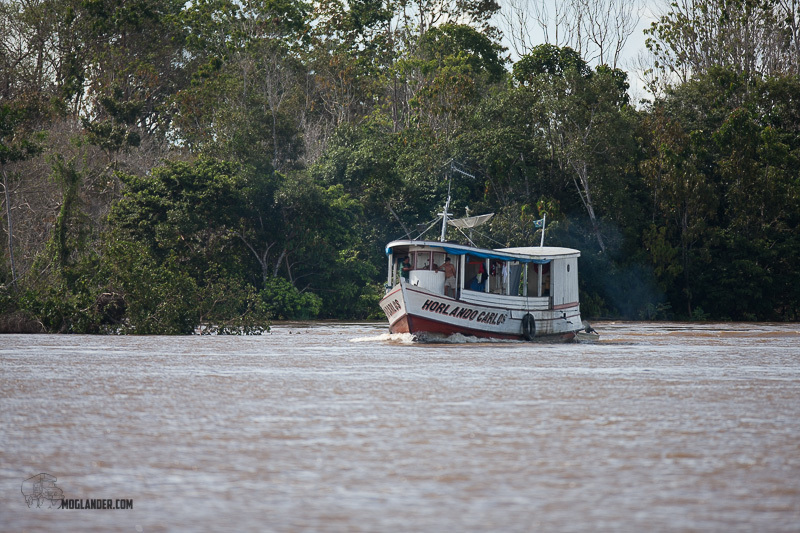 The trip up river takes between 5 and 8 hours depending on the water level, and took us quite a while. We did get to see the falls from the river as we got to the base camp where we slept in hammocks, and the guide knew exactly when we would see the falls. So much so he had us all do a count down from 10, he knew exactly which turn in the river we would go round and then see it. Once we got there, we made about an hours hike up to the lagoon at the base of the falls. There are a few cascading into each other, and it’s quite pretty. 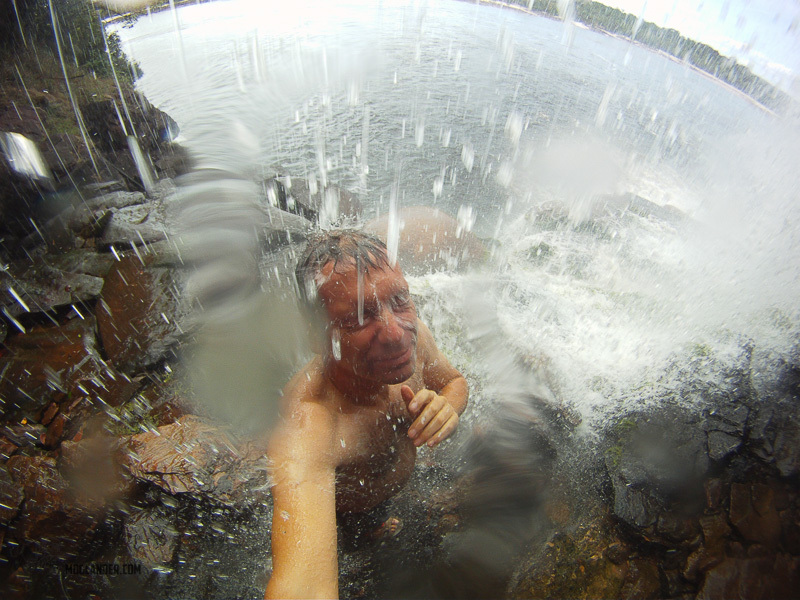 As it’s the dry season and not too much water is falling, we got to soak our feet in the lagoon at the bottom of Angel falls. Lifejackets all the there and back. Angel Falls, and no clouds! We had to stay overnight at the falls, and each tour company has a roofed area with loads of hammocks, cooking area for their chefs, and long tables for everyone to sit at. The chef made a great meal for everyone, and we played cards for a while by torchlight as there is no electricity there. You are right by the river, so the jungle sounds at night are great, other than the snores and snorts from your fellow tourists. The next morning, very early, they wake you for the trip back down river. In the early morning light, it can be quite pretty. 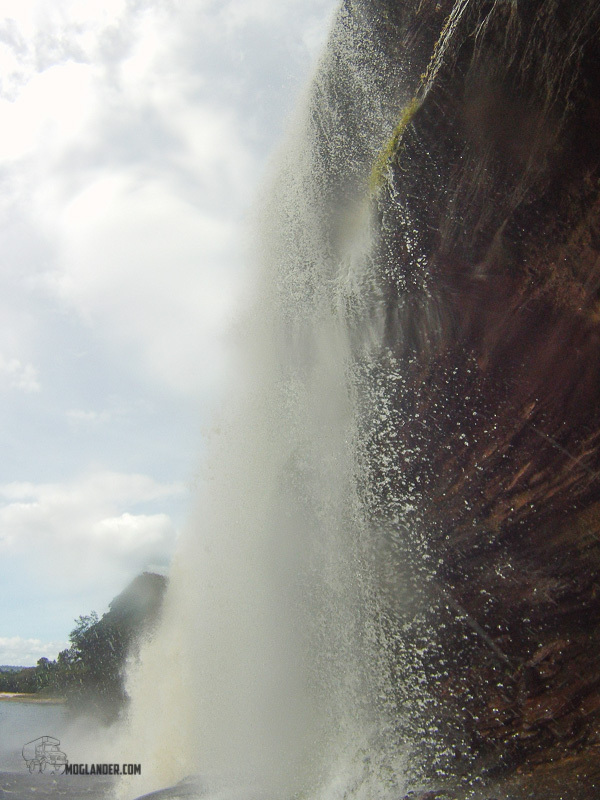 Angel falls from the air using a gopro. Not the right camera for this shot! 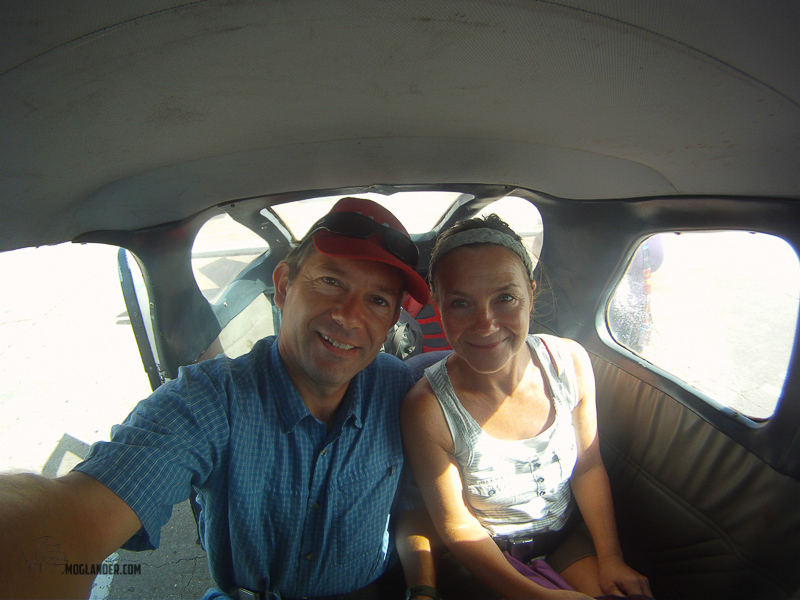 Once we were back in Canaima, we headed to the airport for our overflight. We had booked to visit the falls by plane as well as by boat. We did this because there is a good chance that when you visit the falls, all you will see is cloud and we wanted to double our chances. As it happens there was no cloud, so we got to see it all again. I must say the flight was a bit of a let down after the boat trip. Yes, we did see it, but as the photo shows, the windows in the planes are old and no use for photos. We did indeed see the falls, and our pilot was great, doing 2 passes with the falls on the left of the plane, and 2 with the falls on the right so that everyone had 2 chances to see it. We did speak to someone else who’s pilot flew directly towards the falls, then turned and headed directly away from them so they never saw them at all! 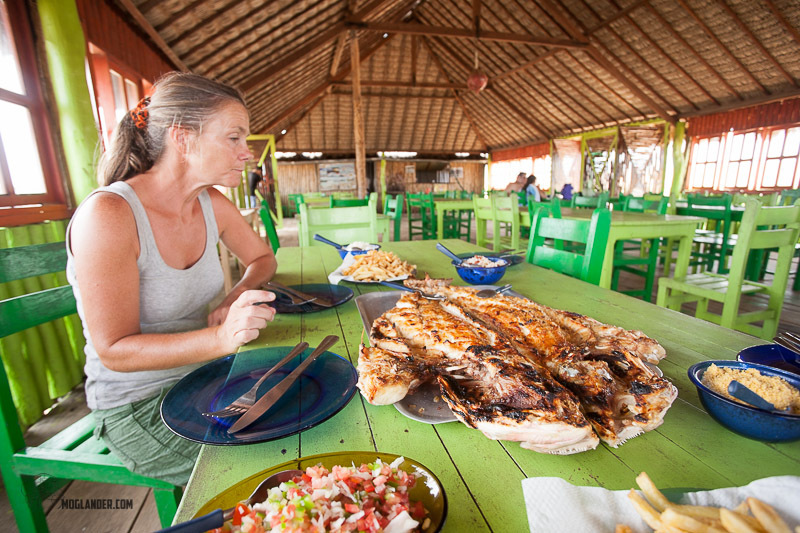 Back in Canaima we had some lunch, then caught our flight back to Cuidad Bolivar. 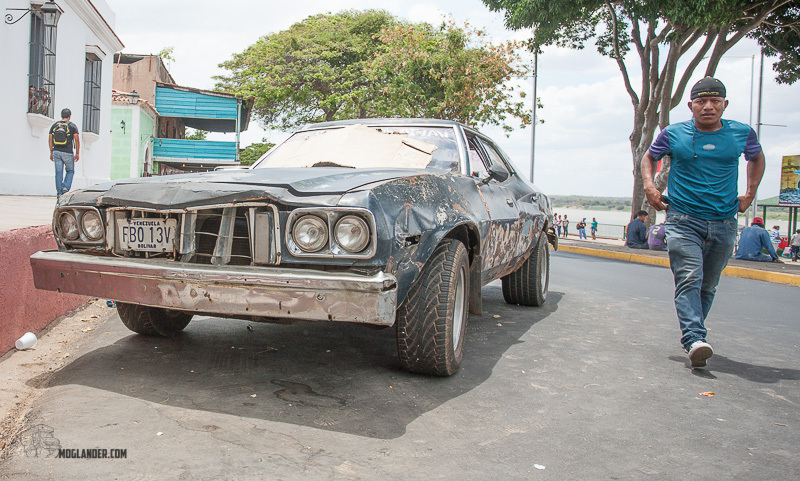 Not sure who looked grumpier, the car or its owner. 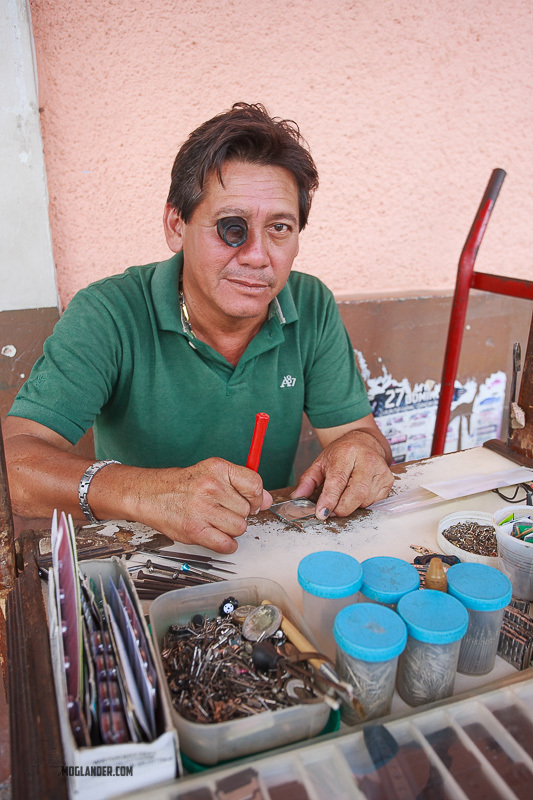 This guy was fixing old watches, replacing batteries etc. 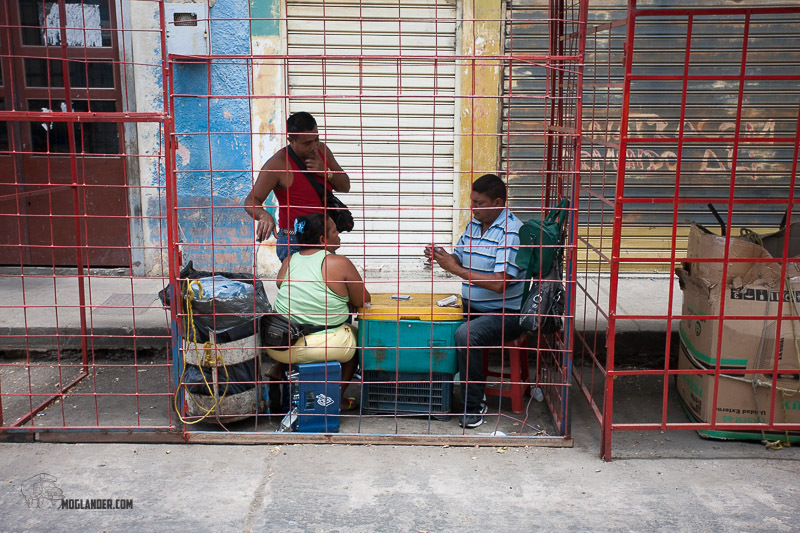 Some street traders ran out of stuff to sell, so just played cards. What we bought in one supermarket. Once back, We decided to spend an extra few days in the Posada sorting ourselves out, and getting blog posts done. The Posada had no wifi, but we got the ground work done. We spent a day in the historic centre, and it’s not a bad town to potter about in. There is not too much here to keep you too long, but it’s pleasant, and safe. 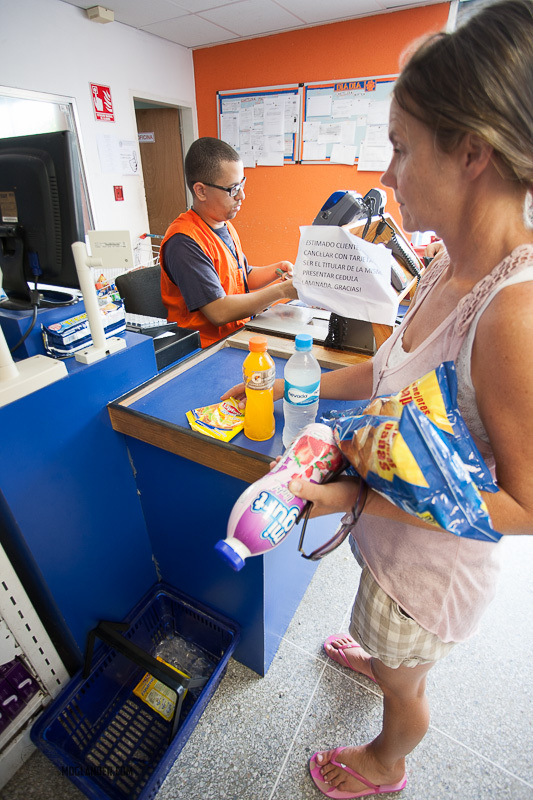 We attempted to do a bit of shopping as the stores in the kitchen were getting low, but it was slim pickings. 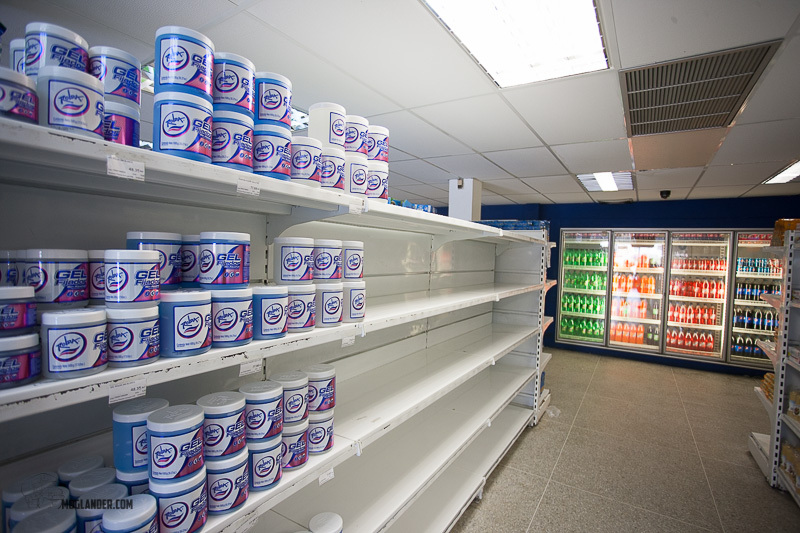 What is strange in Venezuela’s shops and supermarkets is the extremes. They either have none of a given thing, or too much of it. Unfortunately they had none of the things we really liked. 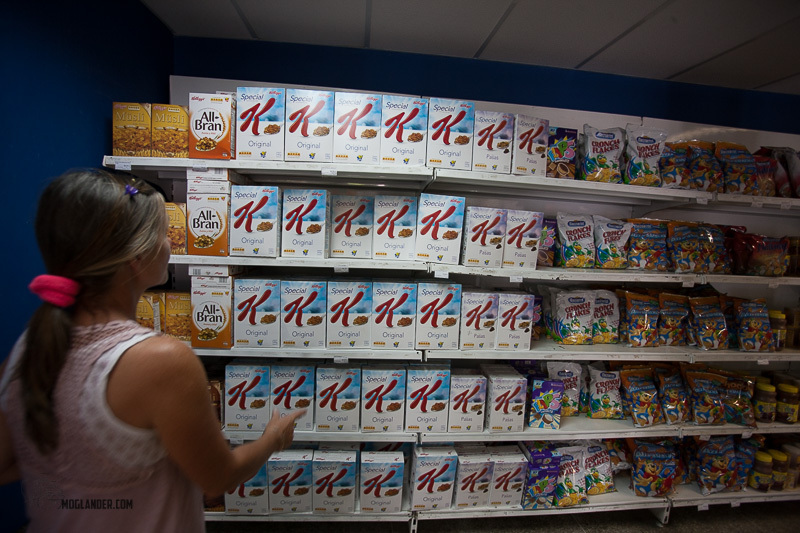 We could not get Muesli for example, so we bought some Kellogs special K. However, what is actually in the box is some kind of all-bran high-fibre cardboard, so that did not stay with us long. None the less, we did get stocked up well enough for the third leg of our Venezuela adventure, our trip through the Gran Sabana. For future overlanders, this is the route we took. If you click on any of the little flags, you can zoom in to see the detail where we stayed, and some notes about them. 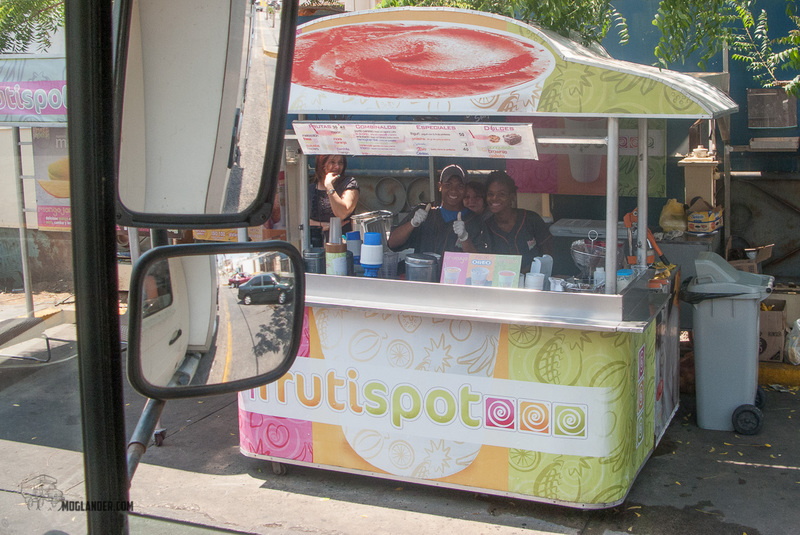 As we hinted before, we decided on going through Venezuela from Colombia to Brazil. 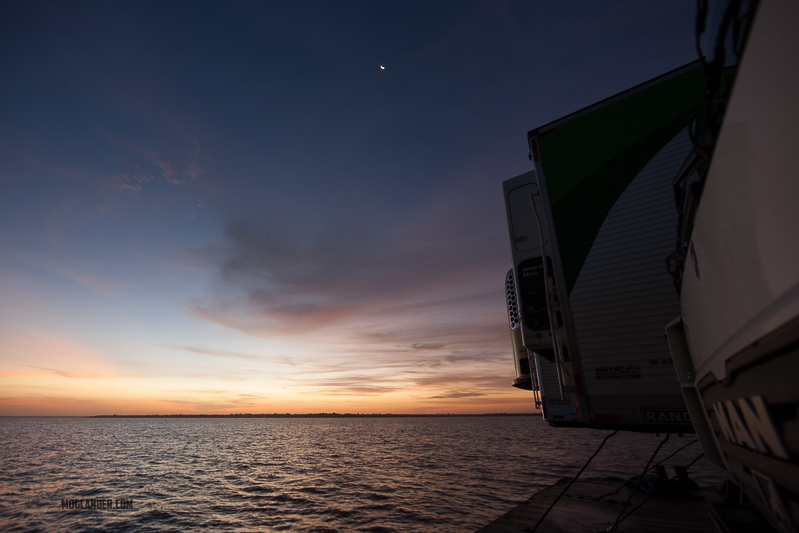 Even though the country is going through a lot of turmoil right now, we felt that it was a journey that was worth taking, and that by traveling with 2 trucks that we were always in sight of each other we would be in a safer position than many solo travelers. 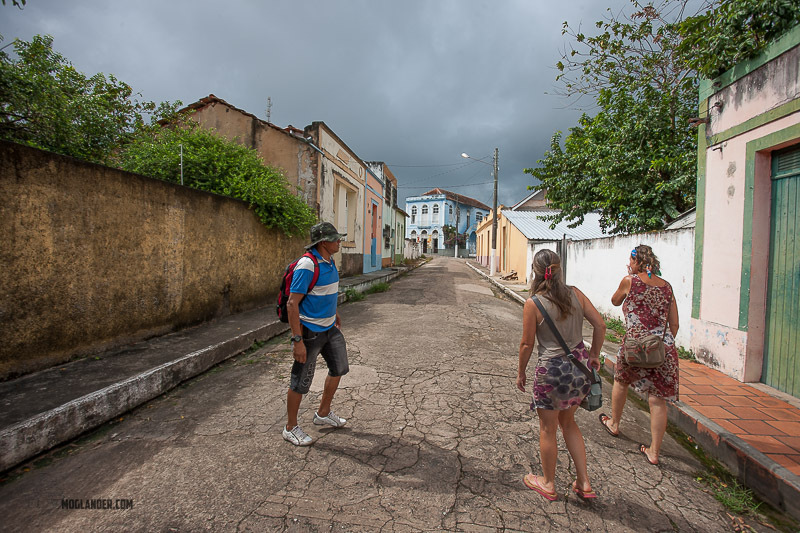 If we had gone from Colombia back to Ecuador, Peru and Bolivia and then to Brazil, it would have been a huge backtrack as we had explored those countries to a degree that we felt we had seen them in enough detail. By backtracking, we would be just zooming through six or seven thousand kilometers of roads and countries that we had already seen. Sure, there were a few national parks and museums that we had not seen, but at this stage we have Museum, Church, Mirador (Lookout point) and “quaint colonial/indiginous/rural town” overload. 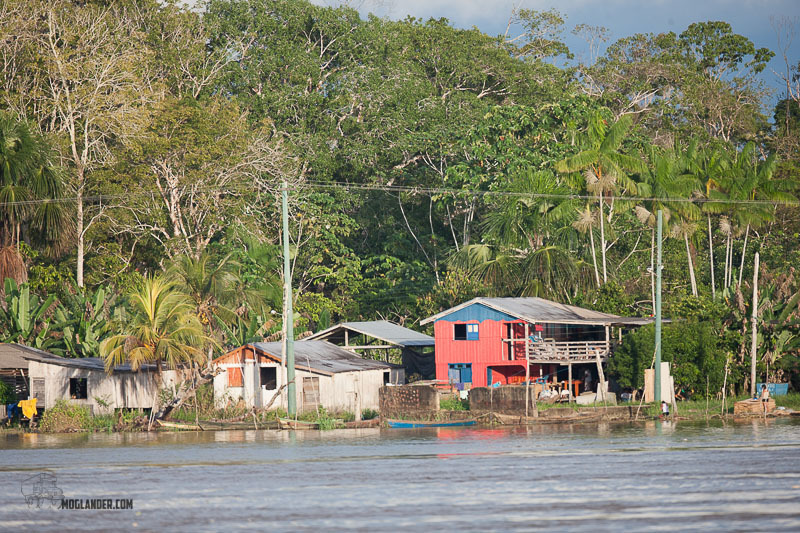 Traveling north to Panama, and on to Alaska would be super, but then we would never have seen Venezuela or Brazil in the same detail that you can when you spend a few months driving through. We doubt we will be back this way (South America) anytime soon as we need to get back to jobs, earning income, replacing full passports and refilling our piggy-bank. 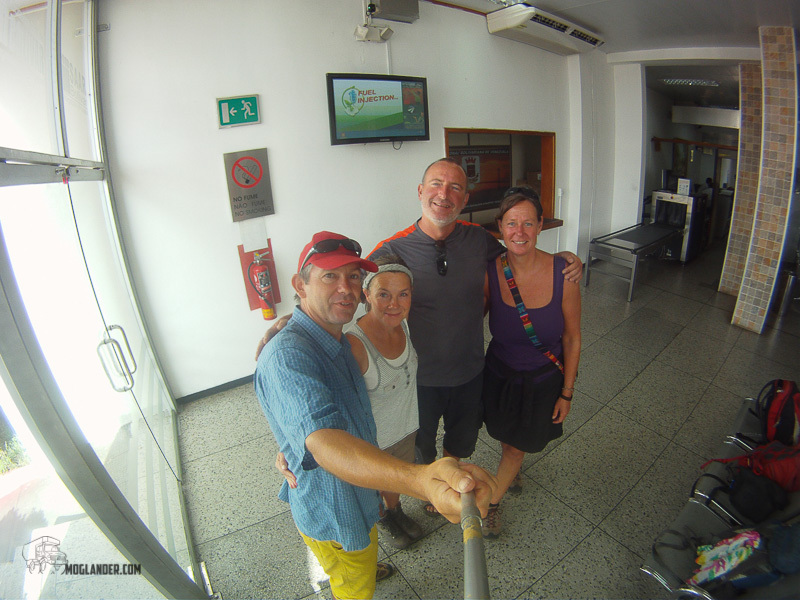 So, on 18th of March we crossed the border at Maicao from Colombia to Venezuela. 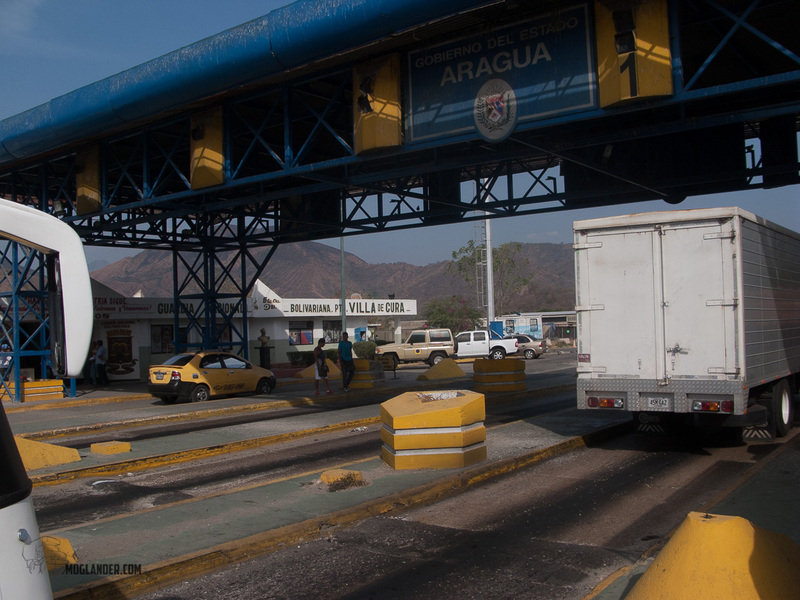 Entering Venezuela was slow and frustrating, it was probably the slowest and most manic country entry we had done. We were in “super cautious” mode so no photos were taken as all our cameras were locked up safe. Looking back now, it was a bit over cautious, but better safe than sorry. If you are going to enter Venezuela this way, give yourself loads of time, and double check the paperwork as both ours and Jurgen & Ruth’s were wrong and we had to get the Venezuelan Aduana to re-do it, and they still got ours wrong the second time, but close enough to be ok.
We were in Venezuela! 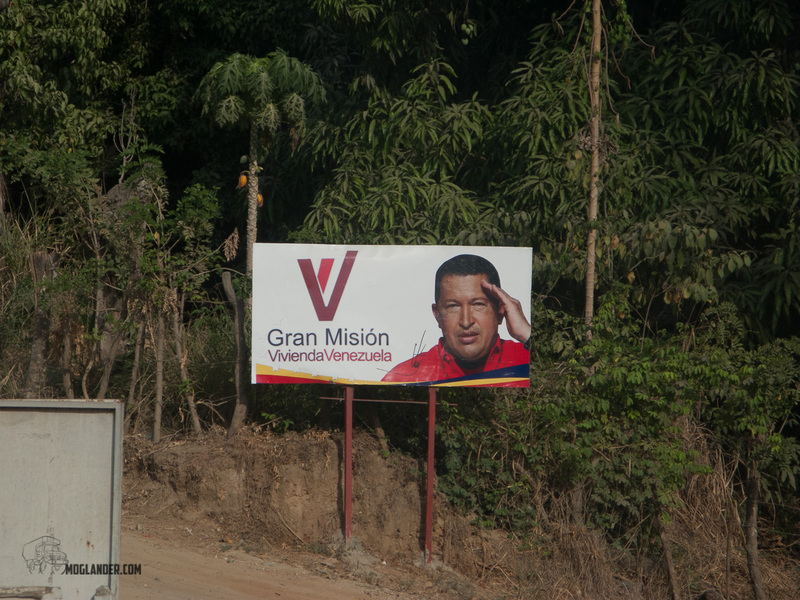 The country where even Venezuelans had told us not to visit as it was so dangerous. We had noticed a pattern as we traveled, when we were in Europe, everyone said South America was dangerous. 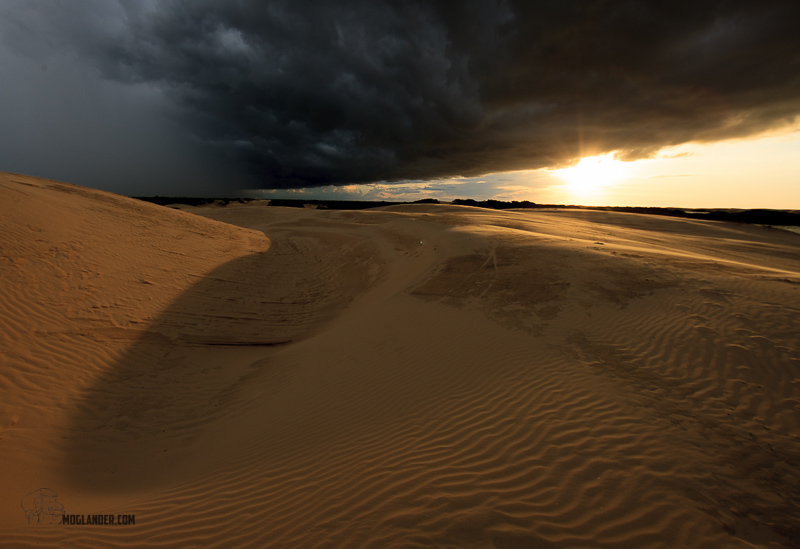 When we landed in Uruguay, they indicated we should be careful in Argentina. When in Argentina, the Argentinians told us to be careful in Chile. 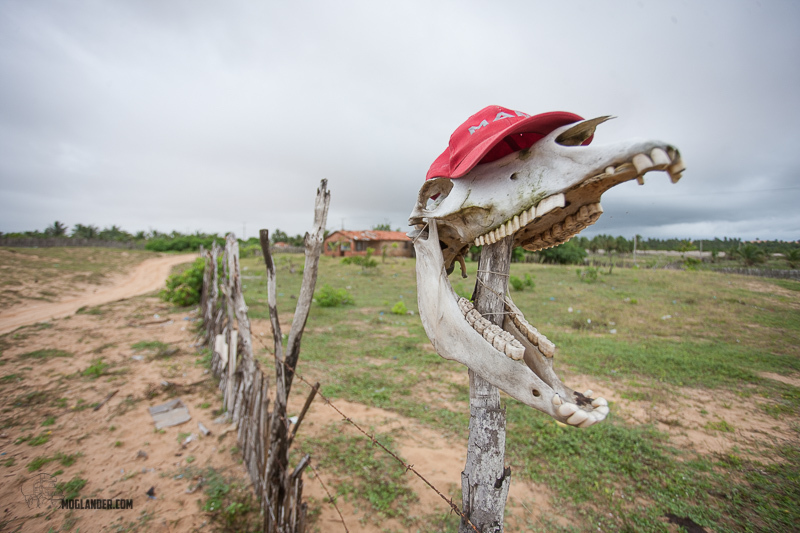 The Chilean’s told us that Bolivia was wild, and a dangerous place to visit. The Bolivians were not too worried about Peru, but the Peruvian’s warned us about the Ecuadorians. 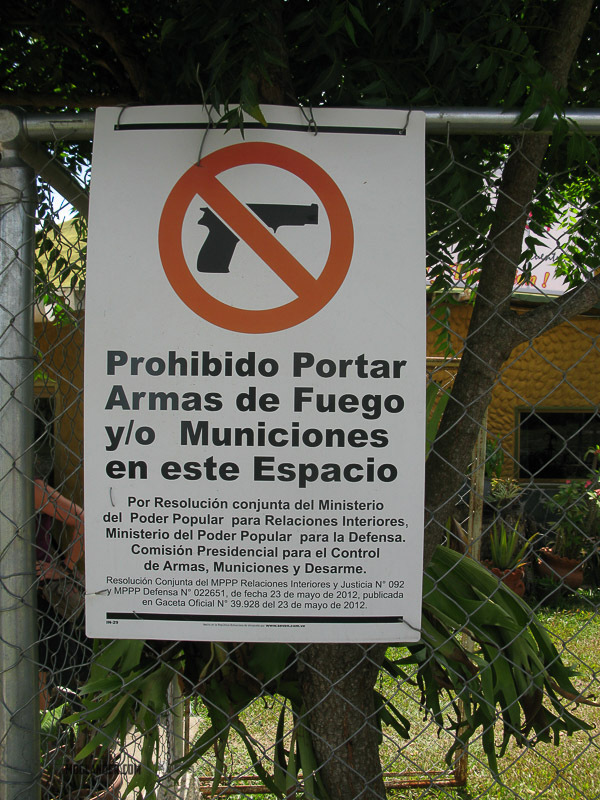 In Ecuador, they told us to be on our guard in Colombia as it was a very dangerous place. 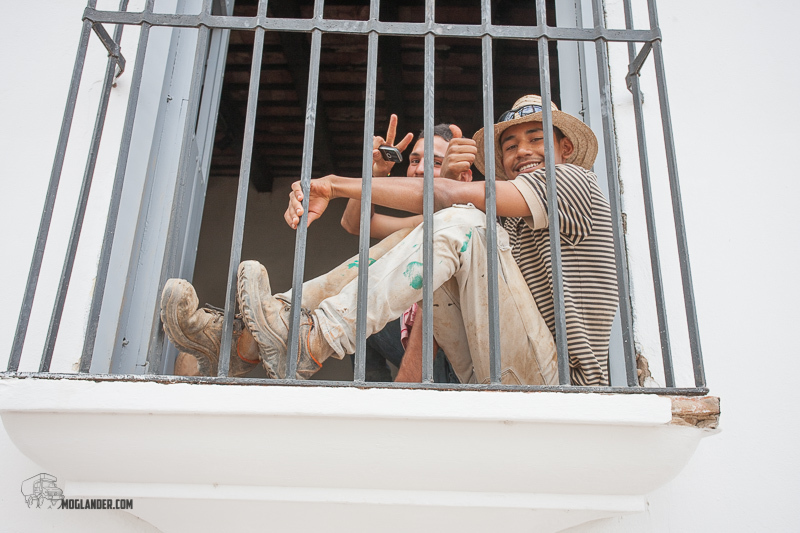 In Colombia, they thought we were mad to want to visit Venezuela. When we were way back in Argentina, we met a Venezuelan guy who told us that all of South America was very safe, but whatever we did, do NOT visit Venezuela as it’s so dangerous. Needless to say we were a mixture of skeptical, and careful all at the same time. 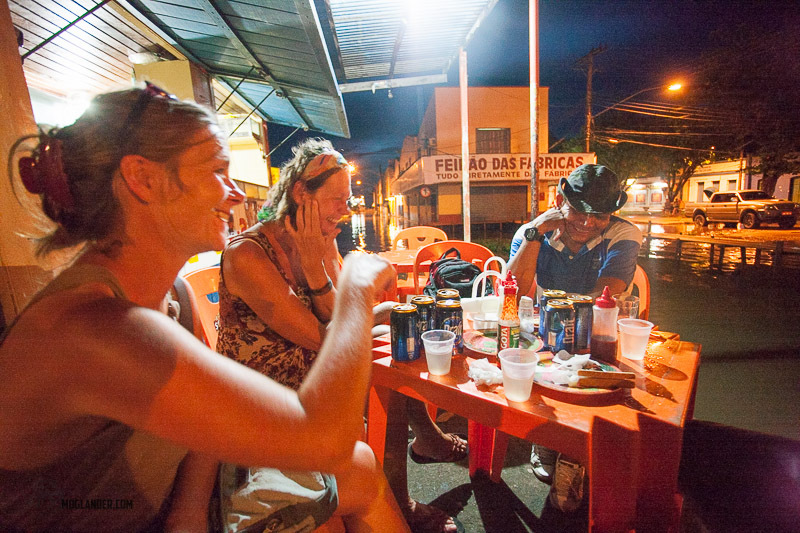 Our first night after the border brought us to a small town called Sinamaica. We went to the police station to ask where was safe to park, and we were allowed to park right behind the station house in their parking lot. 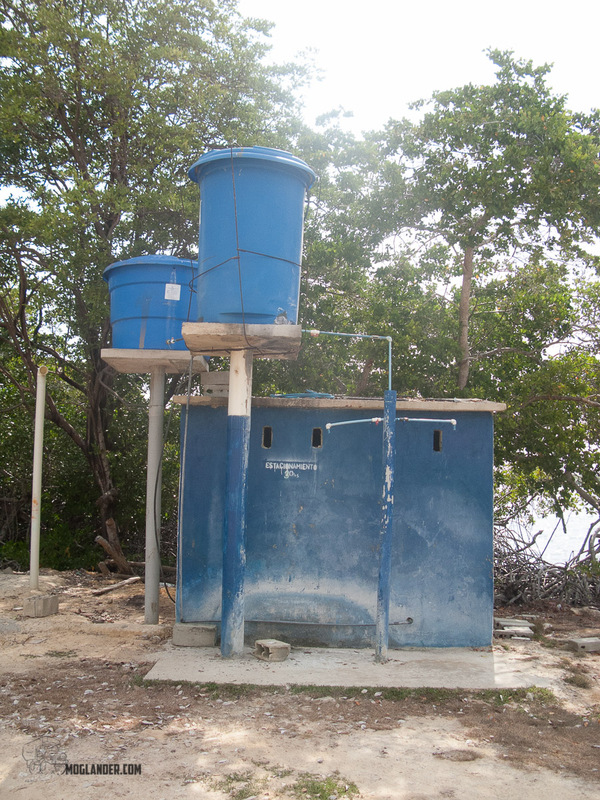 This was right beside the main road, and would be noisy, but we were sure it would be reasonably safe. After 30 minutes of walking about the village (Downgraded from town to village due to the lack of anything in the town), we felt really good about it, and decided to park for the night at the side of the Plaza. 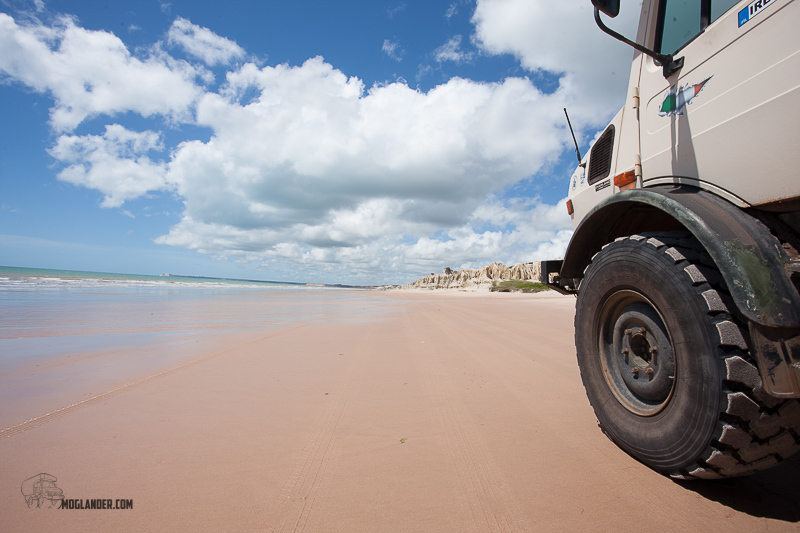 We usually like to park in remote places where the remoteness makes us safe, or if that’s not possible, we park in the most visible place we can which gives a sense of safety as so many people are watching the trucks. We had a grand quiet night there, and ended up having a short conversation with a student who was home for the weekend. We asked was he protesting during the week, and he was almost surprised that we had to ask, of course he was. He went on to explain it was for the future of Venezuela as he could not see that it has a future the way things are now. This was a message we were to hear a number of times during our overland travel in Venezuela. 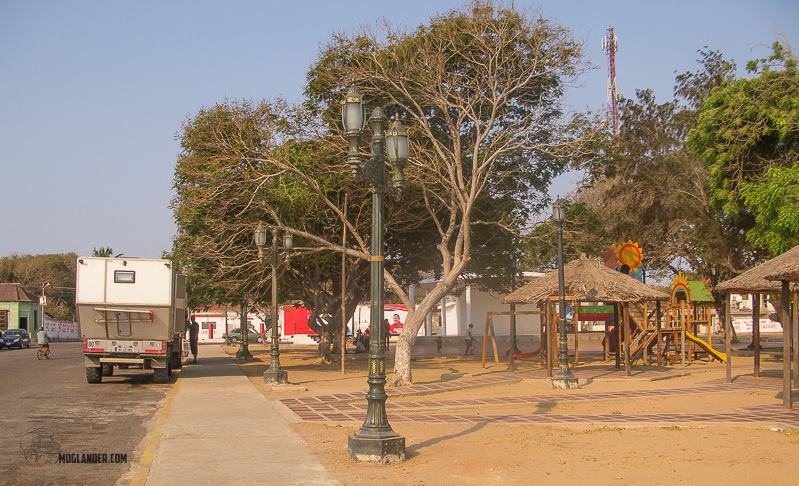 The next day we went through the city of Maracaibo. It was the only city we had no choice but to go through. 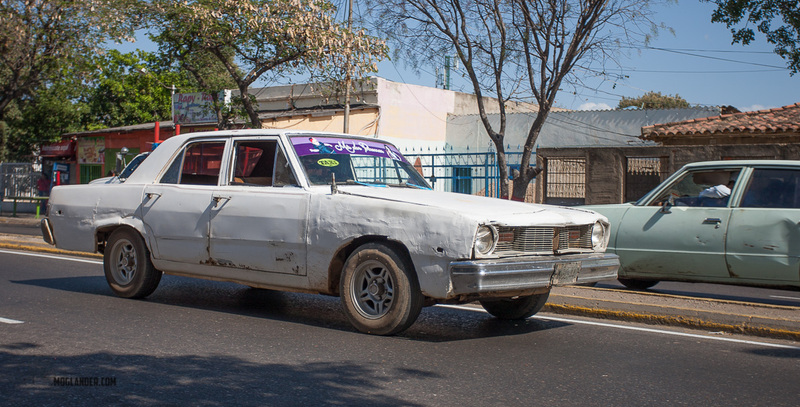 We stopped off to get some Venezuelan SIM cards for our phones, and to buy the local road insurance. We were advised on a route through the city by some police who were fascinated with the trucks, and despite (or because of?) their best efforts, we ended up meeting a student protest coming towards us on a pretty large road. They were really relaxed and peaceful, and when they spotted that our trucks were foreign we got a huge cheer and loads of waves. 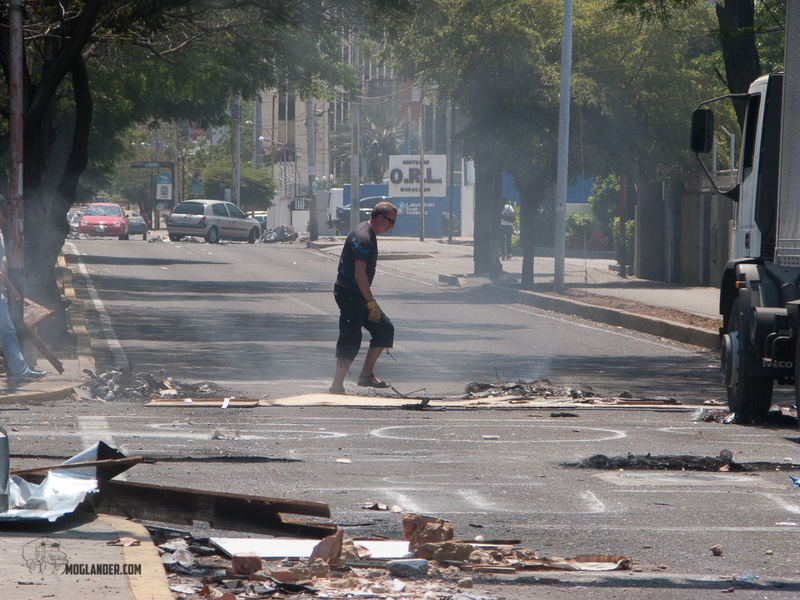 The detour around the march brought us to a roadblock, but it was abandoned by whoever built it and set it on fire. Jurgen cleared a path for us (I was busy with the camera…) and we passed by without incident. 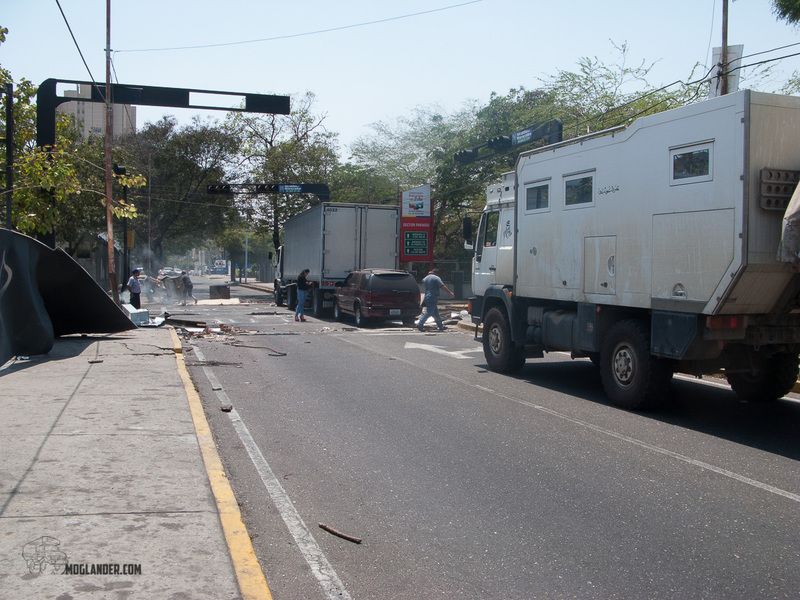 That was to be the only sight or sign of protests we experienced first hand in our 4 weeks in Venezuela. Our town camp in Coro. 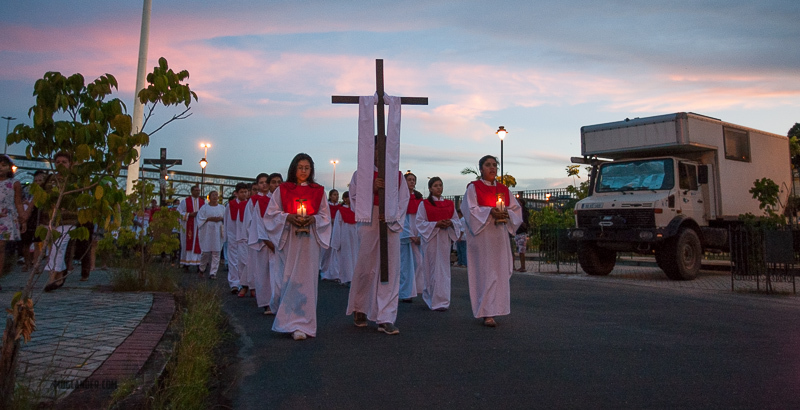 After this, we were on our way to our next overnight spot, the town of Coro. This was a nice town, and we felt really safe there. We parked for the night outside of a Church, and right beside a small craft market. They were really friendly, and had some weird biscuit things for sale at breakfast time, which I tried. They did not last long enough to take photos, Sorry…. 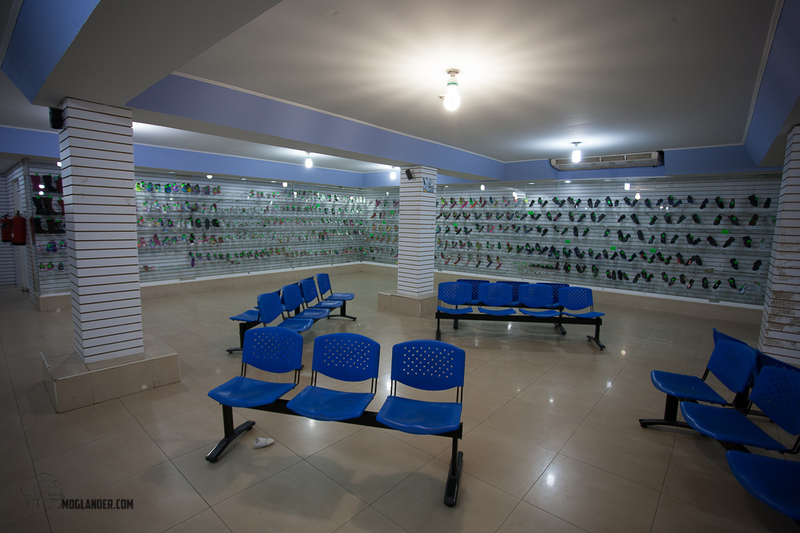 Our real purpose in this town was to change some cash, US$ into Bolivars. There are 2 rates, the official and the black market. 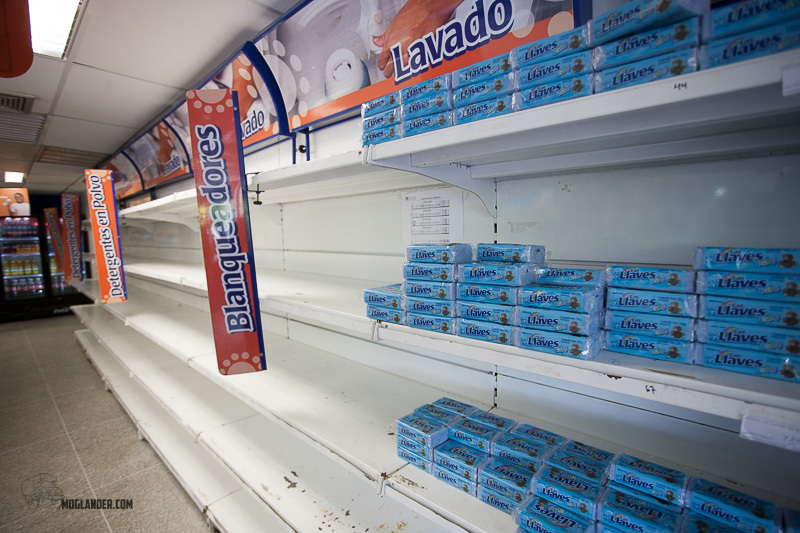 The official was in or about 11 Bolivars to the Dollar, but the Black market floats up and up from that. 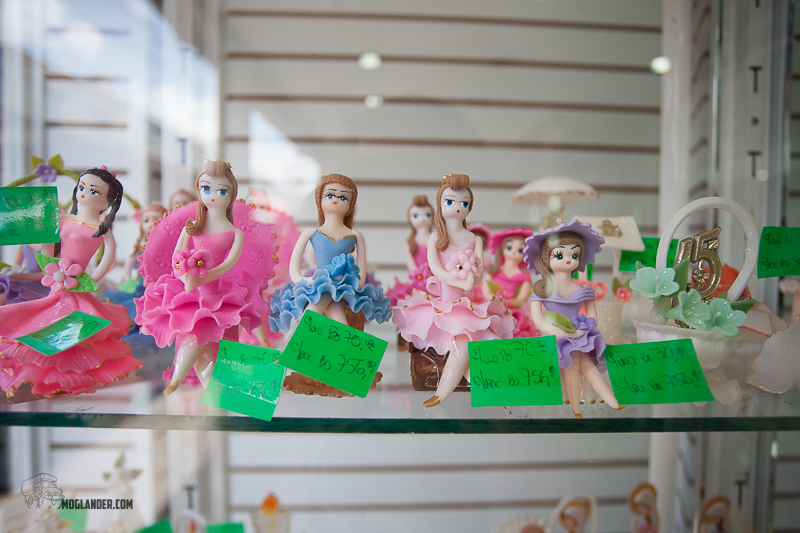 We exchanged at a rate of 60 Bolivars for the Dollar, meaning that everything we bought from then on was almost 10 times cheaper than it should have been. Crazy. 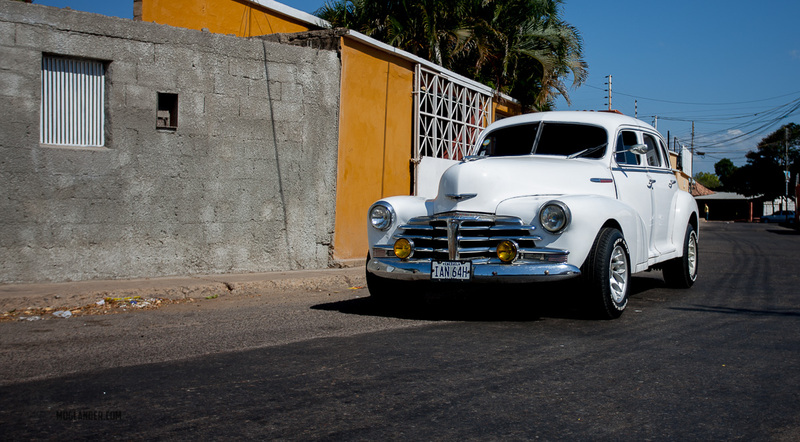 They do have a load of really nice looking old american muscle cars still in use, mainly by taxis. As fuel is almost free (more on that later), the size of the engine does not matter. Some of then are stunningly well maintained, and some look like they were robbed from the scrap yard after they were almost finished scrapping them! From here we went to the coast to the small town of Chichiriviche which is a little seaside town. 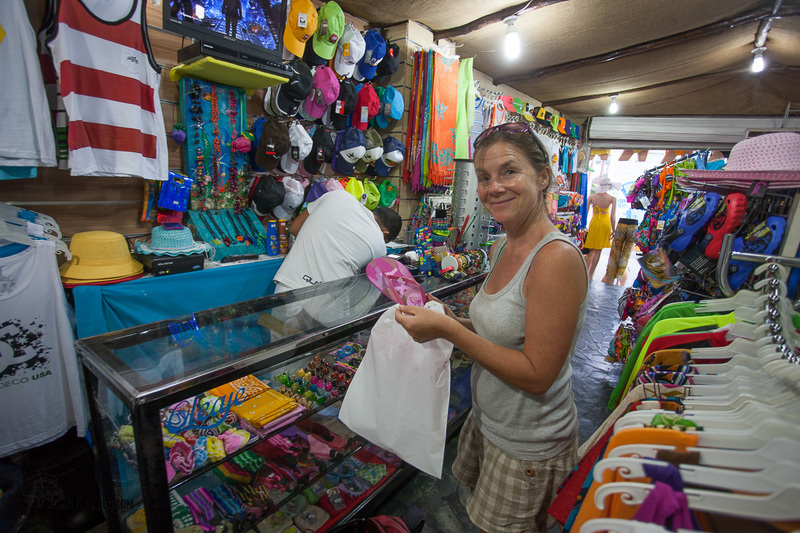 Sarah was on the lookout for a new pair of flip-flops, and this was a good place to look. We had a bit of a walk along the promenade, lunch in a restaurant, a bit of shopping, and then parked on the quiet end of the seafront. 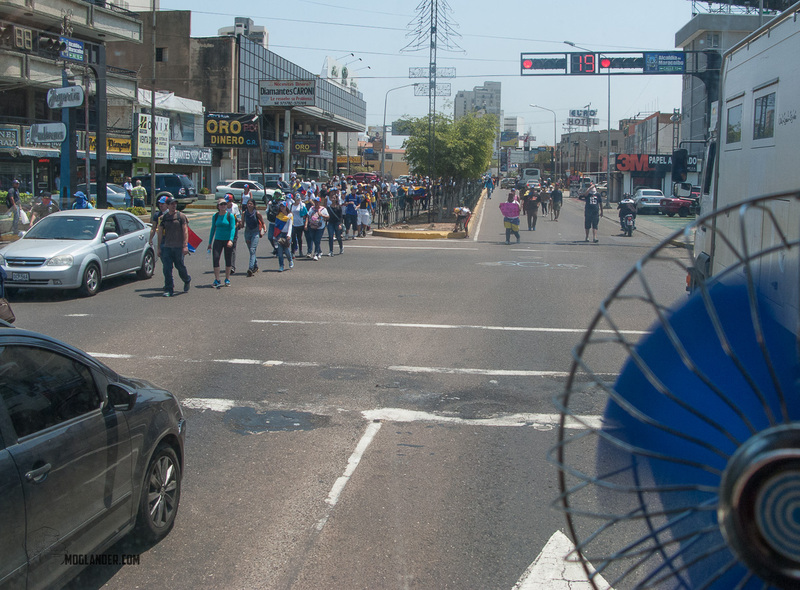 It was quiet until 10 or 11 at night, when every radio, cd player and motorcyclist who thought he could do a wheelie turned up, along with everyone else in Venezuela who wanted to watch and drink beer. We could not even have a conversation in the truck it was so noisy! Everyone was friendly enough, but we wanted to get to sleep before 6am, so decided to move. 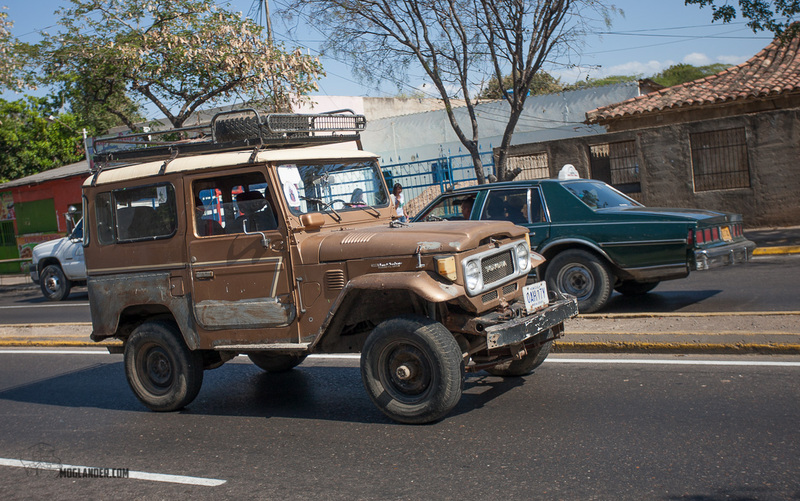 We then parked outside of David and Mireya’s Posada, and had a great night’s sleep. David had looked us up earlier in the day as he heard from another overlander we were in town. 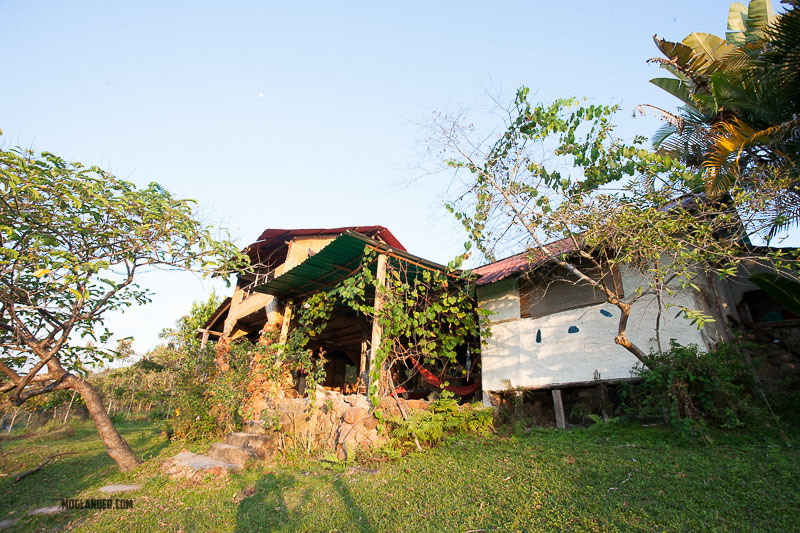 The next morning we had a look at their Posada – wow! 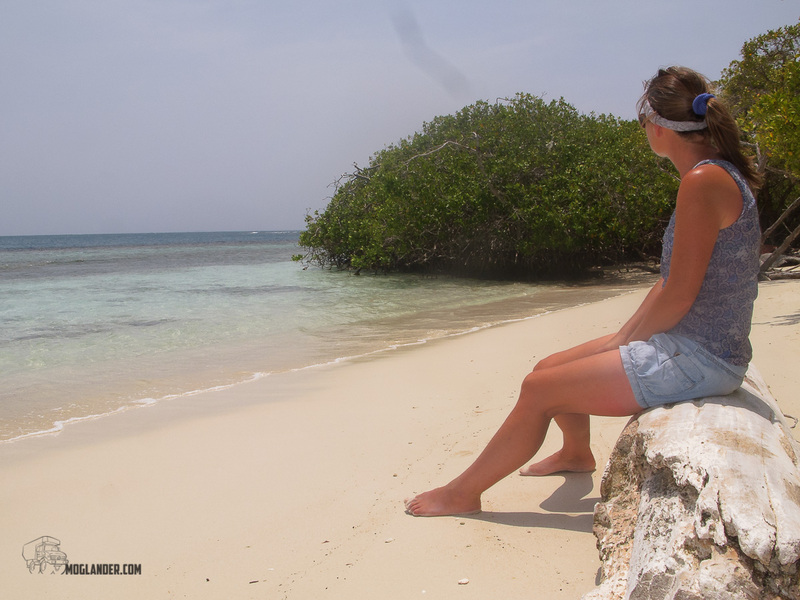 After here, we headed for Morrocoy national park, which is a set of sandy islands that you visit by boat. They were really pretty, and we enjoyed a few days exploring them. Some of the boats were stunning, quite a few well loaded people here. The showers left a bit to be desired in the privacy department. Toll booth stations with no toll booths. All free now. Our route though Venezuela skipped the big cities, This map brings us right down to northern Brasil. 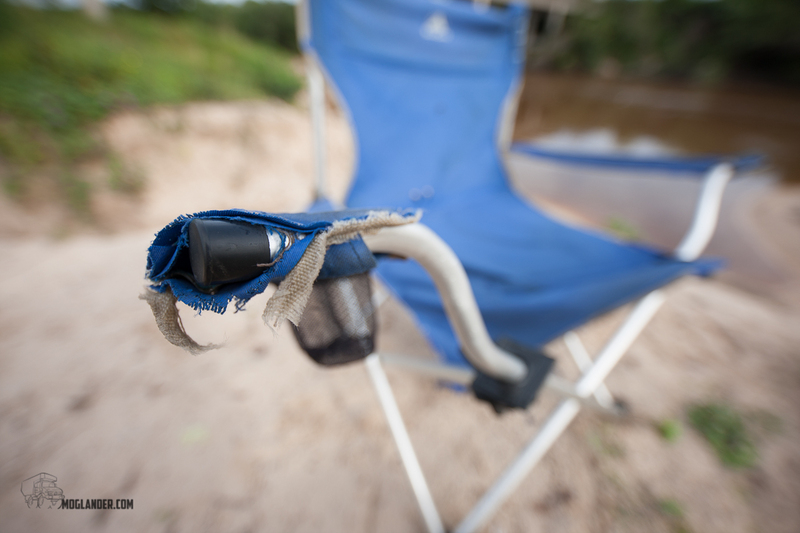 The side with the beer holder was the most worn…. 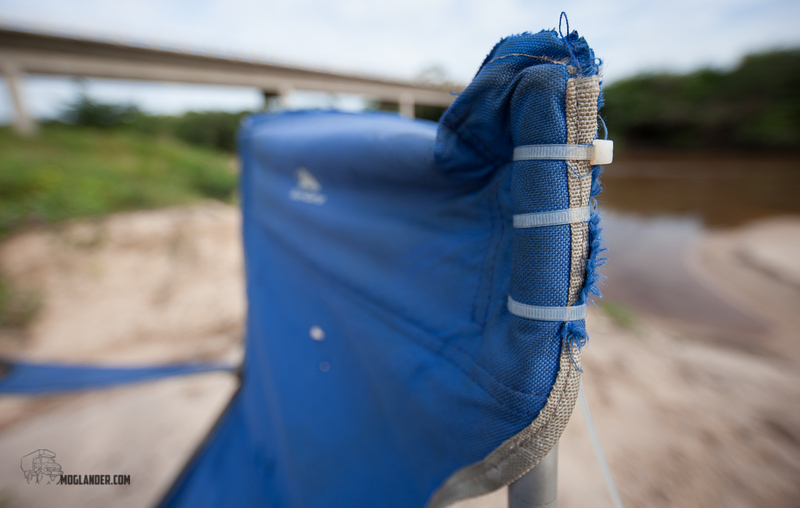 We sometimes get asked what was the biggest problem we have had to overcome on our trip. That’s a tricky one to answer, but I think the process of making the decision to go in the first place was the biggest problem. Logic and common sense are usually a part of our decision making process, but in this case they had to take a back seat, and we had to let our desire for adventure take over just a bit. Once we got by that problem, it’s all been easier since then. We have learned that you do hit problems, and we have also learned that you overcome them in whatever way you can, and usually in whatever way you want to. Once you get enough confidence that nothing is going to stop you going where you want to, for as long as you want to, in the style that you want to you are half way there. That said, we have had a few issues. Maybe more than some, but I’ll guess less than others too. 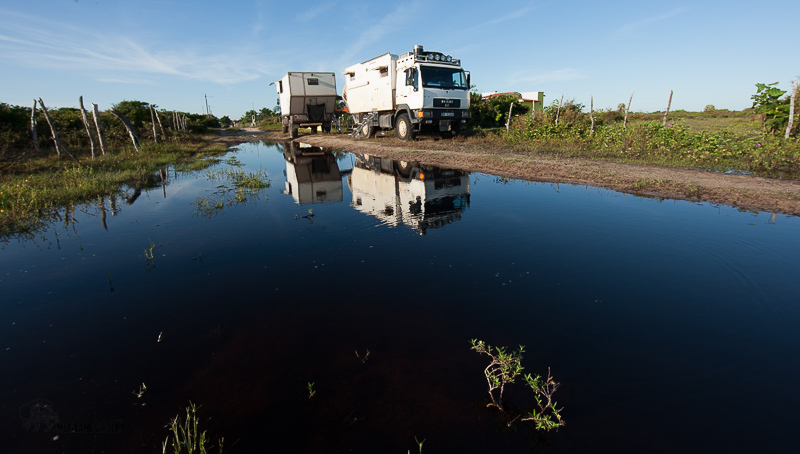 Some people do not like to talk about problems on the road, but it is part of the whole overlanding scene, and as long as we push our vehicles and ourselves to endure months or even years of cold, heat, bumps, floods, bugs, bad fuel, bad food we will have hiccups along the way. BUT, never so many hiccups that would make us want to stop. As far as we are concerned, and to quote the world famous explorer Mr. Robin Lyons, “It’s all Part of the Adventure”. Some of the problems were not things we ever expected we to have had problems with. For example, we bought a new GPS, a pretty recent model from Garmin, a Montana 600. We’ve been really really pleased with it, and it takes in open source maps, and way point files supplied by all and sundry (mainly our overlanding sage, Phil Flanagan). It does seem it has a flaw whereby the touch screen can go a bit bonkers if it’s in the heat too much. After a period of time, the touch screen protector starts “touching” the screen and your just driving along, trusting your way to this brilliant yellow box of magic and it starts hopping and skipping through various menu options, and the only course of action you have is to switch it off and cool it down. 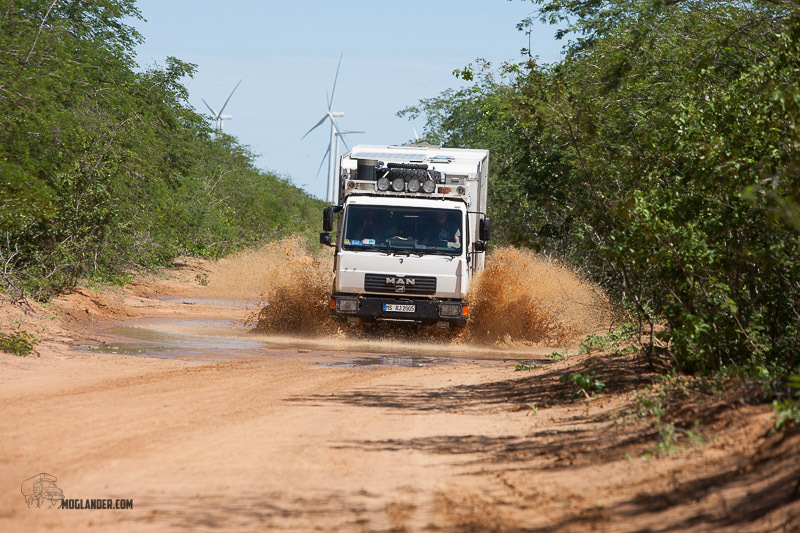 If you have ever been in the cabin of a Unimog that has been running for 6+ hours in the heat of Colombian Jungles, you know that trying to cool anything down in the cab is not going to happen quickly. We eventually just turned it on so that it would record the tracks, and we went back to using paper maps for the actual navigation. That would have been called a workaround back in my IT days, now is was just the obvious thing to do. We did find a Garmin main dealer in the city of Medellin, and we left it in for a new screen, and since we did not want to wait there for 10 days for the repair we arranged to collect it from their other office in Bogota about 3 weeks later as our route would be bringing us that way (assuming the paper map did not crash, reboot or have it’s batteries go flat). We now have it back and working perfectly. We’ve even given it it’s own sunscreen so that direct sunlight does not over heat it over and above what the Unimog manages to do. We also did not expect the battery in our Satellite phone to go dead, but it did. It seems we needed to apply a firmware update to stop this happening, but never got the communication from them. Them being a communications company – this fact did not go unnoticed!. The problem is that the battery is so flat, the phones charger circuit will not attempt to re-charge it. 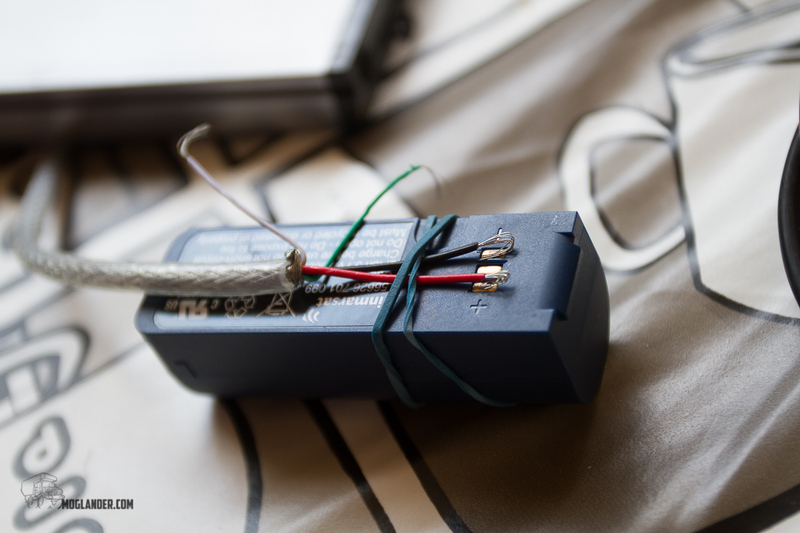 We attempted to give it a little head-start by destroying a USB cable, and working out which were the + and – wires, and attaching them to the battery directly to charge it up. This almost worked, it lets the phone start charging, but it stops charging after a minute or so. Seems it did not get the communication either. This one will have to wait until we can get a new battery – ideally pre-charged. We even had part of the Moglanders air conditioning system malfunction on us in the on position. By Malfunction, I mean that it broke. and by Air Conditioning System I mean the window wonder. And of course by “on” I mean with the window open. For some bizarre reason best known to the mechanical gods, the connection between the little round thing that the handle screws to, and the long flat bit that connects to the window to raise and lower it, decided to spring apart. It would appear there is nothing much to hold them together in the first place, so guess it was not so bizarre. 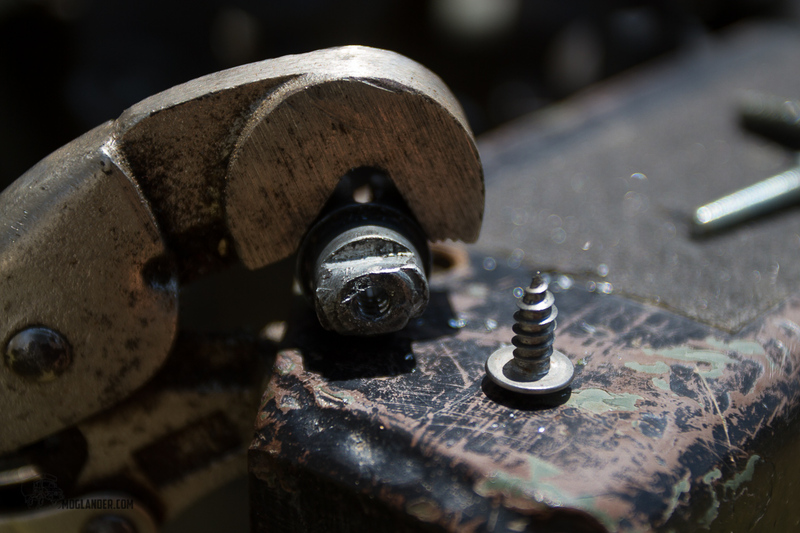 Nothing that a little bit of drilling and inserting of a self tapping screw to hold the parts together would not fix. It has been grand ever since, though we wish it had a cooler setting than “wide open”. And of course the rear hubs, which have both let us down now. 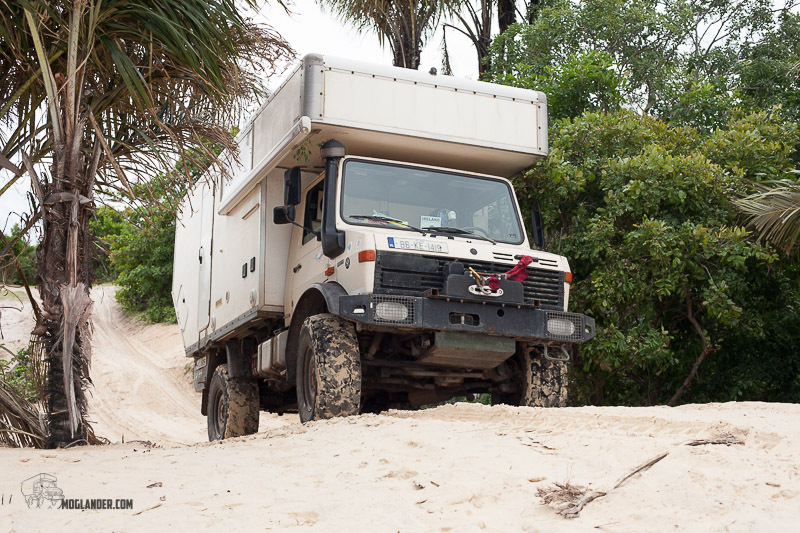 We think it’s because there is a lot more weight on the back axle than the front, or possibly the front ones should have the bearings replaced as a preventative measure but either way, Unimog hubs should not have this issue on a truck that has not made it all the way round the world. 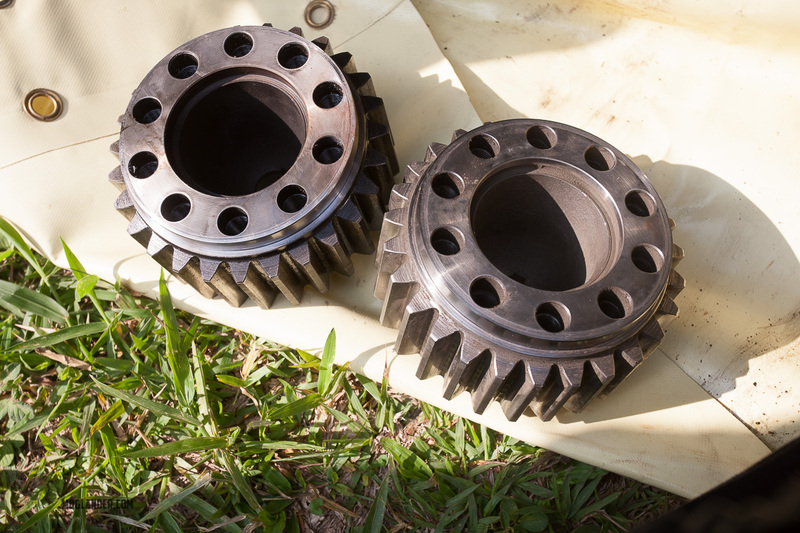 Yet 🙂 The first one we damaged in Argentina, and got a complete hub assembed in England by Atkinson Vos and shipped to us complete to just bolt on, and the second one repaired locally in Colombia by Colomba’s Mr. Unimog. Easy. What a man Luis Felippe Mendoza. See the little ring? Magic! Selection of spares we had with us. We also have had a broken window, which broke back in Bolivia. We replaced this with a bit of paper thin yellow shower door material as a temporary measure in Bolivia, and replaced that with a piece of very strong 4mm thick perspex in Peru. It doesn’t sound too strong, but the originals were only 2mm so I think it’s a lot stronger now 🙂 I’ll admit, the window does not open any more, and on some of the very hot days that is a bit of a pain, but it’s working well, and whenever we get within range of a company supplying camper windows, we will be in the queue for a new opening window. 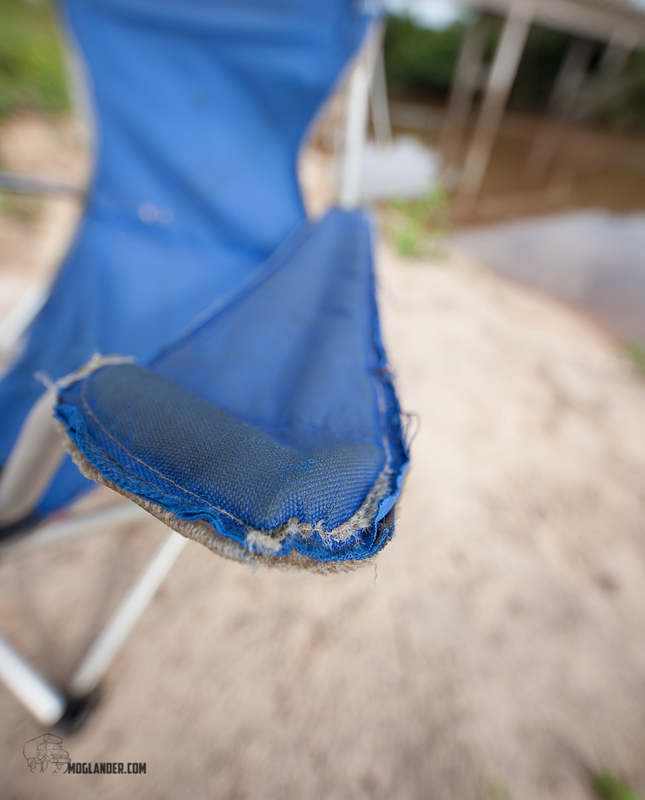 Oh, and if you want to see what 5 years of constant use does to a camping chair, this prime example is one that has been in use by us since 2011, and by the previous owner of the Mog for 2.5 years before that. Dave – I’m afraid it’s well and truly dead now! Ever lose the arse out of your chair? Other things have worn out and been replaced. 1 pair of trousers, and 2 pairs of shorts. half a dozen t-shirts have been re-cycled into cleaning rags. 1 wine glass is no more (Sorry Claire). It happens on long trips, expect it. 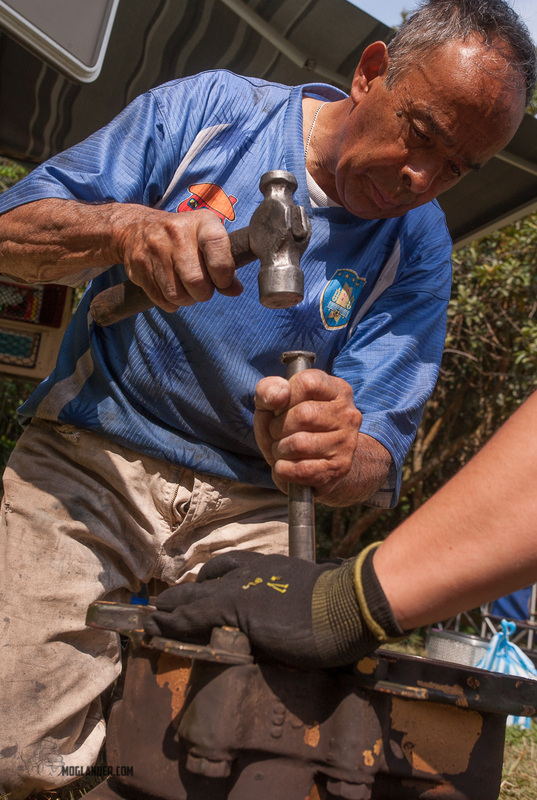 By all means prepare for it – bring those few spare parts that are hard to find, or the special sized Allen key for draining the gearbox oil that only 1 mechanic in the whole of South America seemed to have (all others used mine). 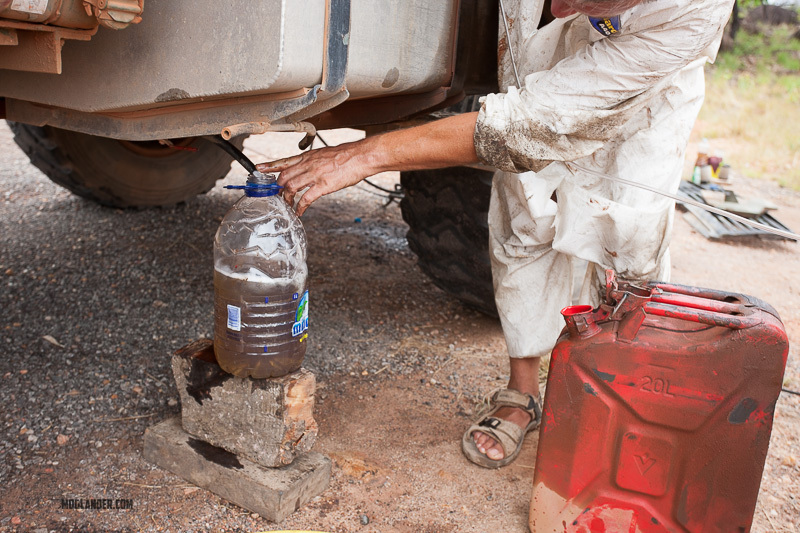 Do carry extra fuel filters because you will have one clog sometime. But all these things you can deal with, plan for and take reasonable action before it happens or after it happens. What I’m trying to say in this post is that if it can go wrong, it does not mean that it will go wrong at some point. Or maybe it will. Who knows? We never thought we would have a gps touch screen go funny, or for Merv to wear a hole in the seat of his carhartt work jeans, but it happened. Its certainly not a good enough reason to not go in the first place! 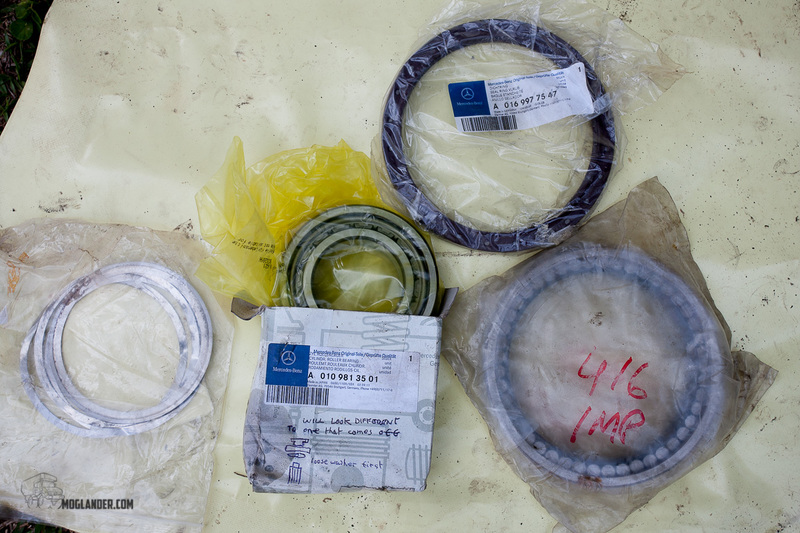 We carry a nice set of tools, a reasonable set of spare parts and a large jar of cop-on. So far, the cop-on has been the most useful, even if I default to using the tools first and the cop-on second, it still is the best thing we have with us. Most of all, do not worry about problems. After all, they are just Part of the Adventure.